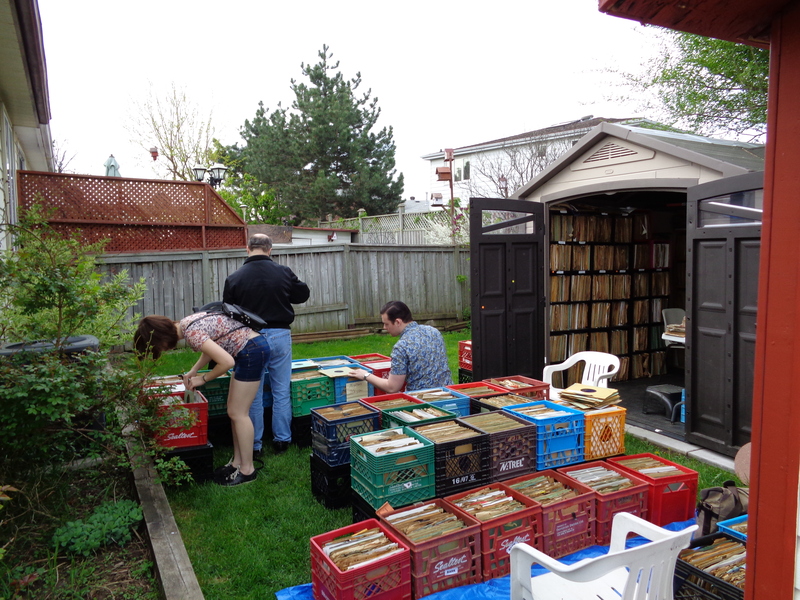 On May 28th and May 29th, 2016, the first record sale of 2016 occurred at our premises in Brampton, Ontario. 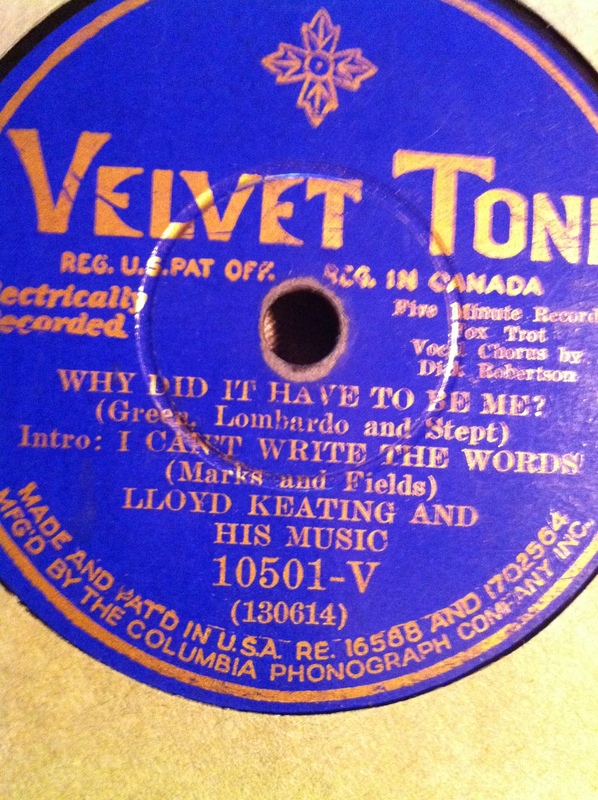 This was a test sale for our newly added LP category, which tops 5,000 in number. 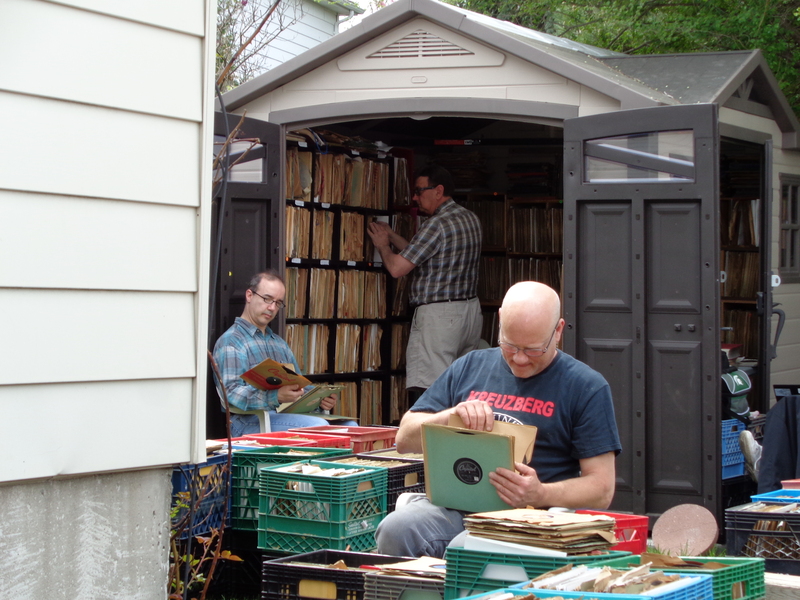 It was a great success, as record collectors from the Greater Toronto Area, and from Montreal and Michigan converged. Here are some photographs from that event. 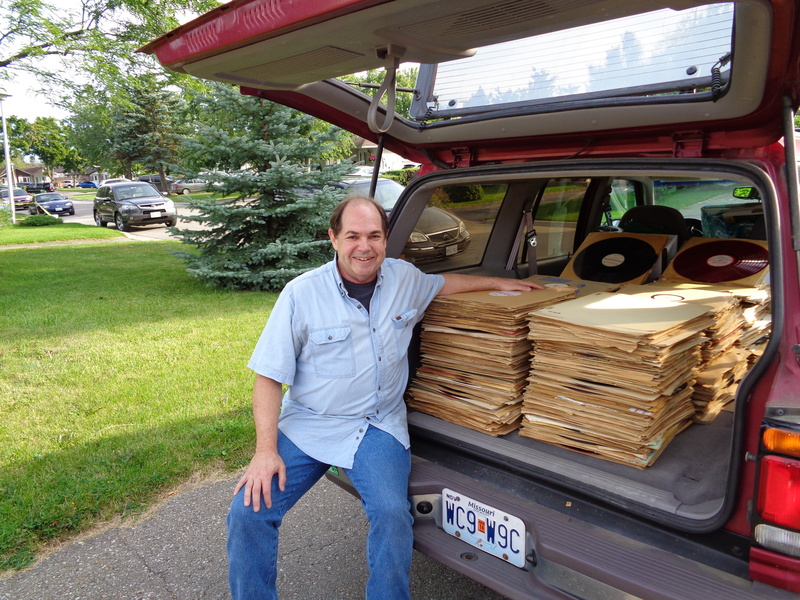 Brampton music afficianado Ken McPherson with his collection of thousands of 78 rpm records, many from his favourite jazz eras – the 1920s and 1930s. 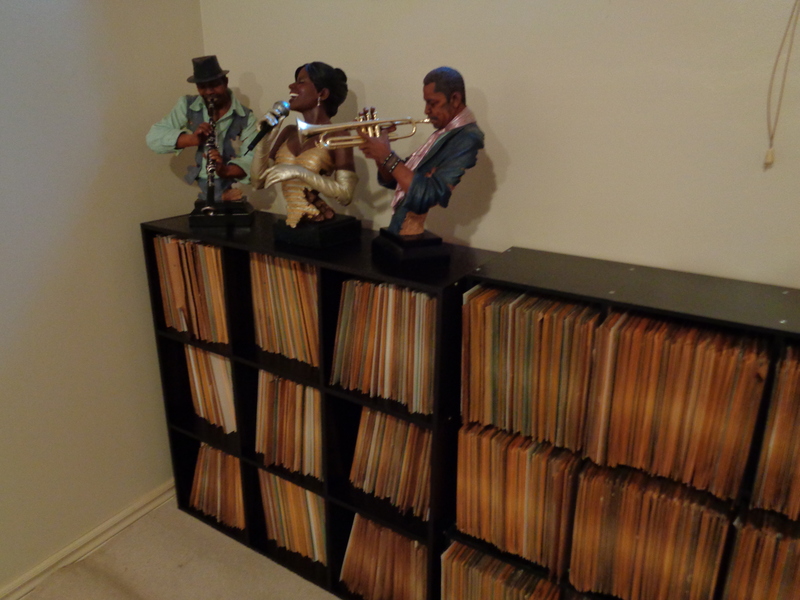 Brampton man’s passion for jazz music fuels his hobby for collecting records. 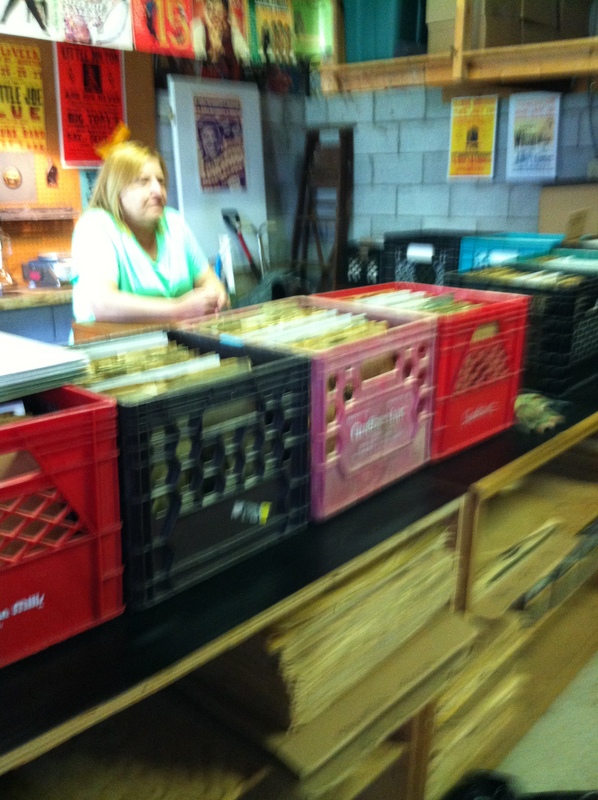 Hidden away in the town of Gravenhurst, Ontario is one of the most unique record stores I have ever come across, Currie’s Music And Antiques. Located in the heart of the town on Muskoka Rd. 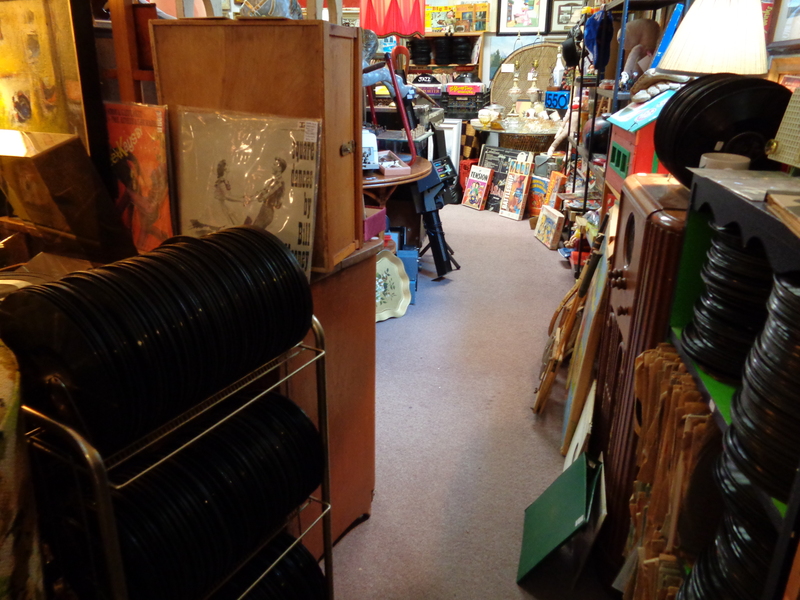 North, the store was originally an old movie theatre that was converted into a place to find records of all speeds, guitars, a recording studio, and many antiques. 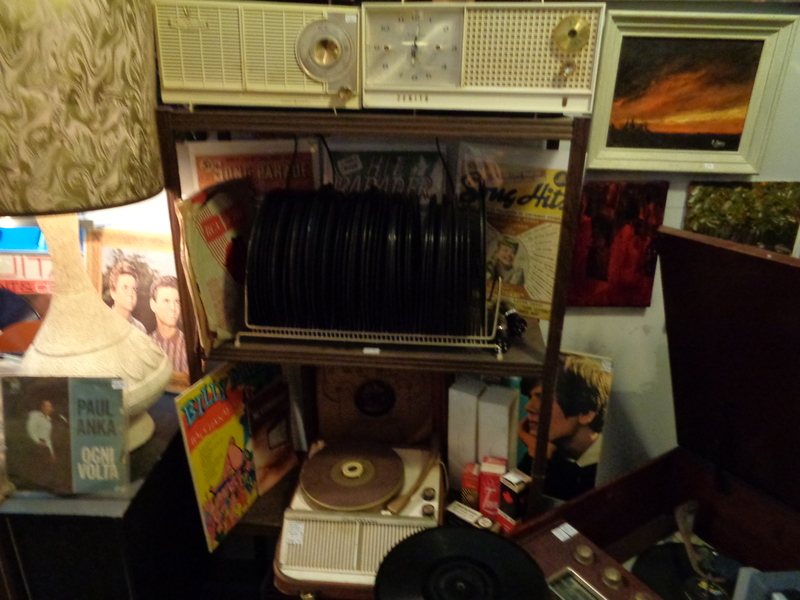 We took the trip north to this one-of -a-kind store on Saturday, June 13, 2015, and were amazed. 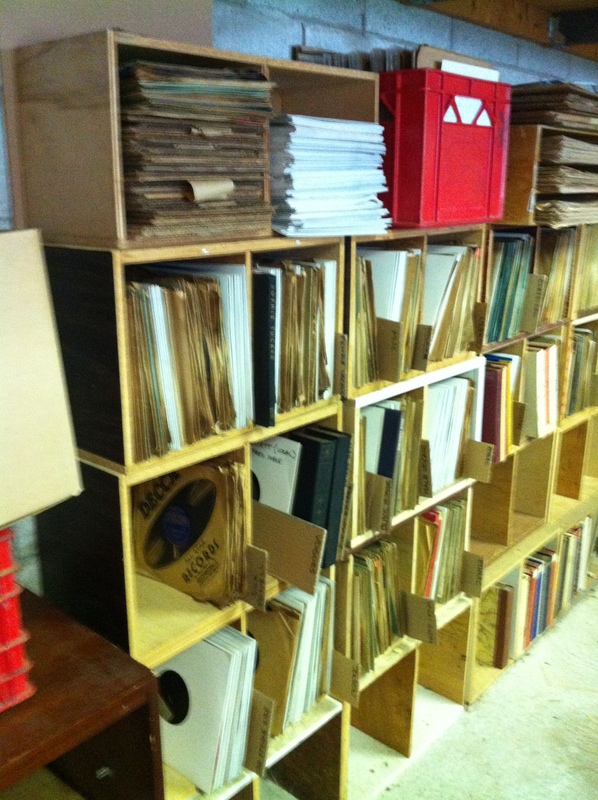 There are well over 2,000 78’s in the record room, 45’s galore, and for vinyl lovers, a good selection of all types of music. 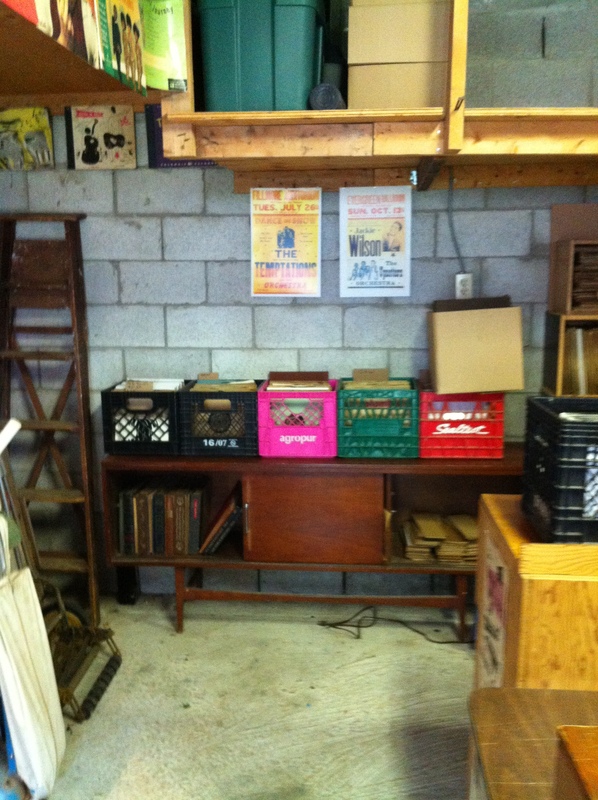 A history of this store has been copied from their website, with the permission of the owners. 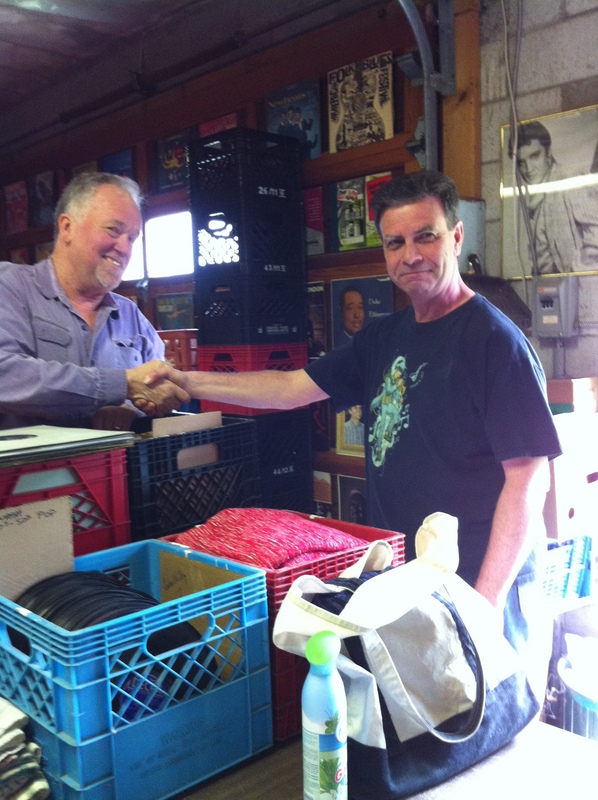 Described by many travelling musicians as “my favourite store, ever,” Currie’s Music & Antiques is choc-o-block with some of the most interesting old guitars and stringed instruments you will find anywhere, as well as drum kits, vintage amps, cowboy boots and western shirts and stacks of hand-picked vinyl. 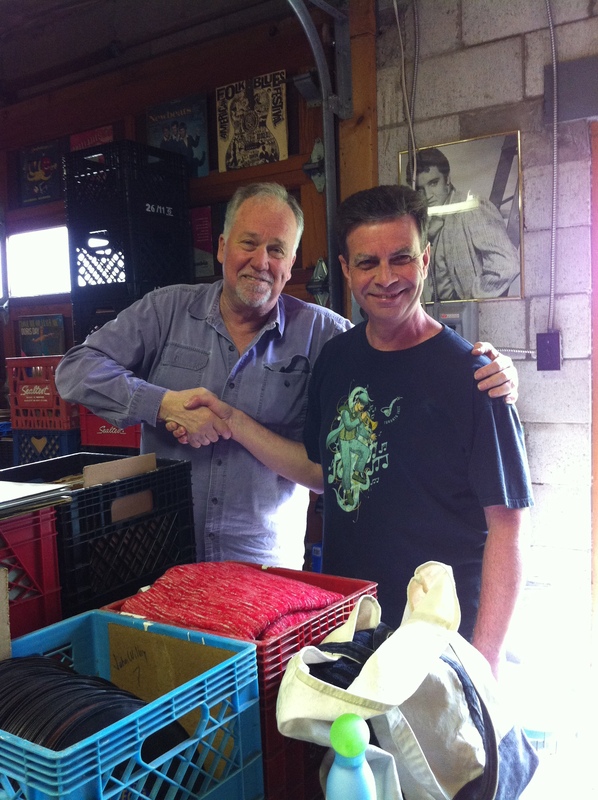 The son of long-time antique dealers: Ted and Suzanne Currie, Andrew fell in love with the business of buying, repairing and selling vintage guitars as a teenager. 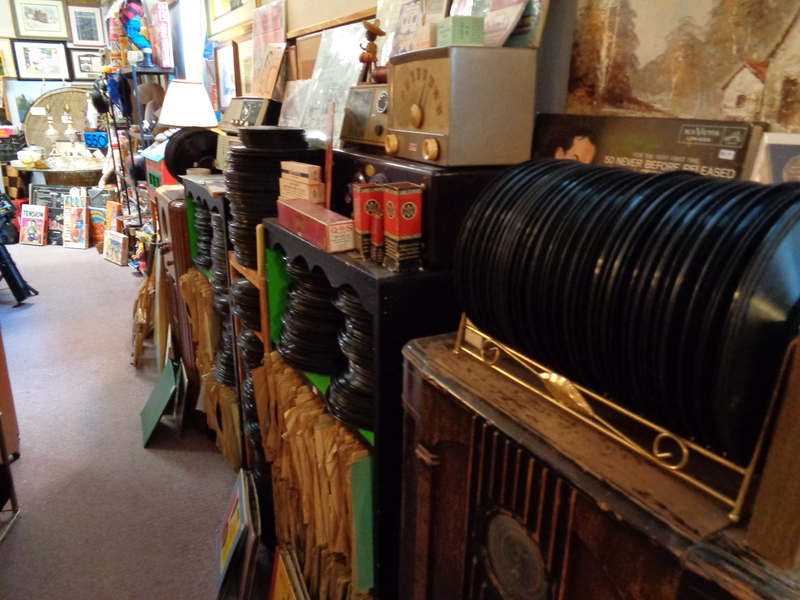 A business that began with tiny booths set up at antique markets and trade shows turned into over six rooms of vintage and pre-loved musical instruments, and a name that is known by players far and wide. A careful expert when it comes to repairing and rebuilding classic instruments, Andrew has brought many an old Gibson, Harmony, S.S. Stewart or Kay guitar back from to life after years of neglect, and made it sing. With a discerning ear, Andrew began working as a live-sound engineer in High School and to this date has controlled the sound board for over 3000 performances at venues such as Peter’s Players, The Gravenhurst Opera House, The Kee to Bala and many concert halls around central Ontario for acts as well known as Johnny Winter, Big Sugar, The Yardbirds, The Tragically Hip, 54-40 and Taj Mahal. 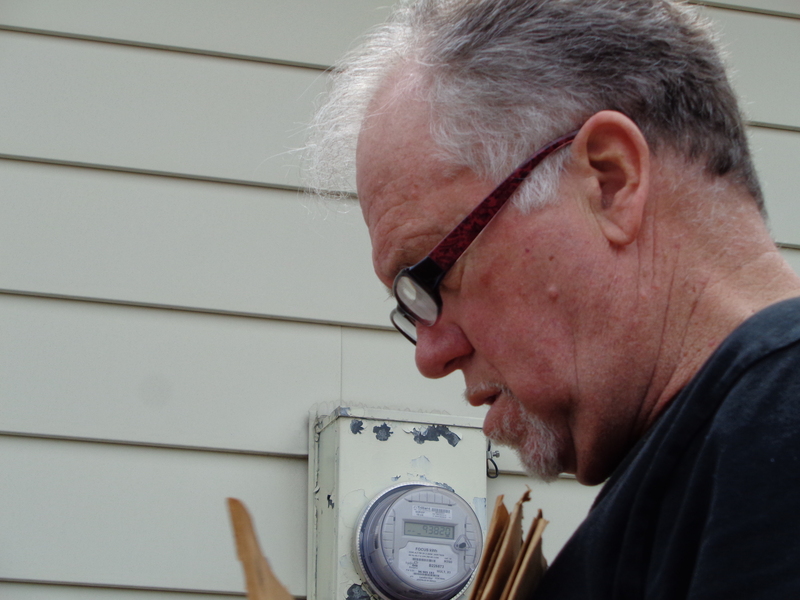 Andrew acted as Technical Director for four of Muskoka’s best-loved concert venues for several years. 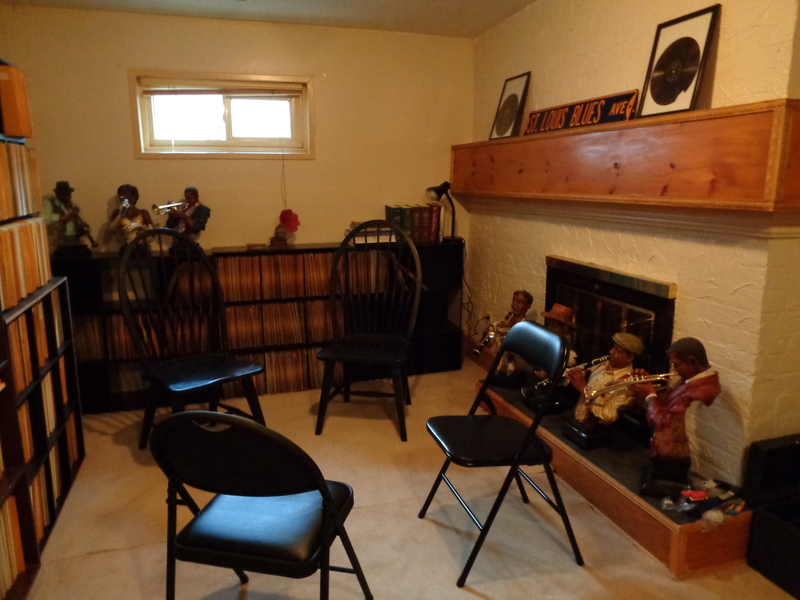 All of this aside, Andrew is first and foremost a musician – and boy can he play. 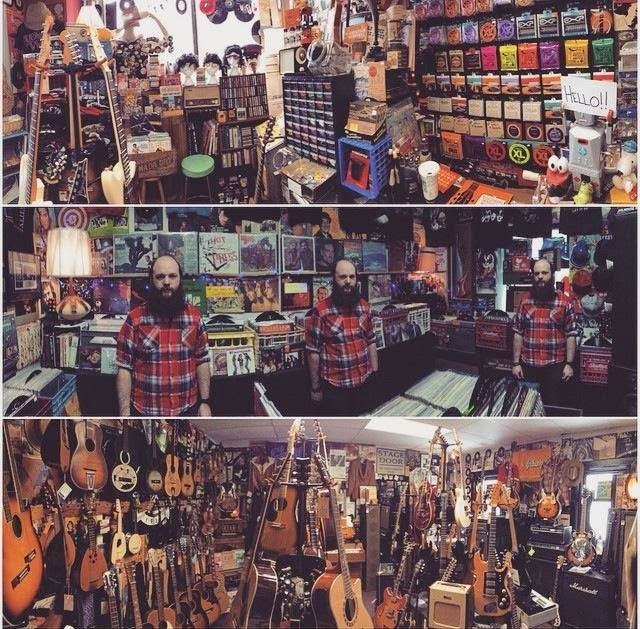 Let him pluck the strings of your favourite guitar in the shop, or hear him rip it up as a bass player of drummer on a local stage and you will see for yourself where the passion begins. 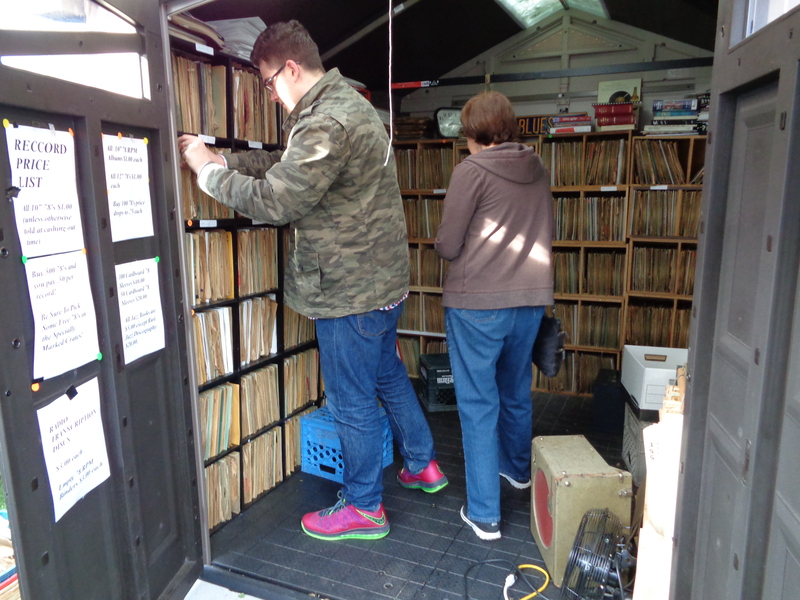 The extensive vinyl selection in Currie’s Music is cared for by Rob Currie – another extremely talented musician, and recorded-sound aficionado. More about Rob can be found on the “studio” page. 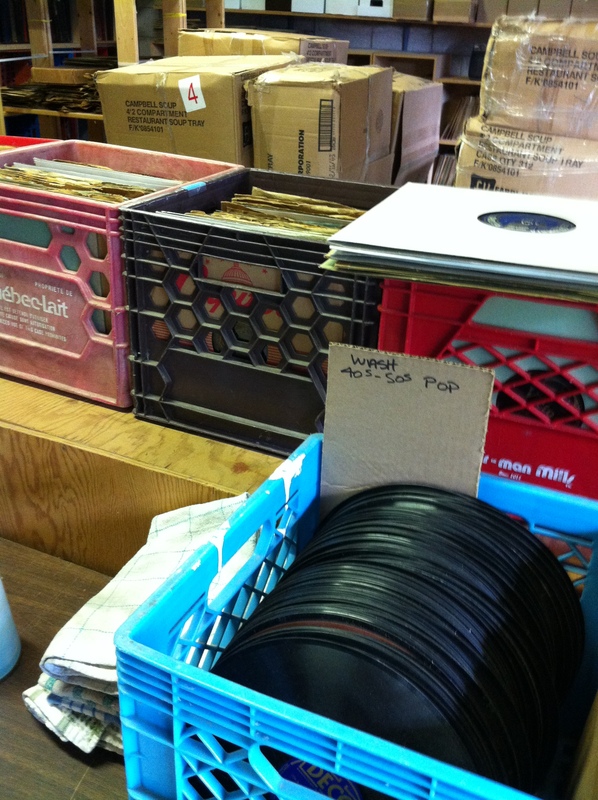 The photographs below show that a trip to this store can be very exciting for record collector’s. 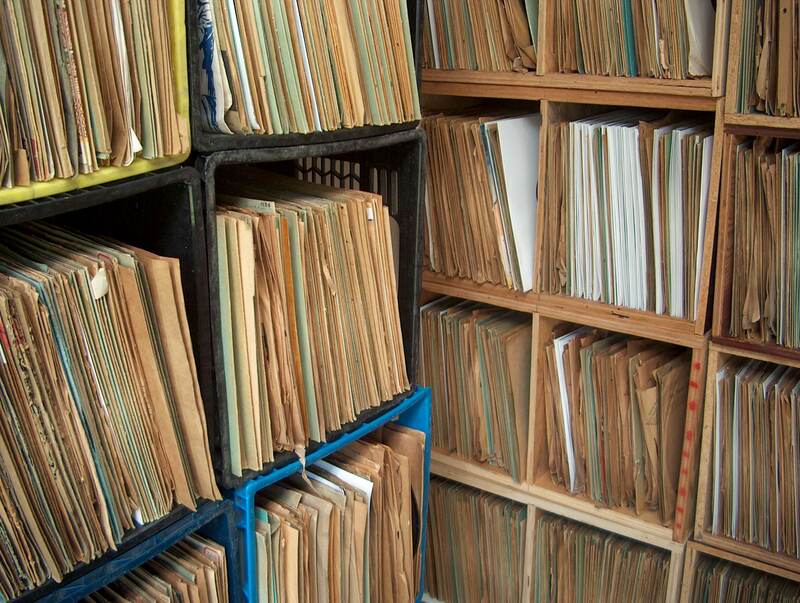 On May 16th we held our first sale of over 25,000 78’s and 30,000 45’s. 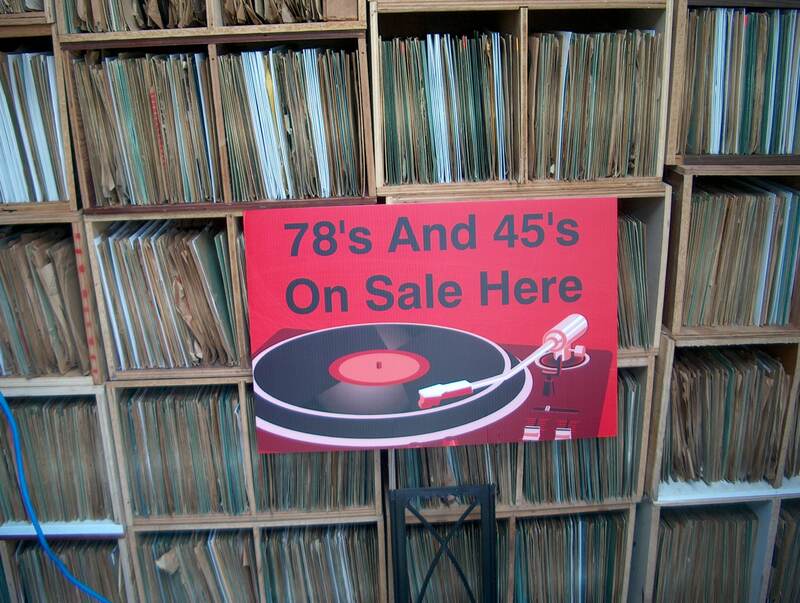 Here are some pictures of the 78’s and those people who attended. 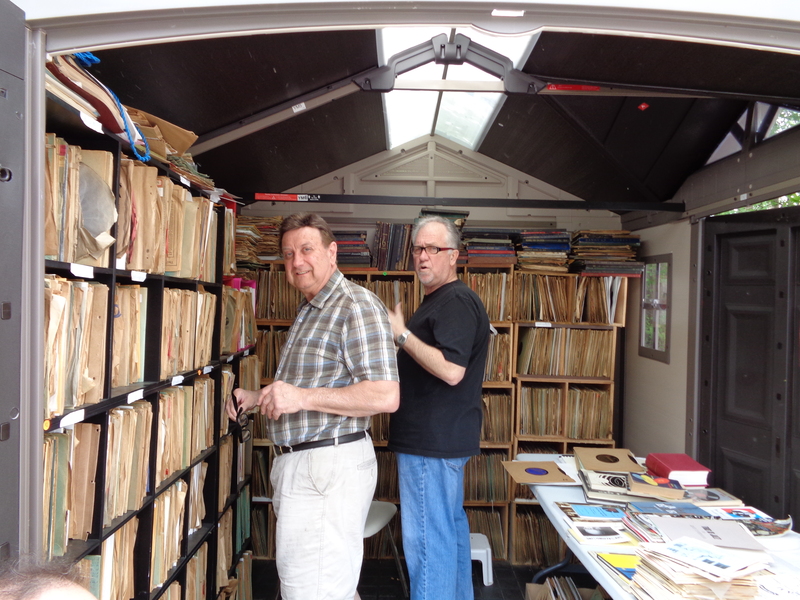 Record dealer’s Don Keele and Martin Koppel of Kop’s Collectables were amongst those who picked up some records! 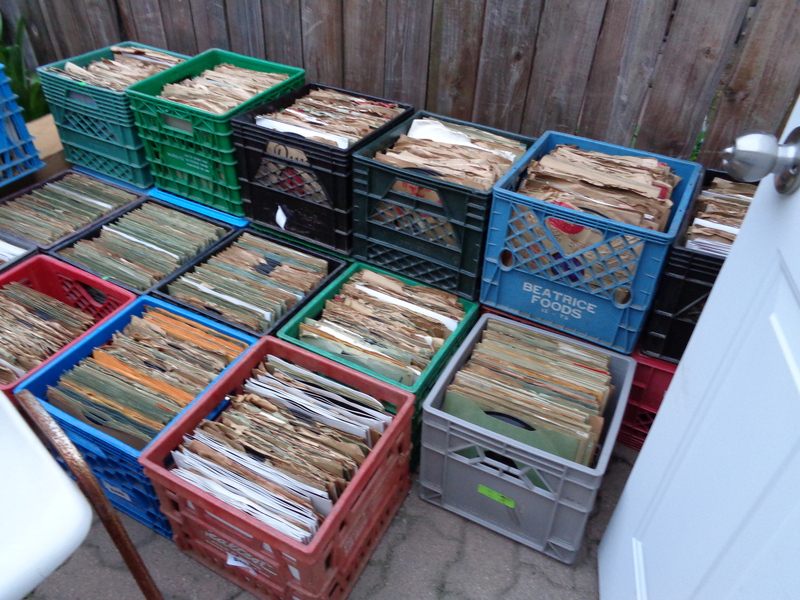 Here is a report on the 44th Canadian Collector’s Congress held in Toronto on Saturday, April 25, 2015, courtesy of Jack Litchfield. 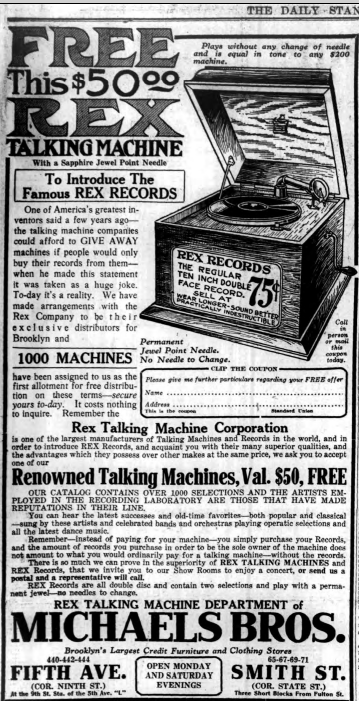 The furniture and clothing department store, Michael Brothers, inserted the following advertisement in The Daily Standard Union newspaper of Brooklyn, N.Y. on October 15, 1915 introducing the new Rex record, which could be played on the Rex Talking Machine. 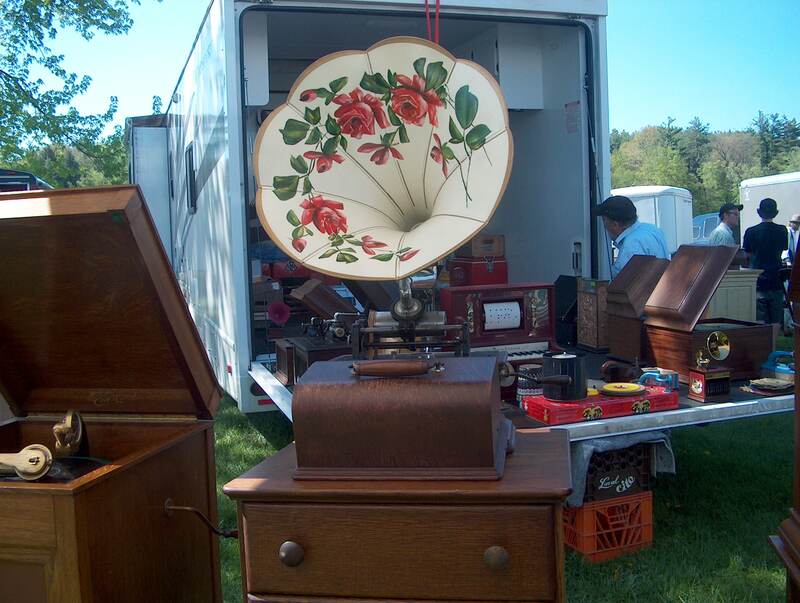 There is another advertisement on this blog for the Rex phonograph. 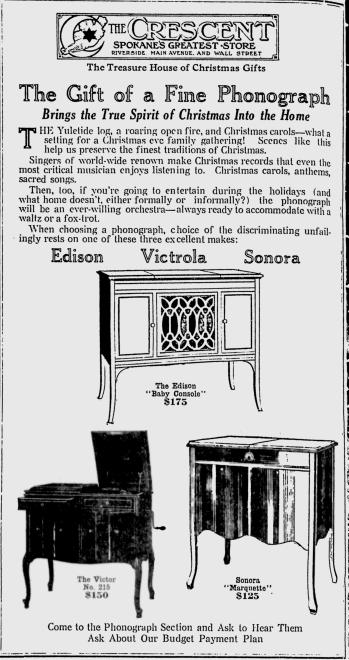 An interesting advertisement for The Supertone Phonograph appeared in the Schenectady Gazette on October 16, 1919, posted by the local Carl department store. Here is that advertisement, below. 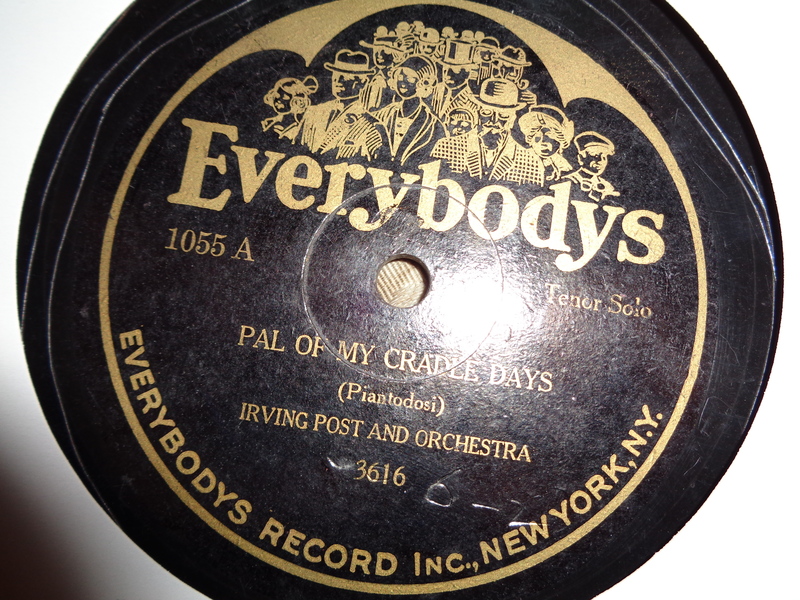 Back in the early 1970’s I fondly remember taking my father to the now defunct Chicken Deli in Toronto one evening to see the great Earl “Fatha” Hines play piano. 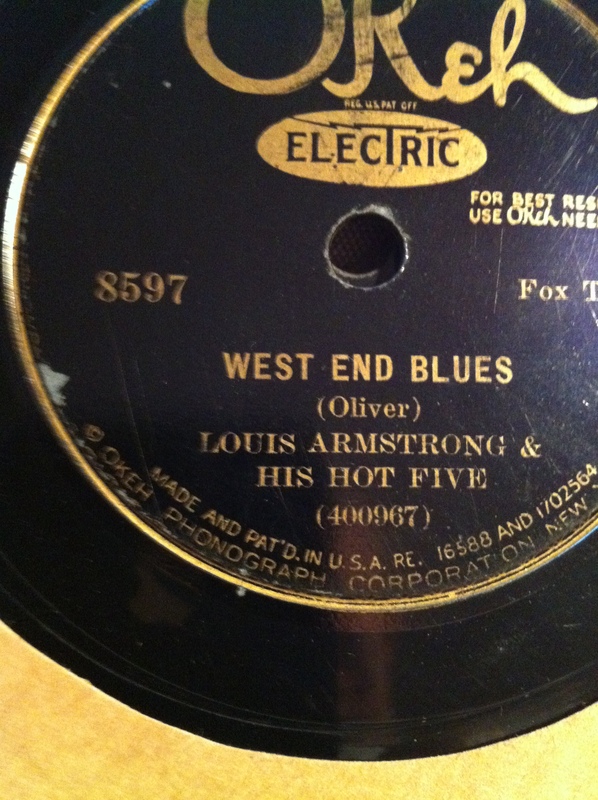 Since then, I have long admired his styling, as he was known for his great technique and talent for improvisation, horn-like phrasing, and a rhythm which influenced popular jazz throughout the swing era and into bebop. 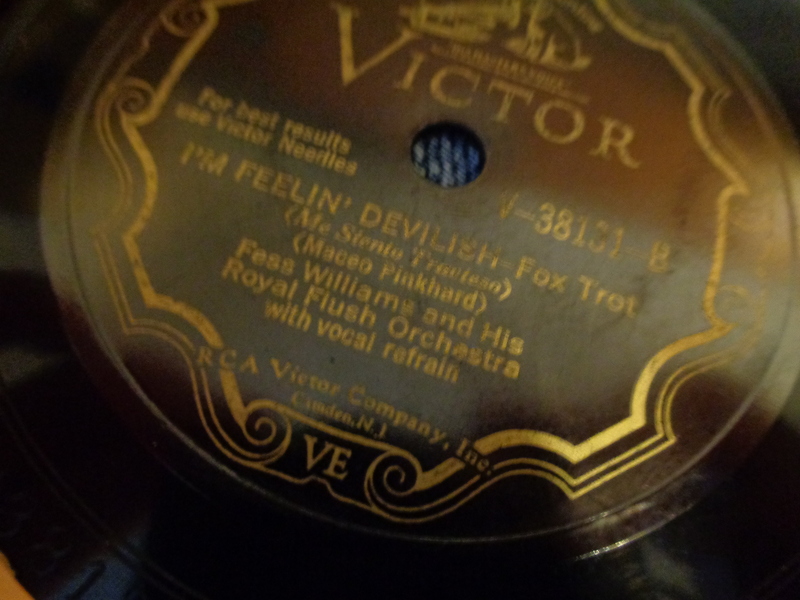 One of my favorite Hines recordings is “Sweet Ella May” recorded on Victor in 1929, and we hear Hines providing the vocals and solos on the piano. 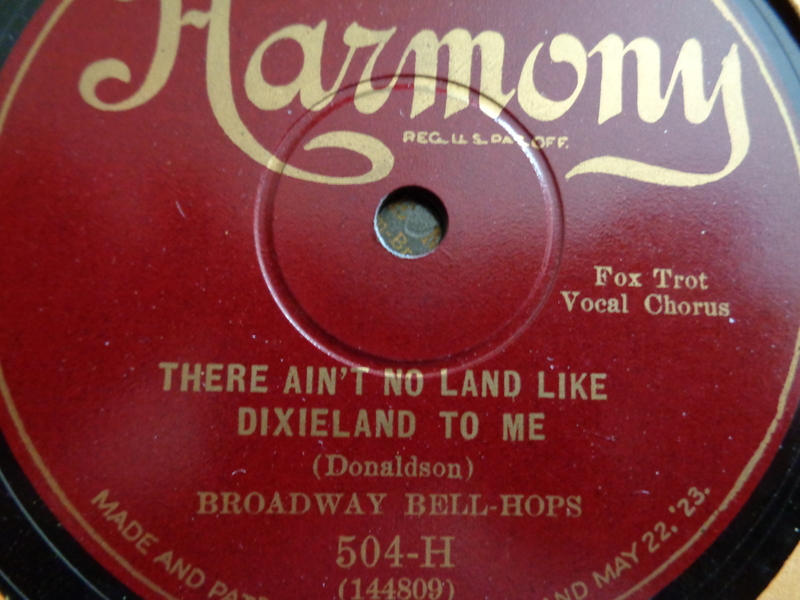 Here is a great little territory band that recorded sides with Victor. 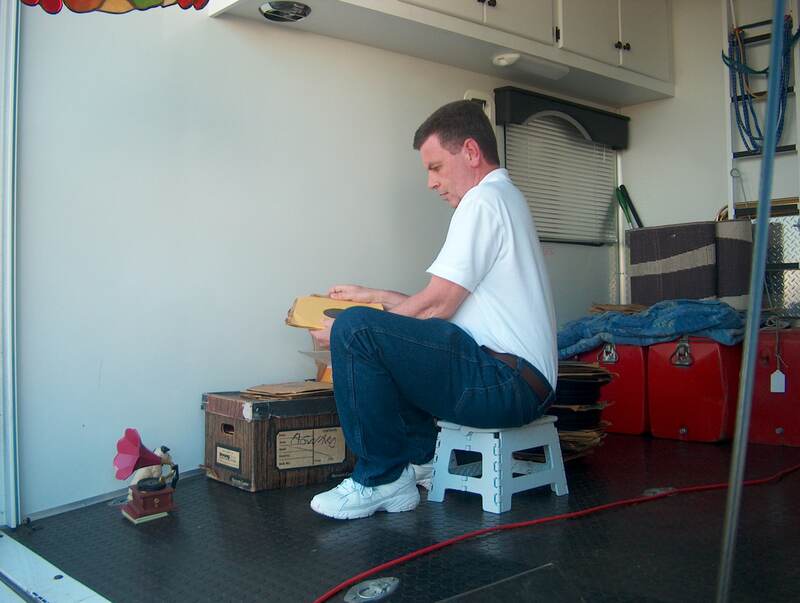 The personnel include Tony Almerico or Irwin Kunz-c/? 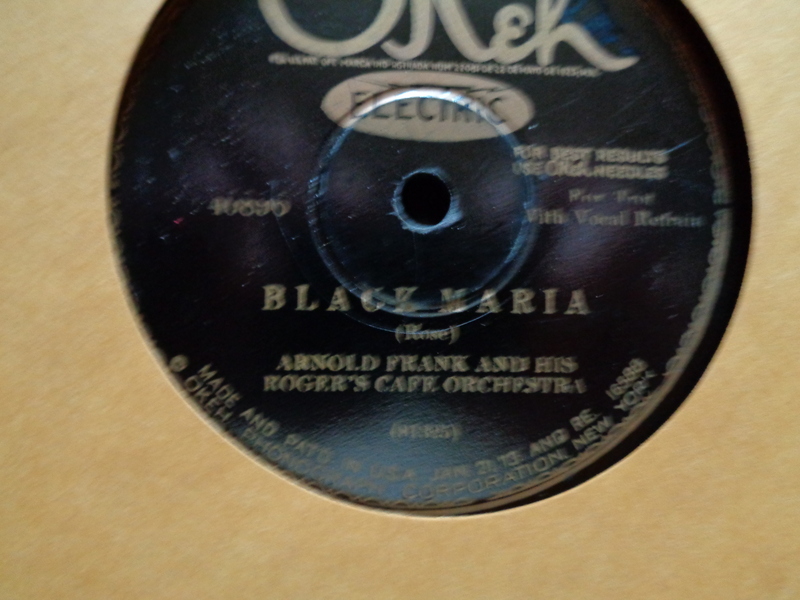 Blue Steele-tb/Sidney Arodin-cl/Terry Shand-p/Mart Britt-bj/? sb/? 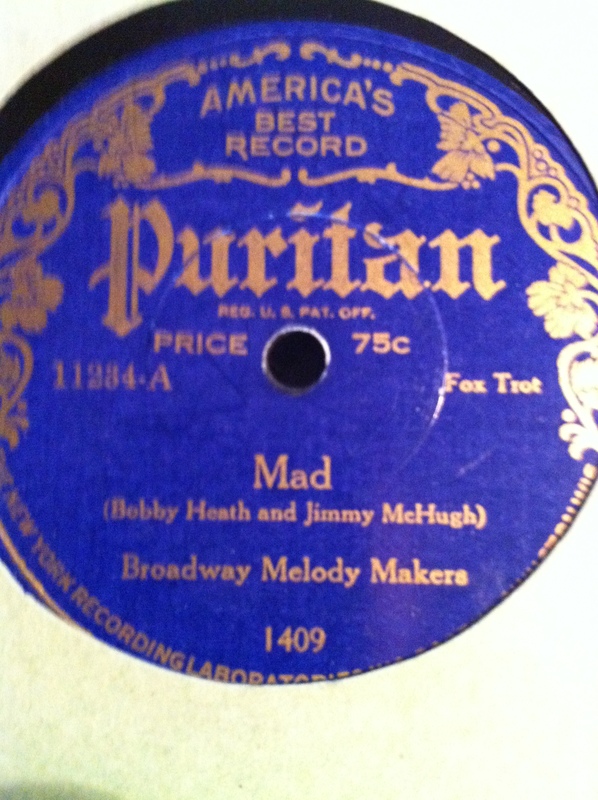 d. Memphis, September 14, 1928. Vic 21760. 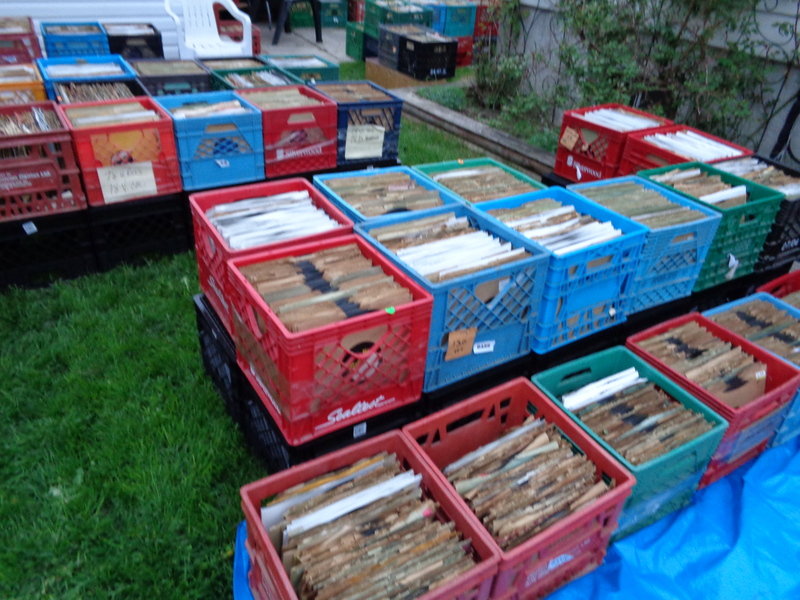 The forty-forth Canadian Collector’s Congress will be held in Toronto, Ontario, April 24th to April 26th, 2015, with the main presentations being held on Saturday, April 25th at the Toronto Plaza Hotel. 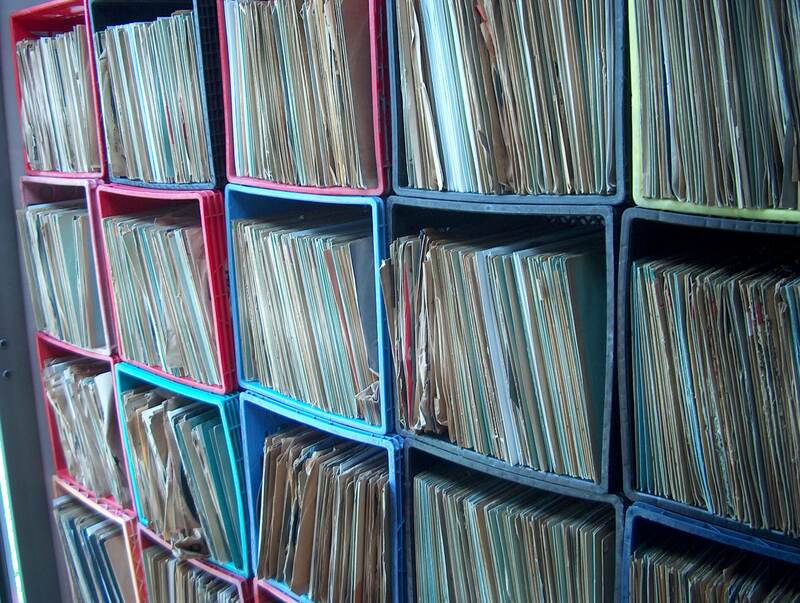 There will be an opportunity for you to present your research or discography findings in the morning session, followed by three major presentations in the afternoon. 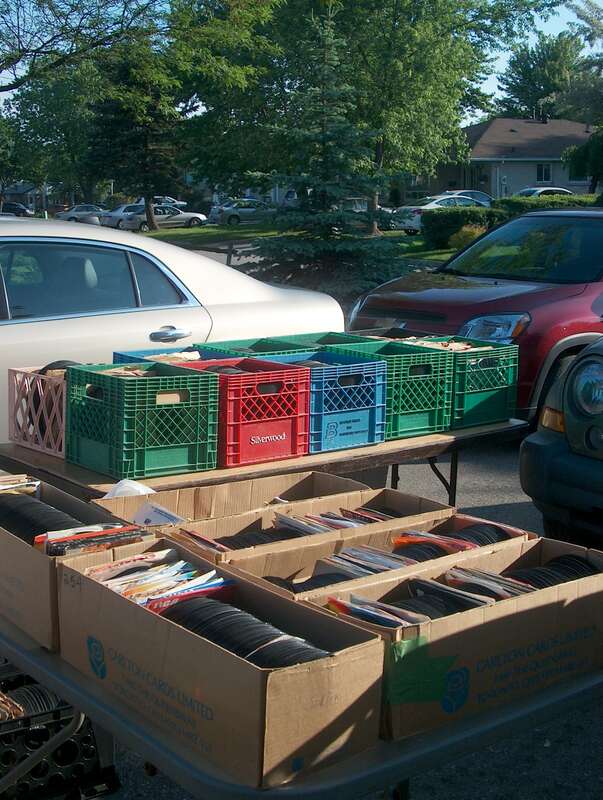 In addition to this, there will also be a room provided for record sales, and open houses held on both Friday and Sunday. 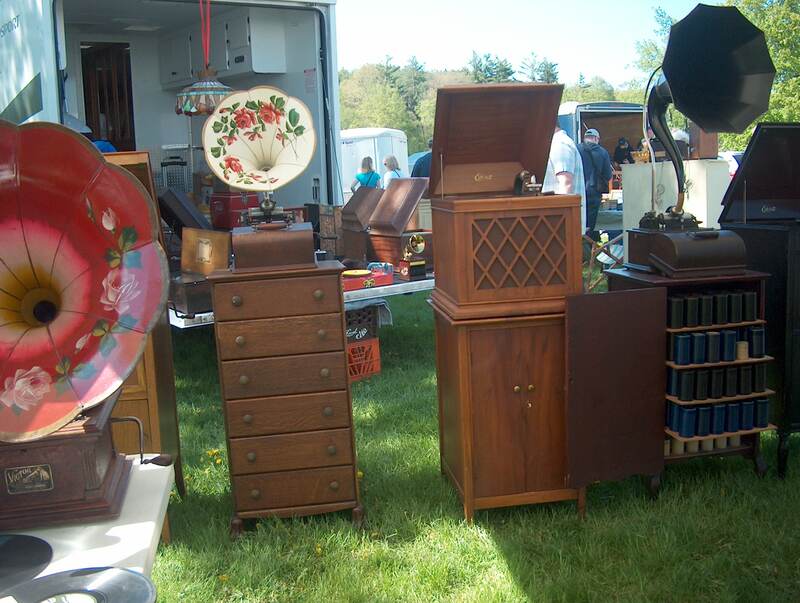 A continental breakfast, lunch and diner are included on Saturday. 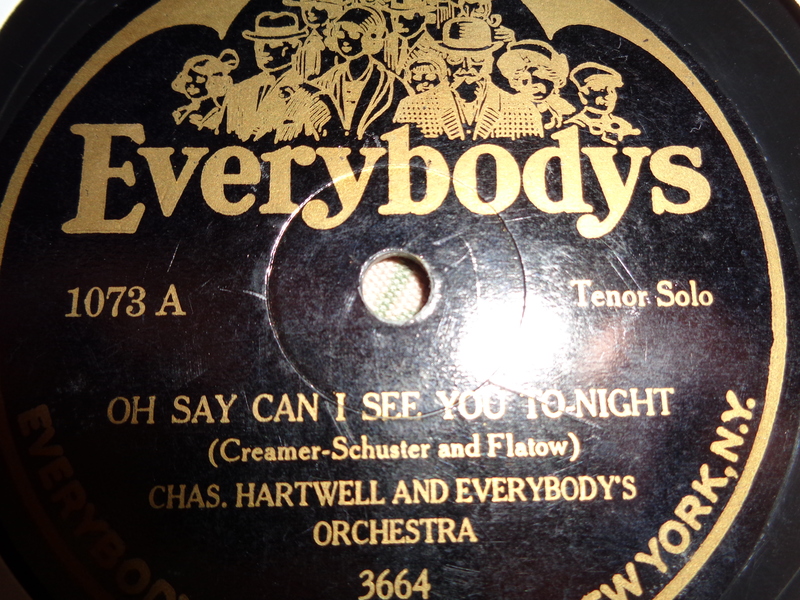 On Saturday evening, you may play and discuss a record where the director/leader of the band is a pianist. For your convenience I have uploaded the following attachments for more information. 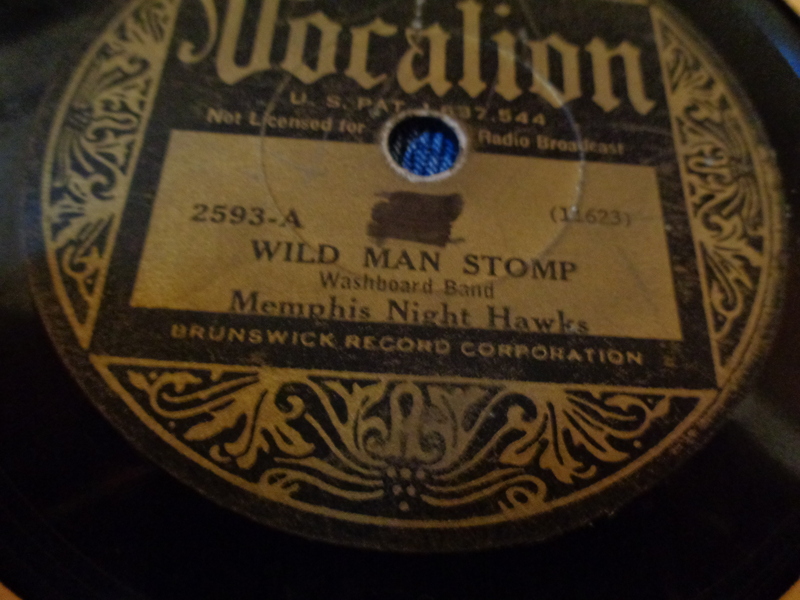 Some of you may recall that I buy and sell 78 rpm records as a hobby. In 2014, I held 3 sales, and this year, I hope to increase that to 5. 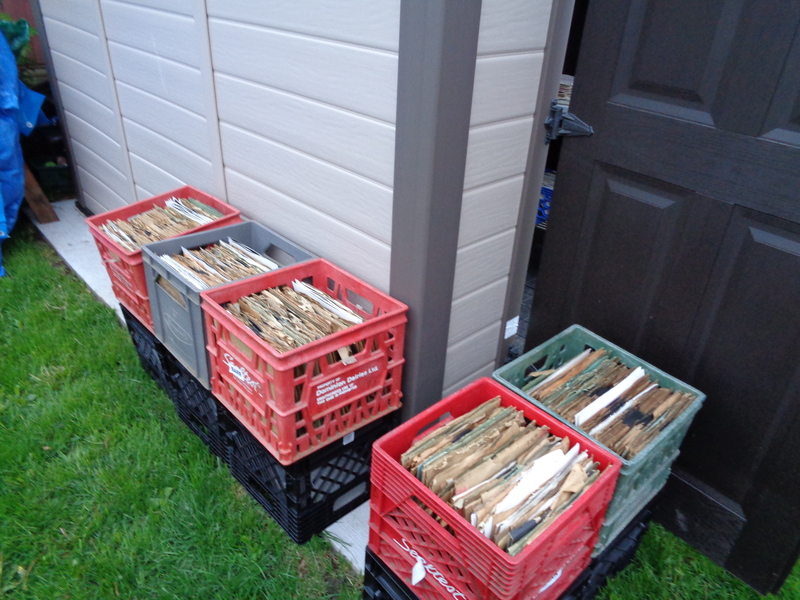 So, with that in mind, and the weather starting to get back to the warmer temperatures that we all love, I am announcing that on Saturday, May 16th, between the hours of 8 a.m. and 4 p.m., my partner and I will be selling over 20,000 78’s, and about an equal amount of 45’s. 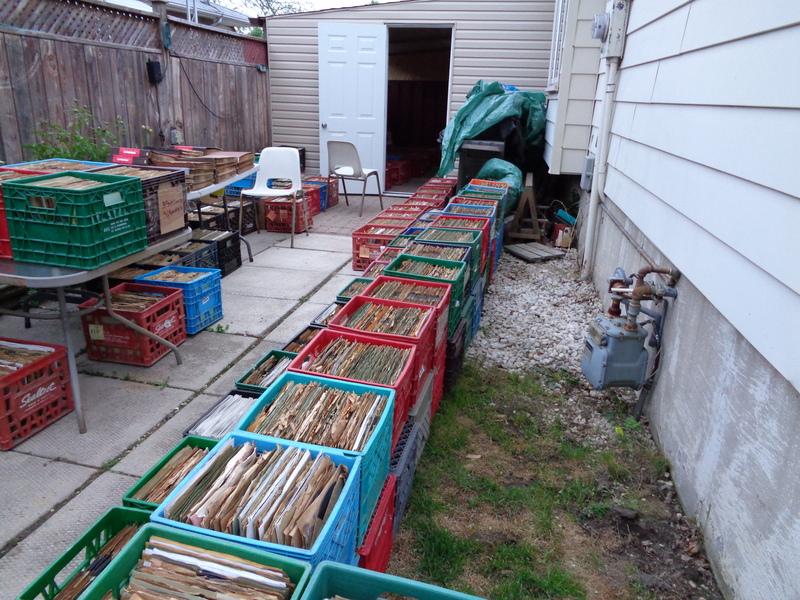 The sale will be conducted at my residence in Brampton, Ontario. If you wish further details, regarding the exact address, or directions, please message me at: kennethmcpherson@hotmail.com, and I will be happy to respond. In the meantime, let’s look back to last year’s event photograph’s, as posted below. 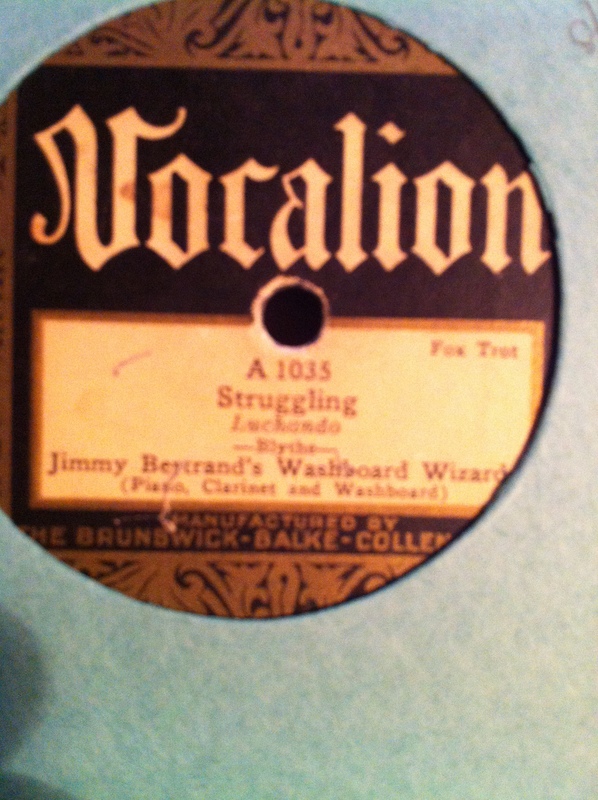 Here is the second installment of the Victrola and 78 Journal, edited by Tim Gracyk, in the Fall of 1994. 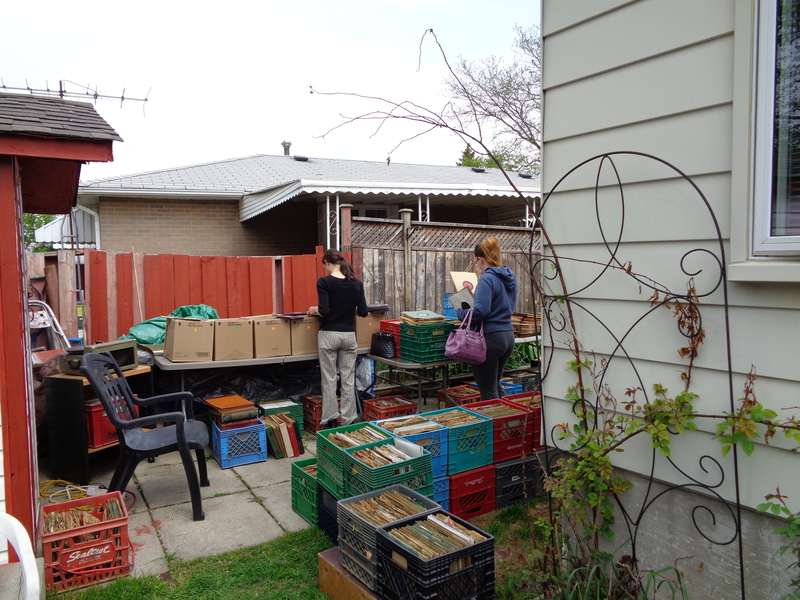 The first issue can also be found on this blog. 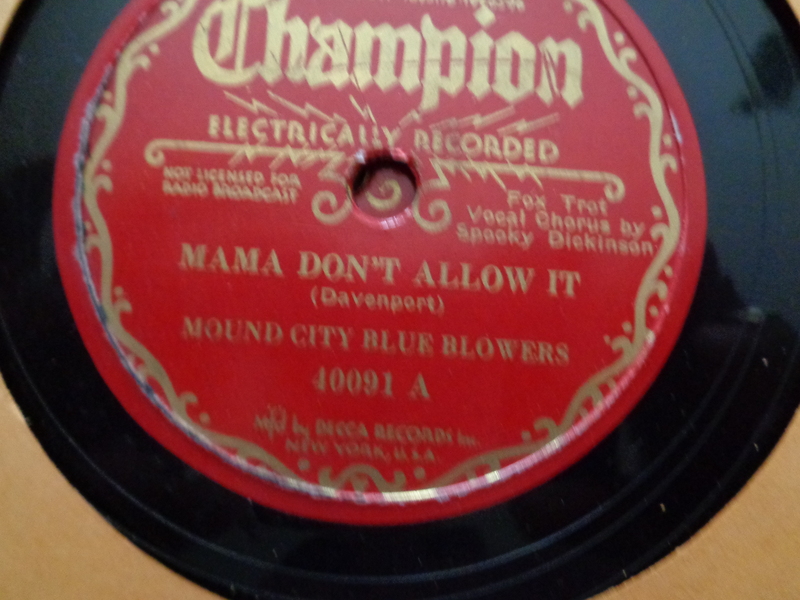 It has been well over a year since I last published a record of my own 78 RPM collection, which is primarily made up of Jazz, hot dance bands, and, not so hot dance bands. The updated list has been uploaded, and you may examine it below. 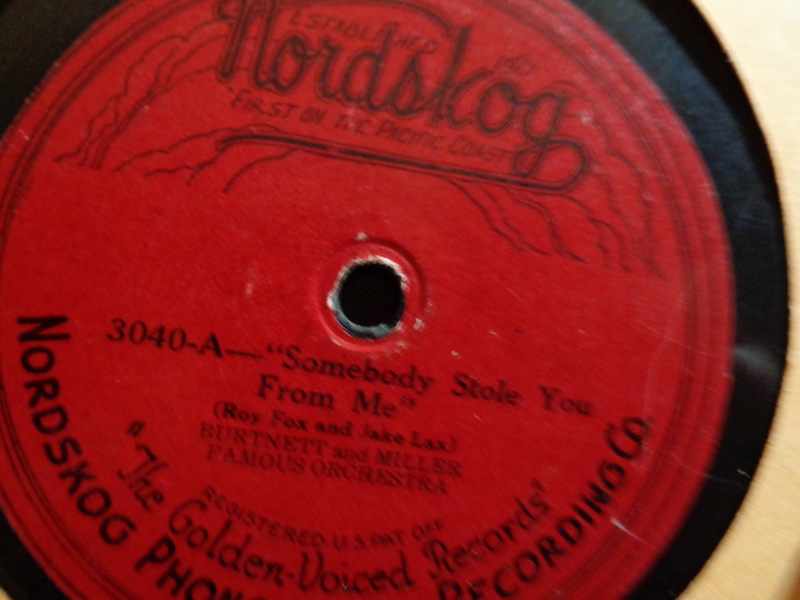 I recently acquired a west coast recording on the rare Nordskog label, performed by the Burtnett and Miller Orchestra. 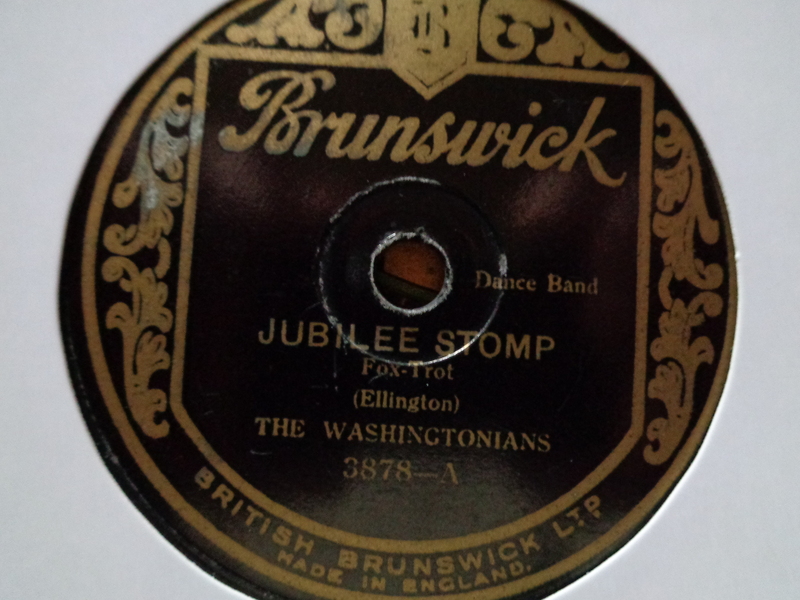 The Brian Rust dance band or Jazz discographies fail to mention that the two collaborated in 1923 and hired west coast musicians in Los Angeles, California. 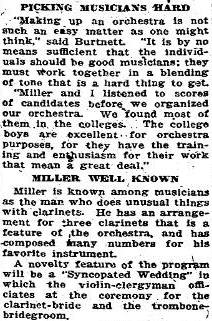 A newspaper article mentions the joining of Earl Burtnett and Ray Miller, as Burtnett and Miller Famous Orchestra. 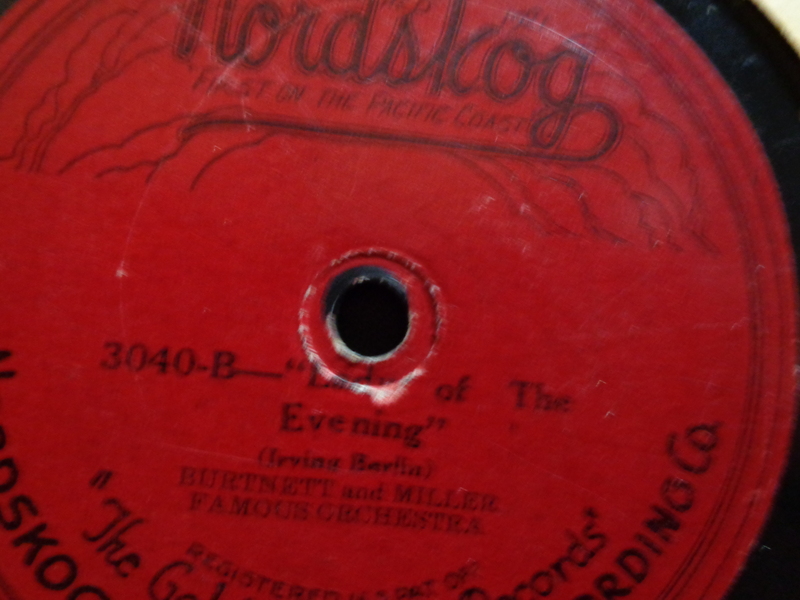 What is interesting about this particular record is that the labels have been placed on the wrong side of the record, as the 3040 B appears in the inner grove with the A side label. 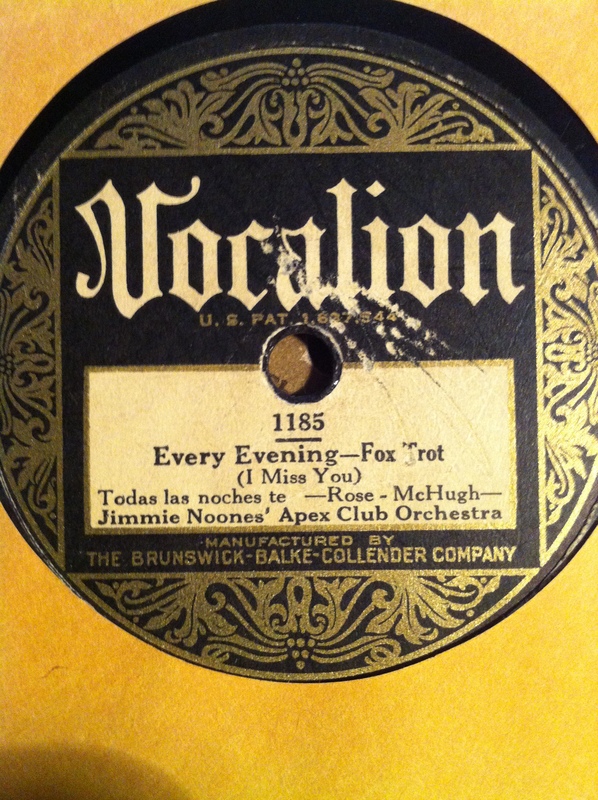 The record has only one side of Jazz interest, where the orchestra performs “Lady of the Evening”. There are some interesting solos. 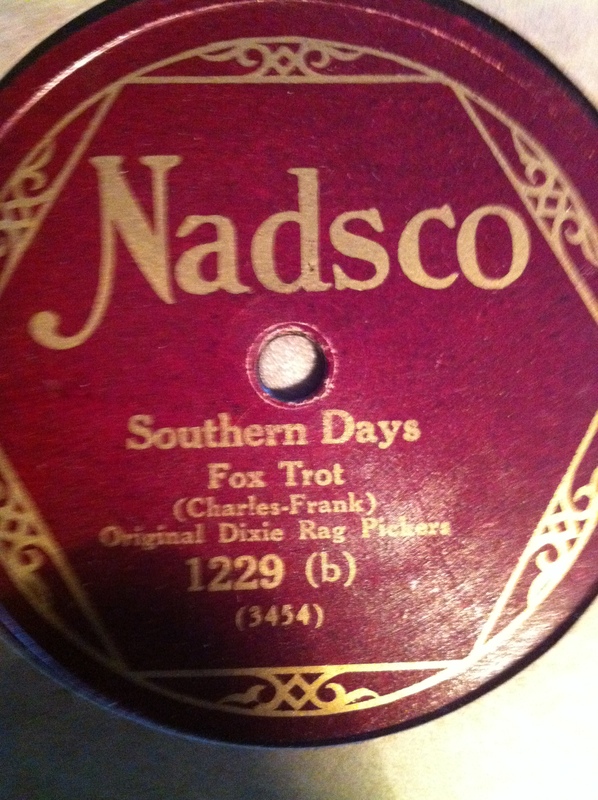 The recording has been uploaded for you to listen to. 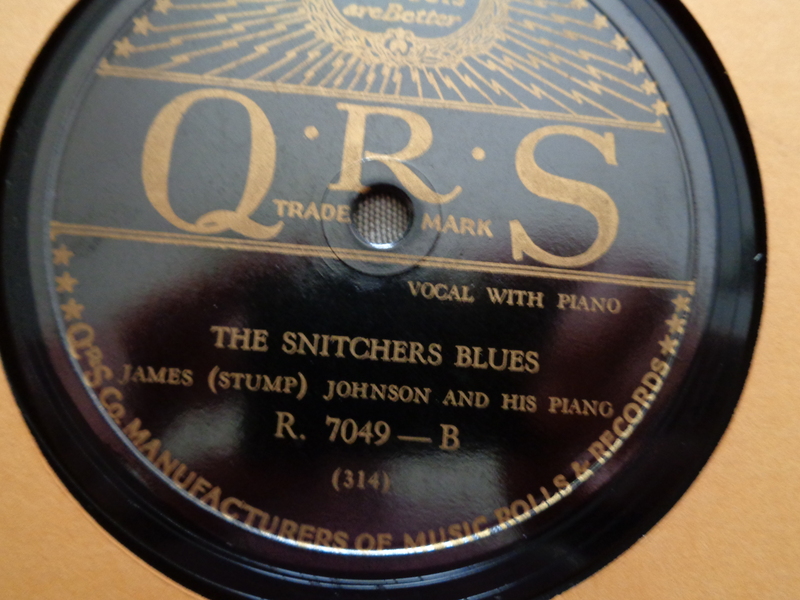 The last look at my 78 RPM record collection was in November, 2014, I believe. Since then I have been busy adding new goodies to my collection. Here are a few of these gems below! 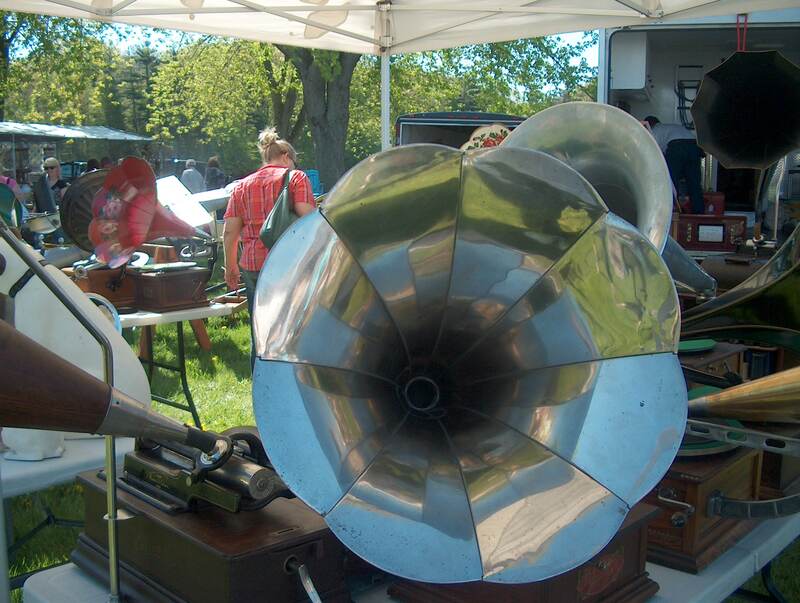 Once again, I am please to share with my readers the publication of the Canadian Antique Phonograph Society, in which one will find various articles pertaining to phonographs, etc. 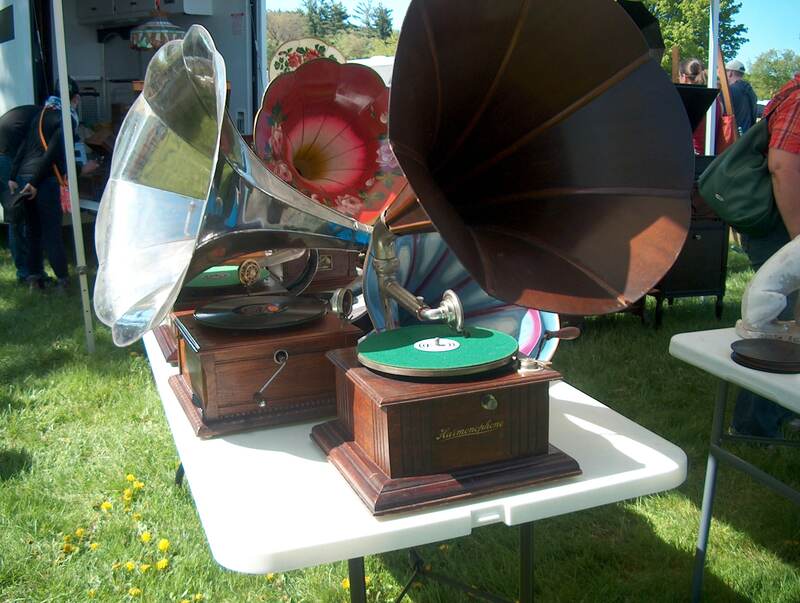 The current issue has an excellent article about the history of the Phonola, a Canadian manufactured gramophone, along with other items of interest. 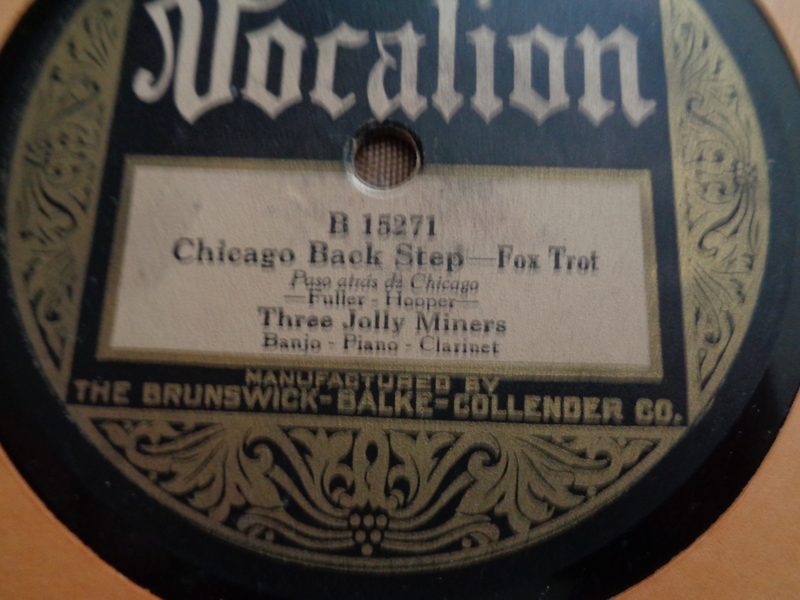 While searching for new material to publish, I came across a series old articles that were written for the Victrola and 78 Journal in 1994. 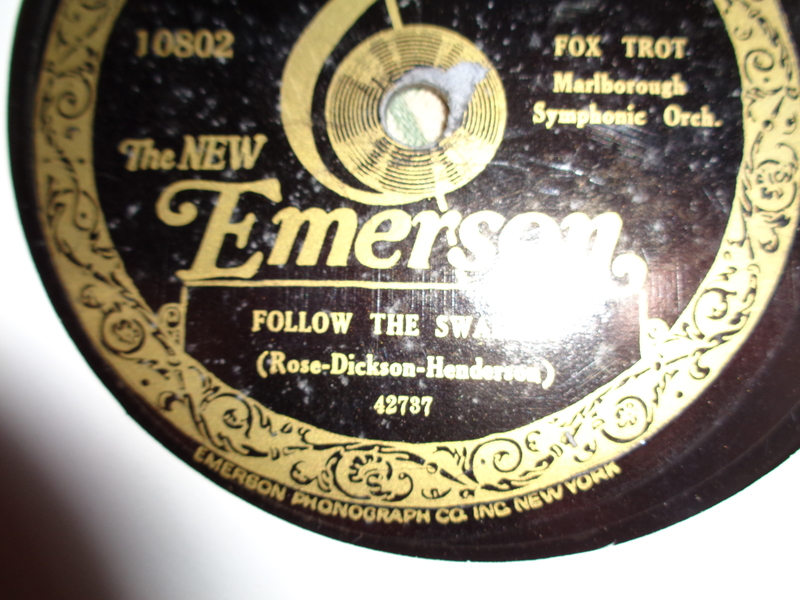 The material pertains to both gramophone and 78 rpm records, so it falls within this blogs theme. I hope you will enjoy the first edition, and will continue with the series at a later date. 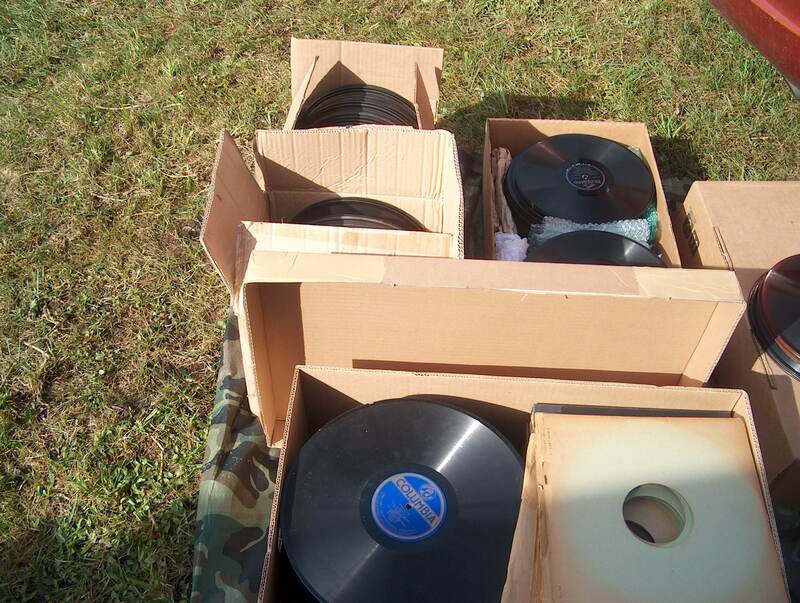 Why Is It So Hard To Dispose of 50,000 78 RPM Records? 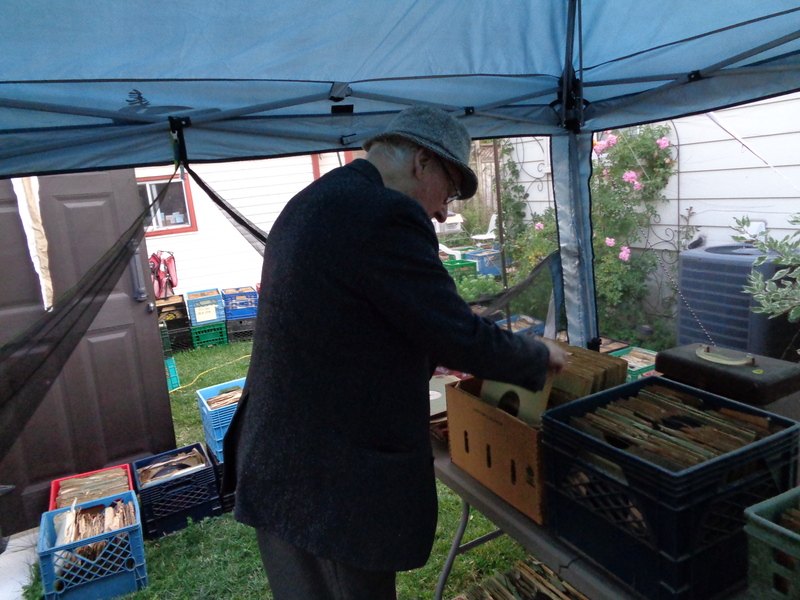 Last year I decided to become a record dealer with my spouse, I would sell and buy 78 rpm records, and she would handle the 45 rpm records. 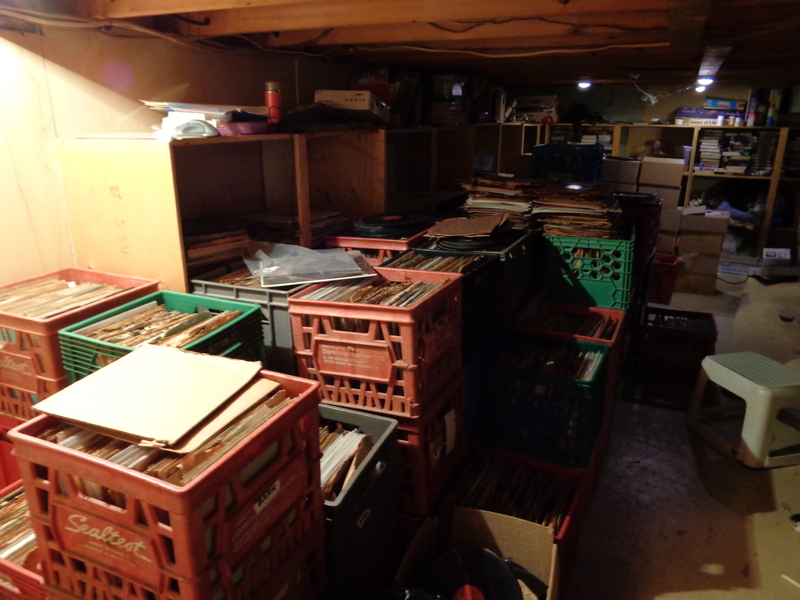 I estimate that in my basement and in my record shed there are a good 50,000 78’s looking for a new home. 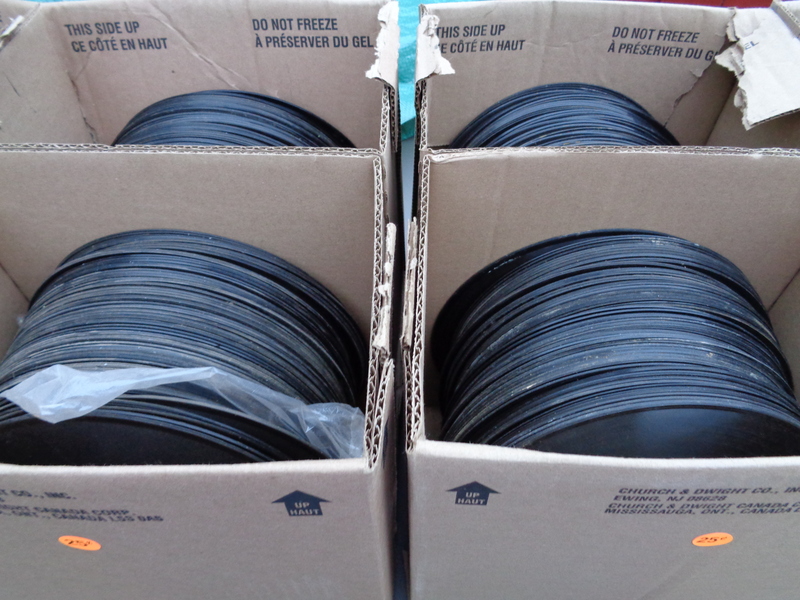 The winter time is the worst time for sales, unless you are prepared to list records one by one on E-Bay and ship them, and even then, that may not work. 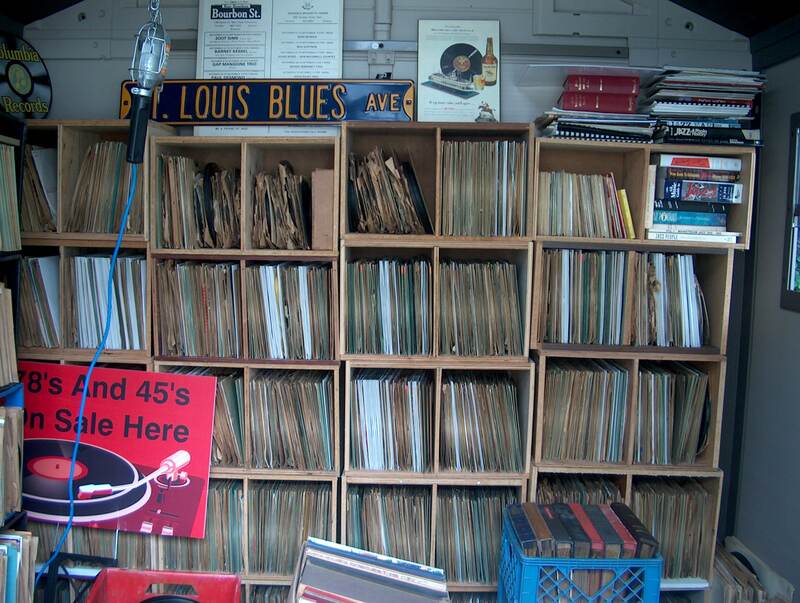 Record collectors in general, tend to go for Blues, Jazz, and Rock and Roll. 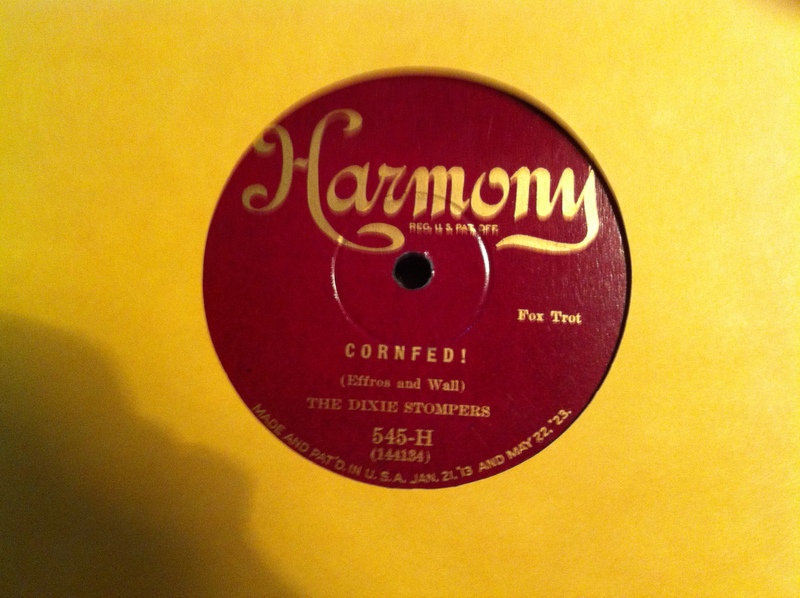 They want the rarest and cleanest copy of any record, and will not buy the hill and dale stuff. 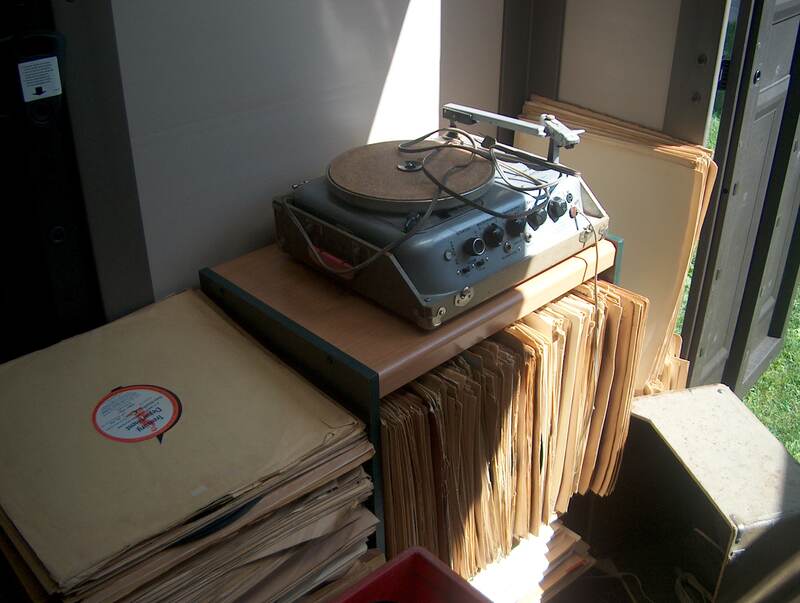 That only caters, it seems, to gramophone enthusiasts, who care more about their machines than the records themselves. 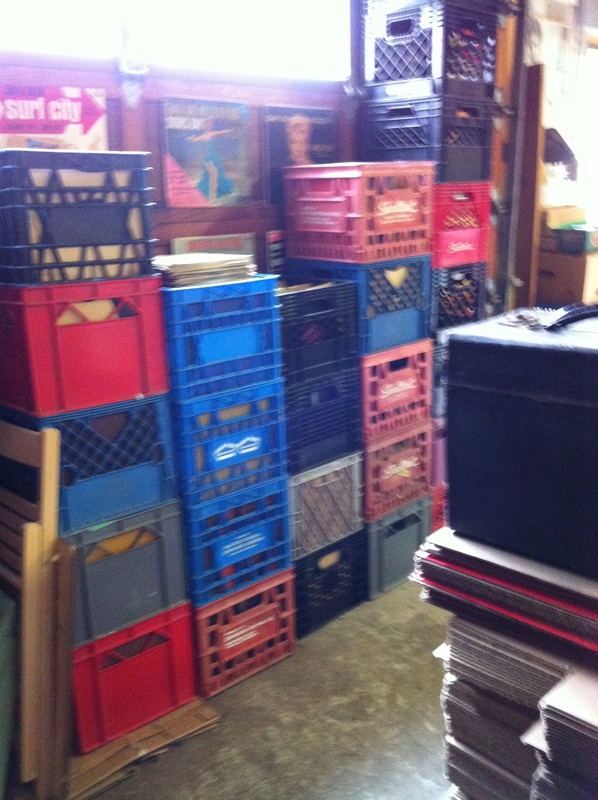 My dilemma is I want them gone, as I have spent a great deal of money in making this business feasible. 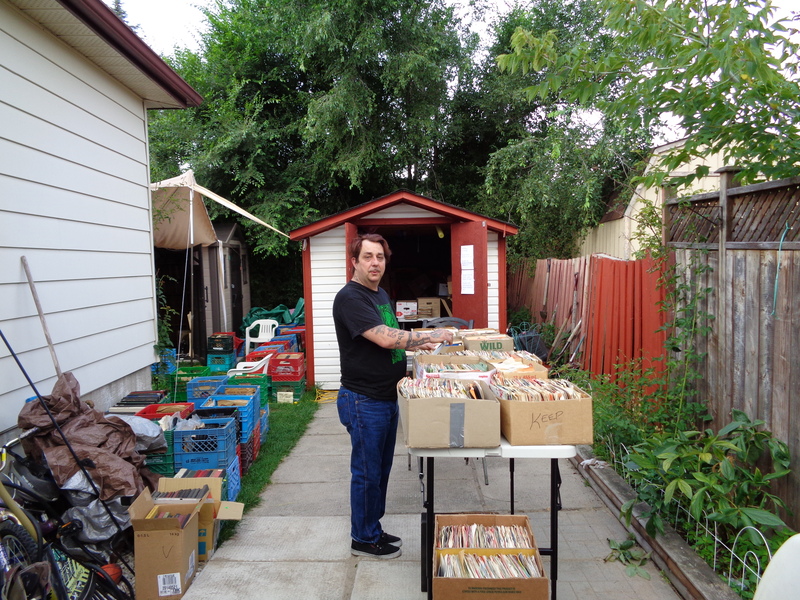 In 2014, you may remember I held three sales, starting in July, so I was late in starting. 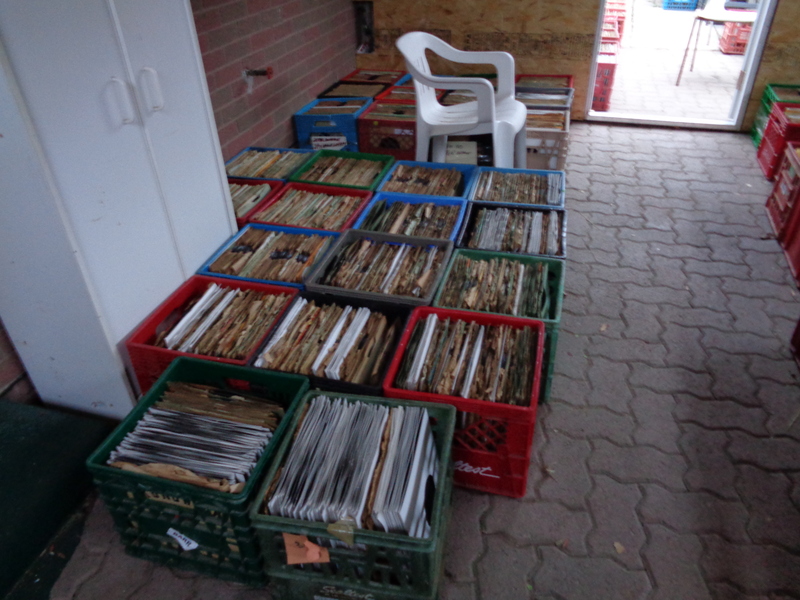 This year, I hope to have at least 6 sales, starting in March or April,. 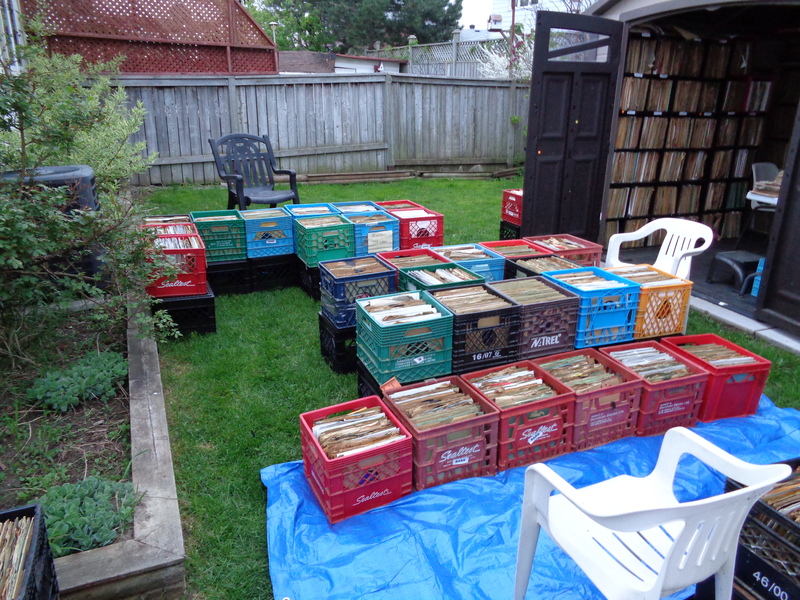 In the meantime, if you are interested in lot jobs, check out my two postings on E-Bay.ca for 15 and 25 crates of 78 rpm records. Happy Holidays to you during this festive season! 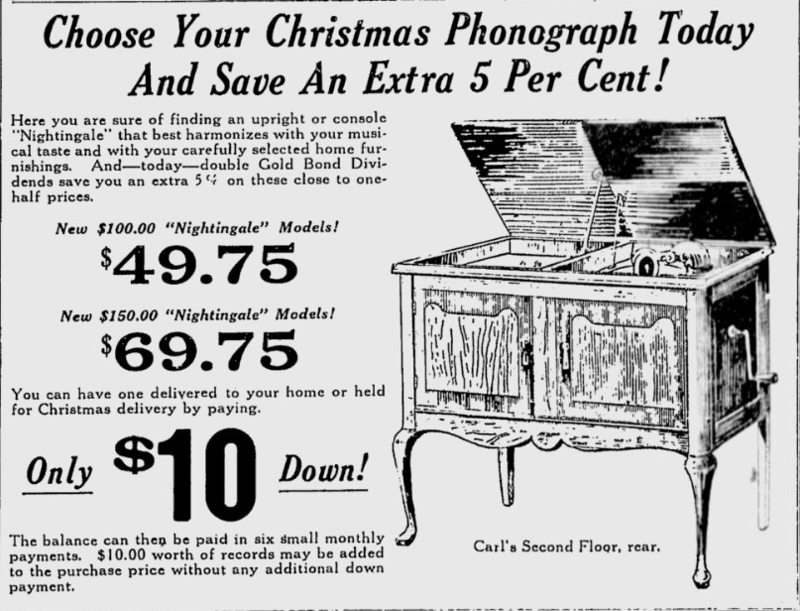 Many stores during the Holiday season, suggested that a phonograph would be an ideal present for the home. 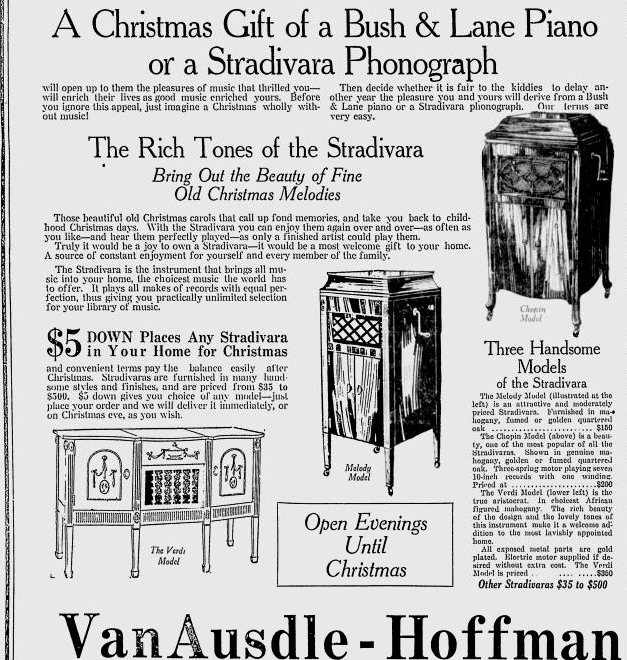 Here are a few examples of the newspaper advertisements used to entice people to buy. 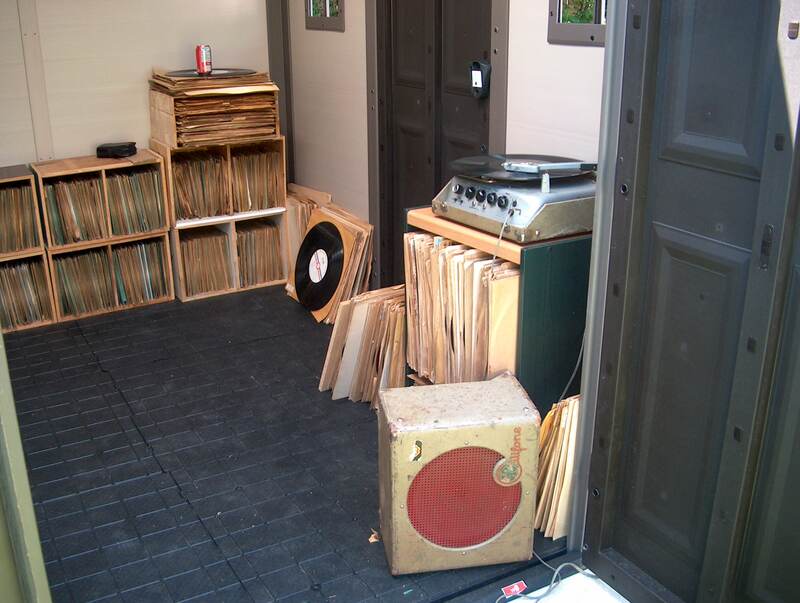 About a week ago, I began construction of my record room downstairs in the basement, after a new coat of paint was put on the walls, and carpet was laid down. 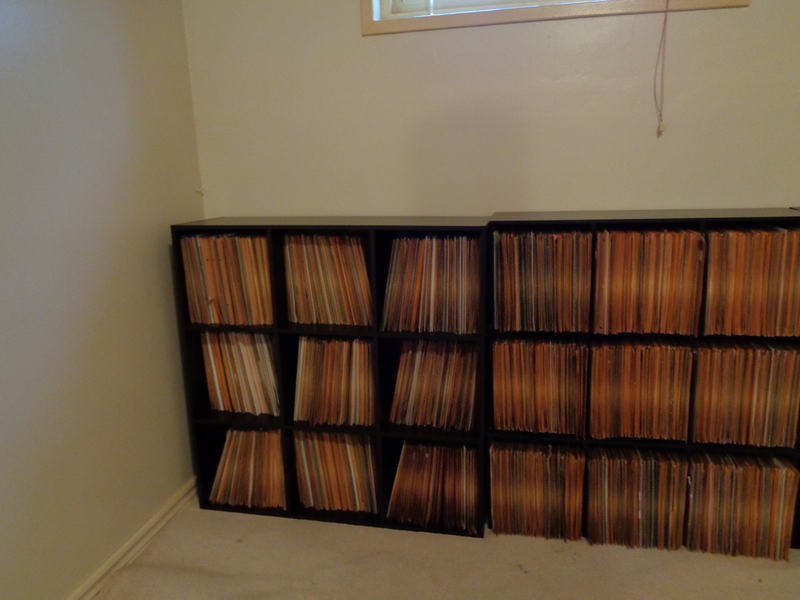 All the shelves are up, and now begins the long process of putting all my records back on the shelves in sequential order by label and number. I am just taking a break now to give my back and muscles a rest, as I have been working since 4 a.m. 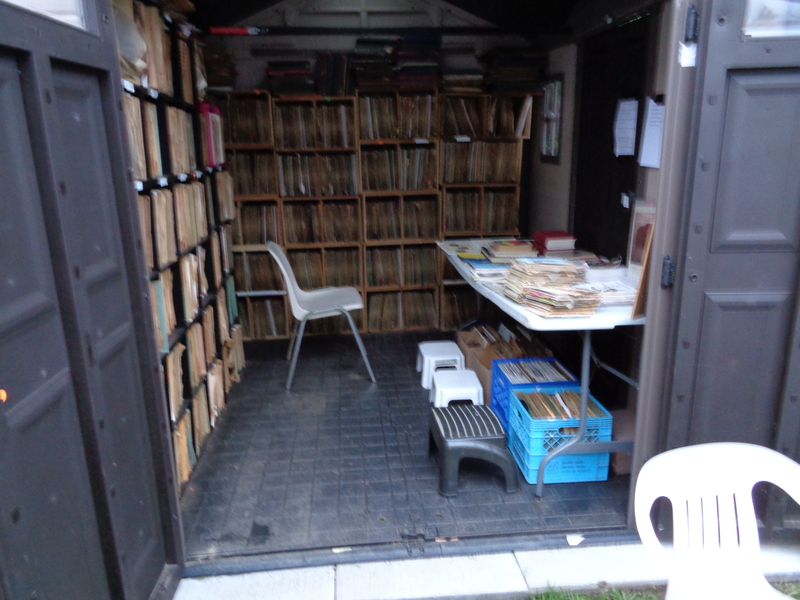 It has taken this long for me to complete my Brunswick and Cameo library. 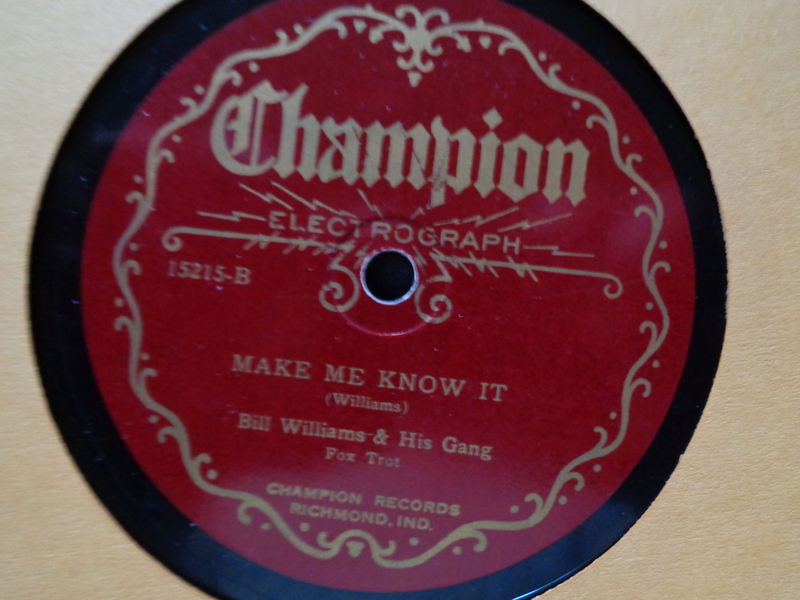 I plan to tackle the Champion and Columbia records on Sunday. 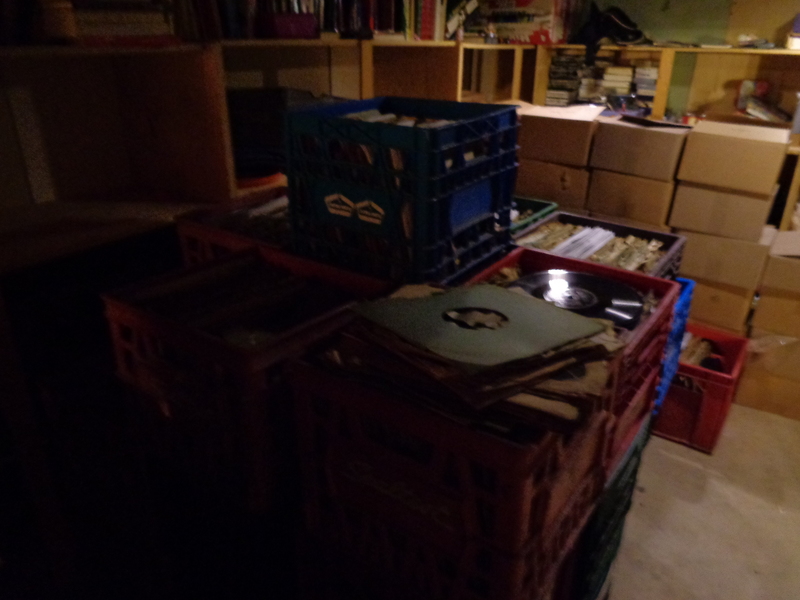 Here are a few more photographs to show how the room looks at present. 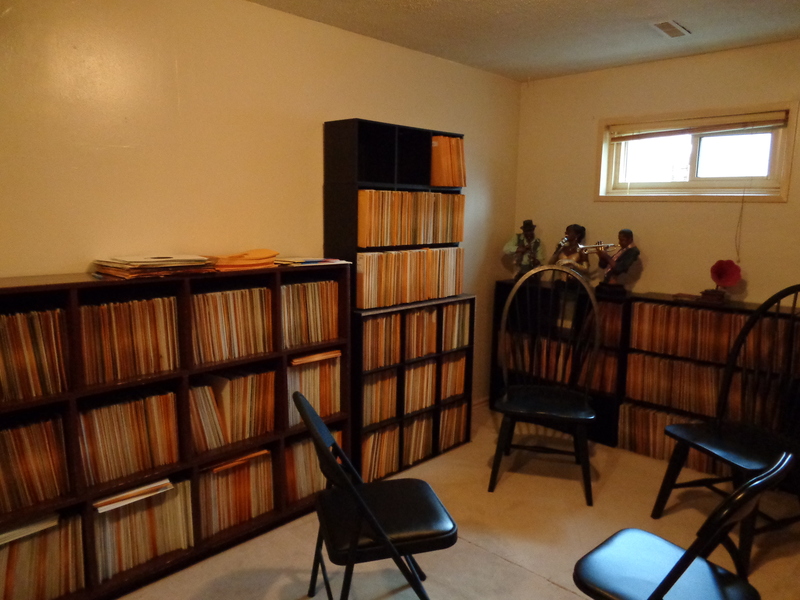 It has always been my dream to have a room set aside for listening to, and playing 78 RPM records, and to share that room with fellow collector’s in fellowship. 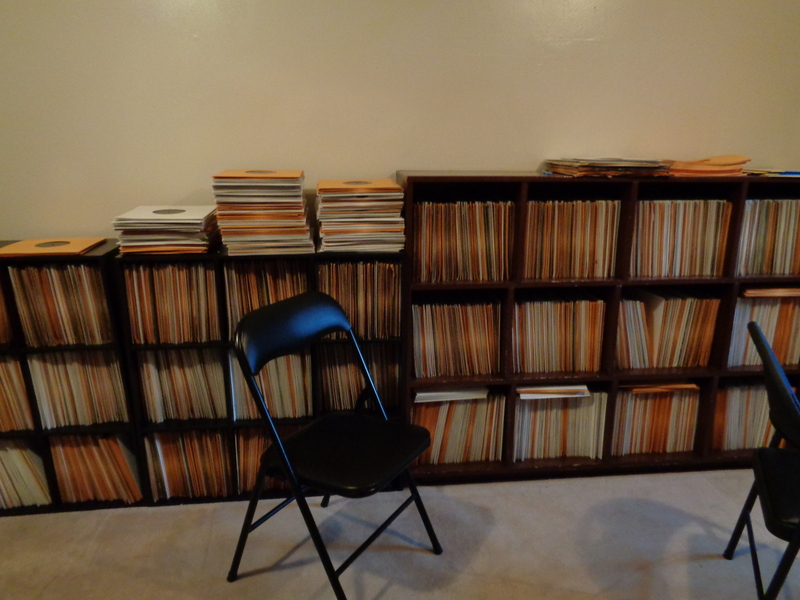 After a good coat of paint to the walls, and the laying down of new carpet, I have begun the process of building new shelves, and taking the existing one’s to fill them with records. 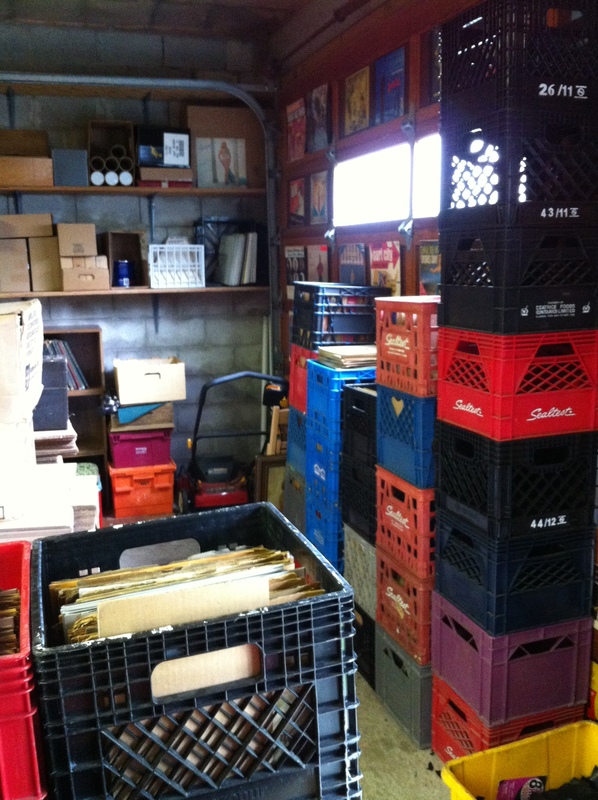 Most of my collection has been cataloged on an excel spreadsheet, and the newest additions are in boxes, ready to be put on these shelves. 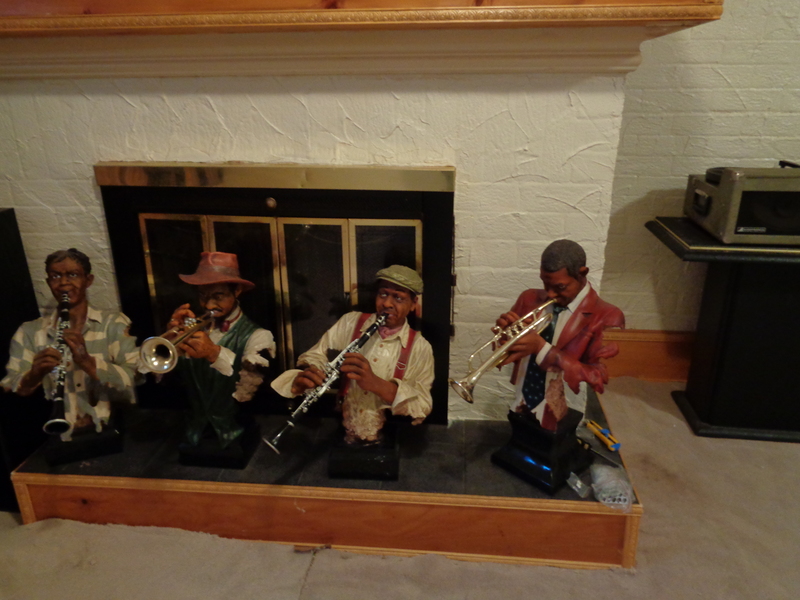 There are seven statues of Jazz musicians which have been added to the room, to give it a flavor of New Orleans. 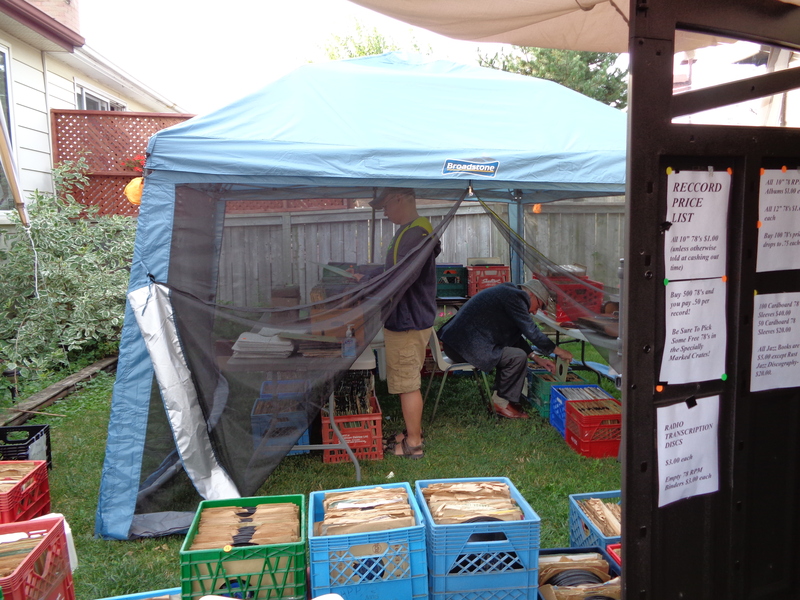 Here are some photographs from the construction, below! 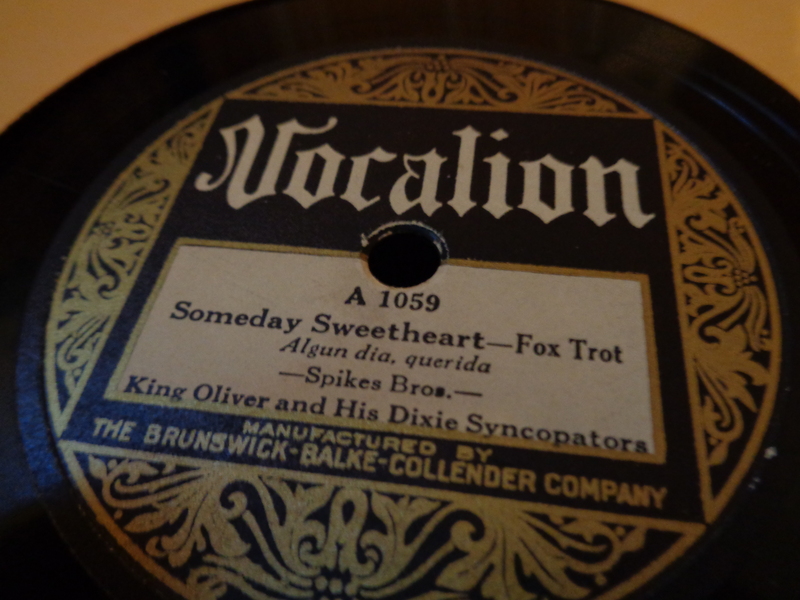 The last time I posted pictures from my own personal collection of 78 RPM records was in late March, 2014. 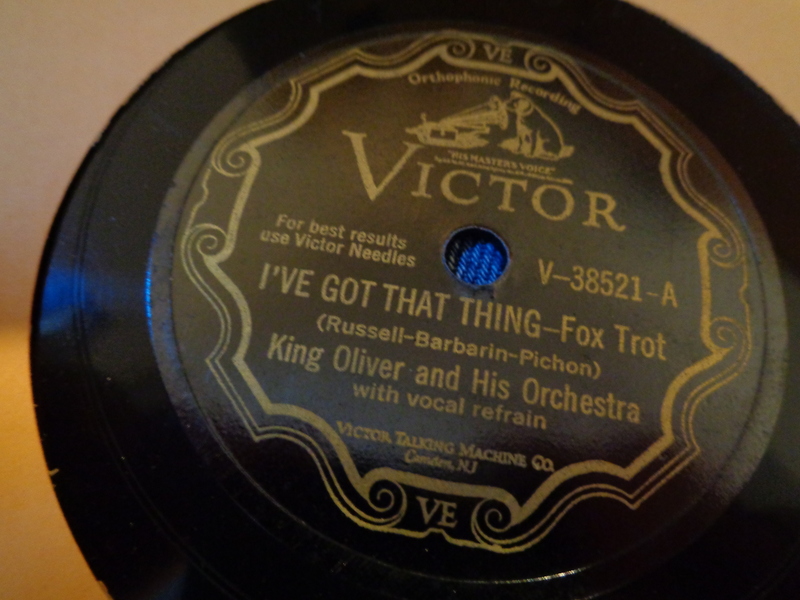 Since then, with the acquisition of collections, I have amassed some interesting labels, which I will share with you in the photo gallery below! First, I must apologize to you loyal followers for a long break between articles. 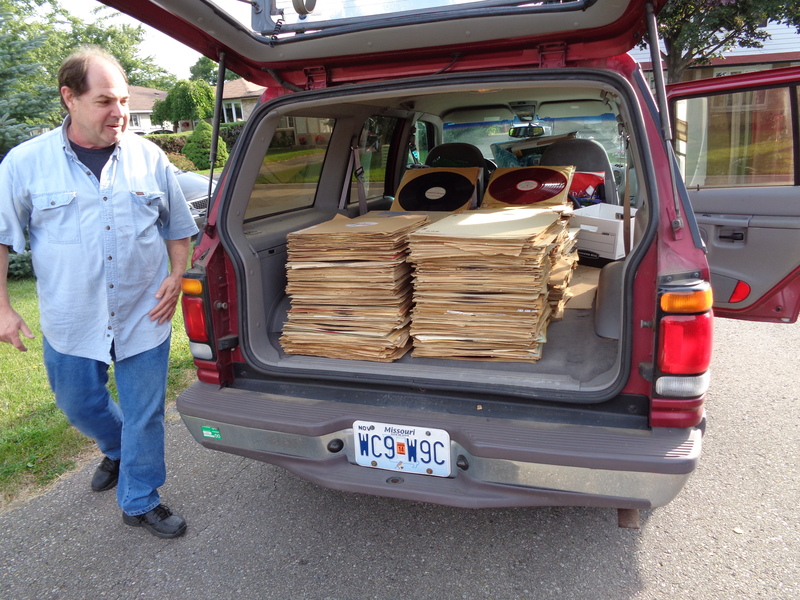 With the purchase of several 78 RPM and 45 RPM record collections and two sales in July and August, life has been hectic to say the least. 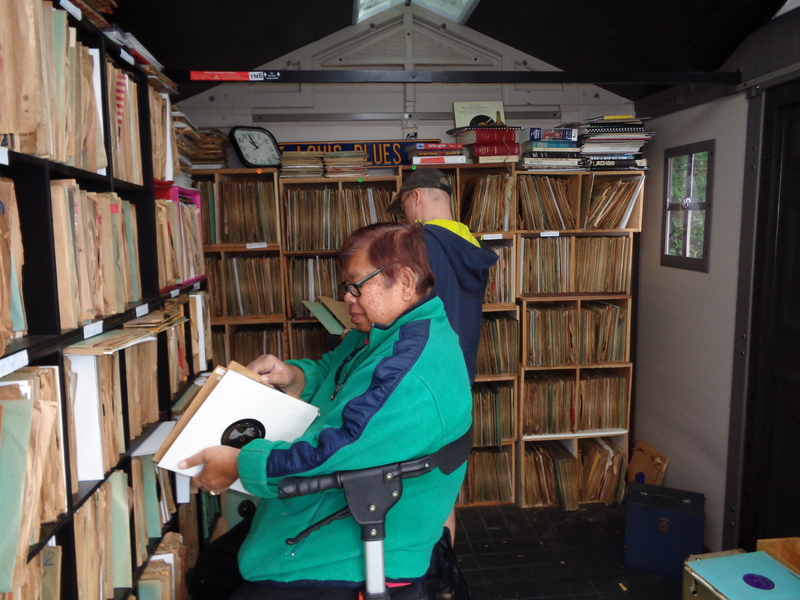 It is a wonderful feeling to meet new people and to listen to what they collect. 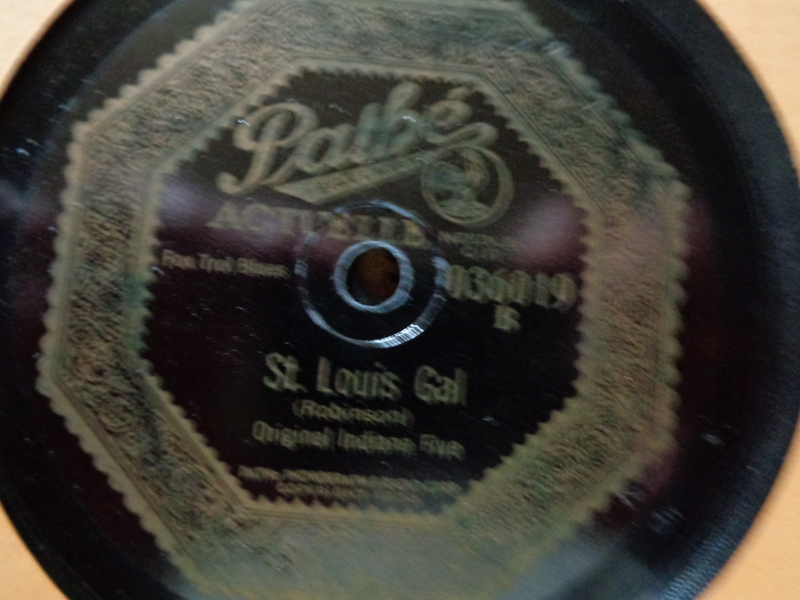 I recently had a gentleman travel all the way from the state of Missouri to purchase all the 16 inch radio transcription discs from me on August 16th. 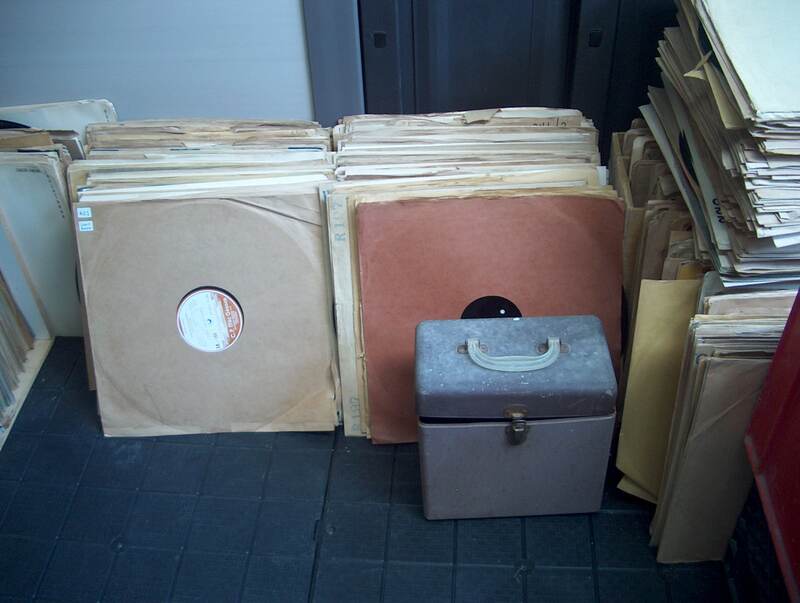 Our final sale will take place on Saturday, September 13th, at which point most of the remaining records from Steve Barr’s collection will be on sale. 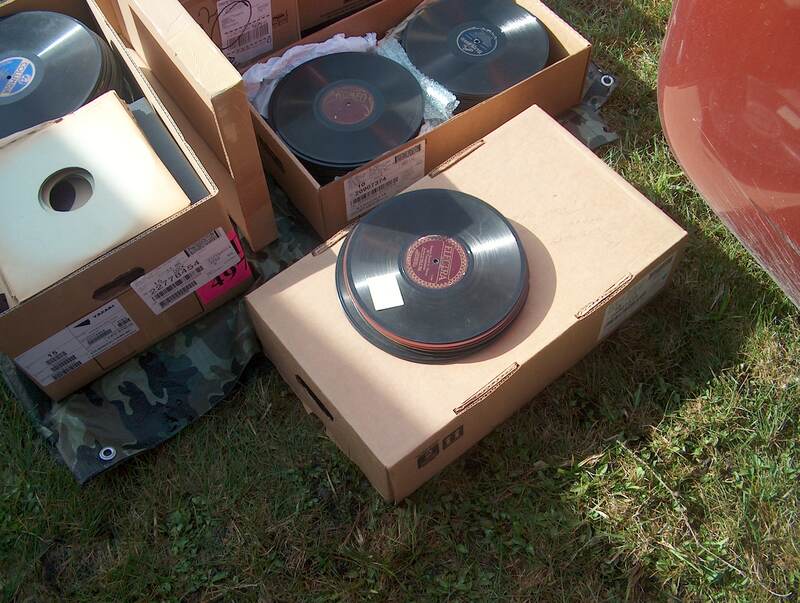 From The July 5th 78 RPM And 45 RPM Record Event! 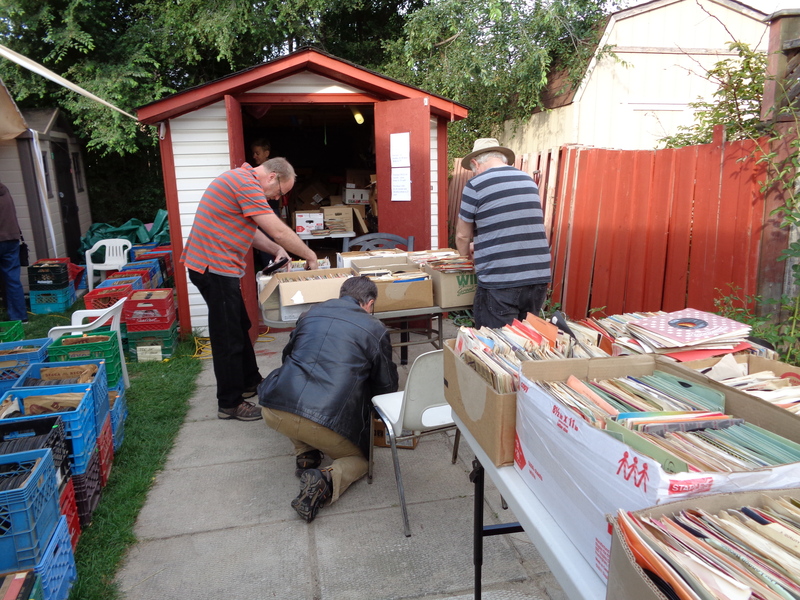 Here are some photographs from the sale on July 5th, which, by the way, was a huge success! 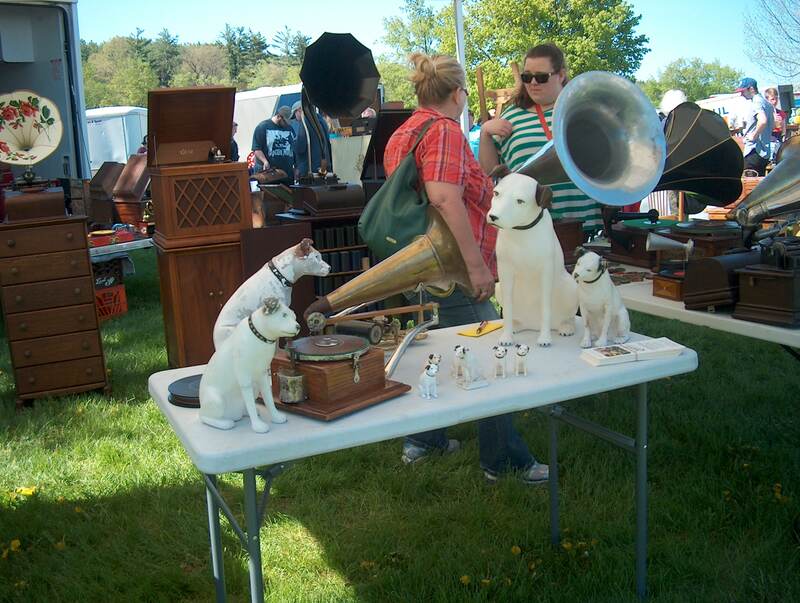 The next event date is Saturday, August 16th. Details for this will be posted shortly, or if you have a Facebook account, you may go to the link below for more details. 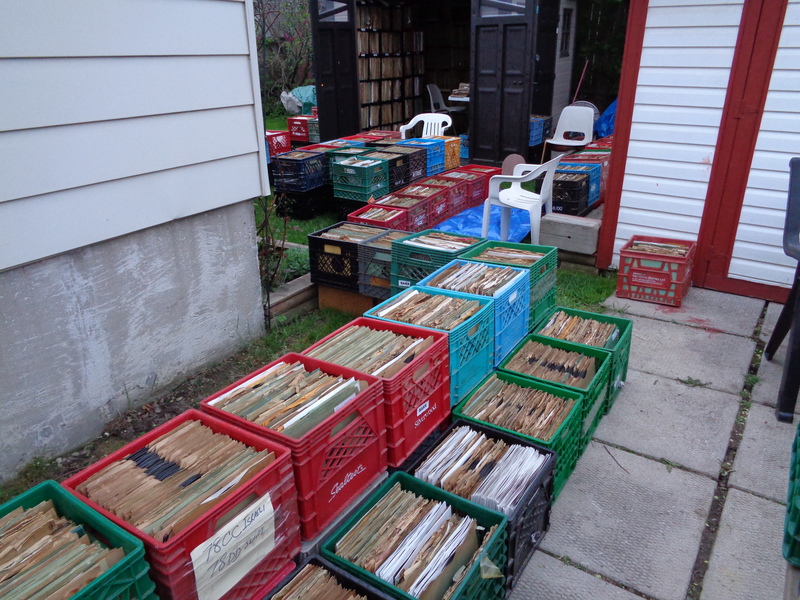 Still loading a ton of 78’s into the shed for my big sale on July 5th in Brampton, Ontario. 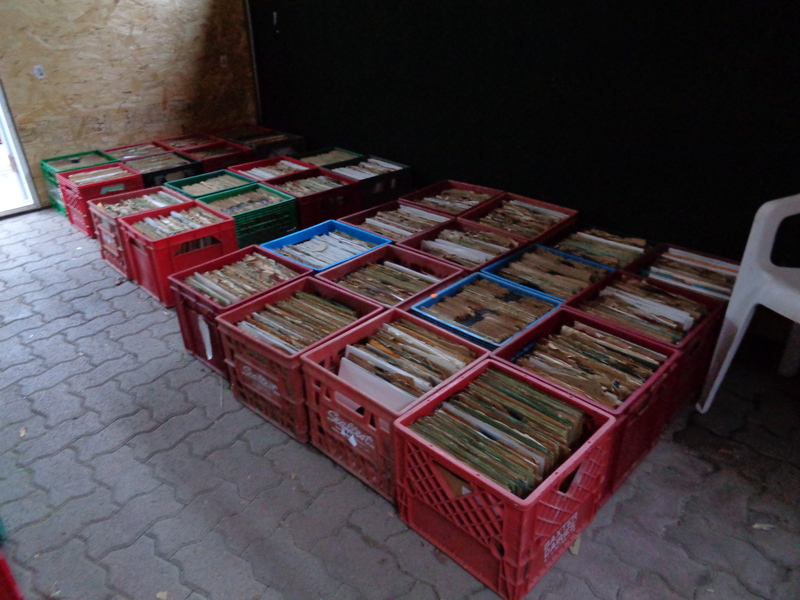 Most of it is ready to go, so here are some updated photographs I would like to share with you. 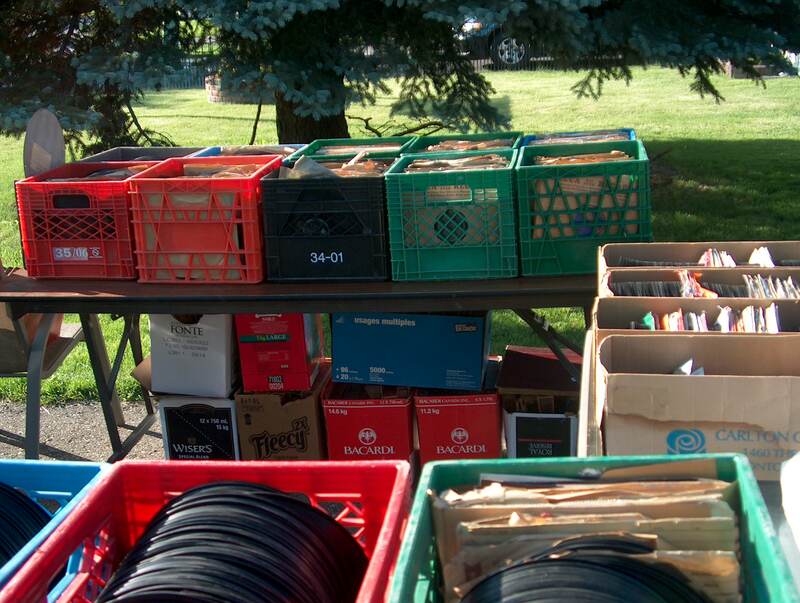 On May 12th I previously published my invitation to you to attend my record sale on Saturday, July 5th, at my residence. 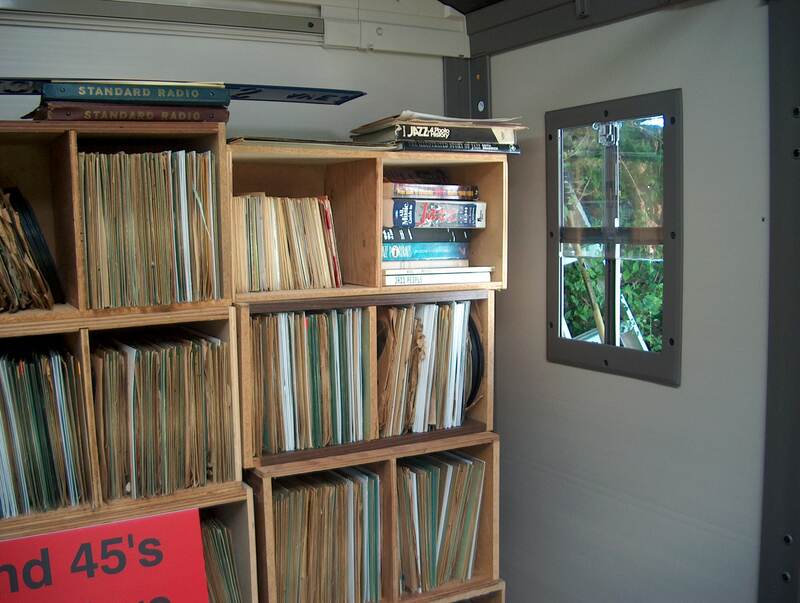 Due to the large amount of 78’s, 45’s and radio station transcription discs, plus many other items, I decided to have a shed built in the backyard, to double as my man cave and storage unit for all records I will be selling. 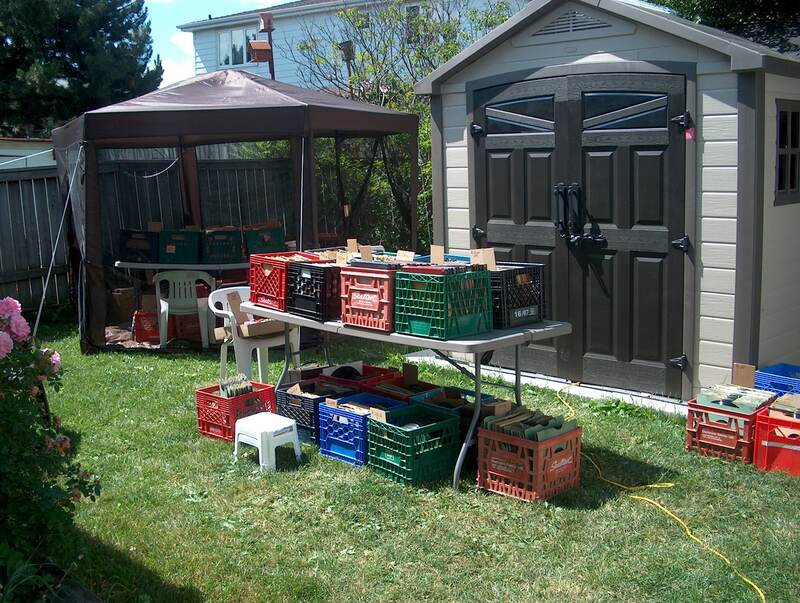 After a week of laying down patio stones, and construction of the shed, it was finished yesterday. 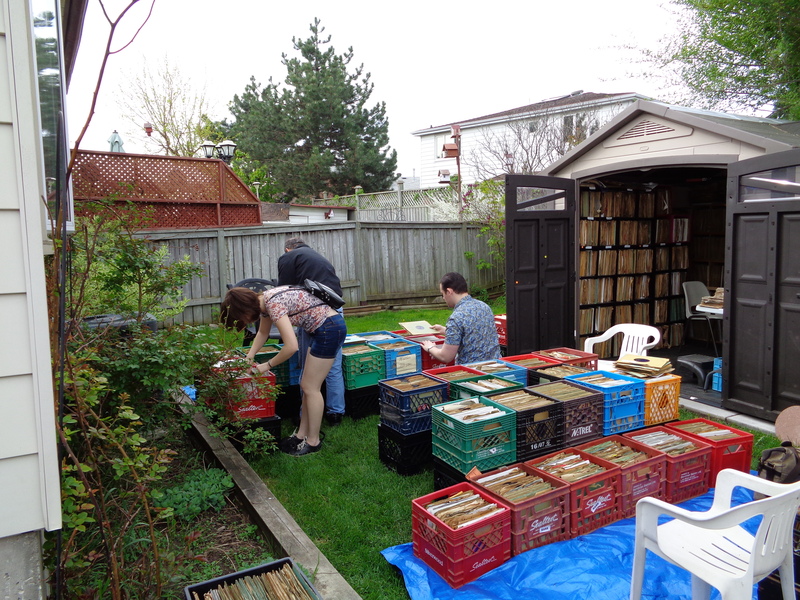 Today, I started to load the shed with records and a turntable for previewing the records. 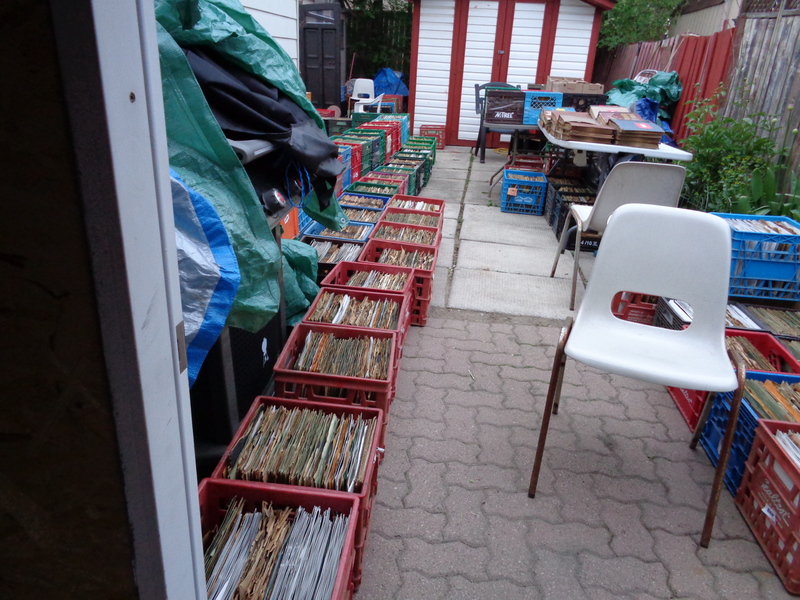 Here are some photographs of the shed, and the records that I have put in it, so far. 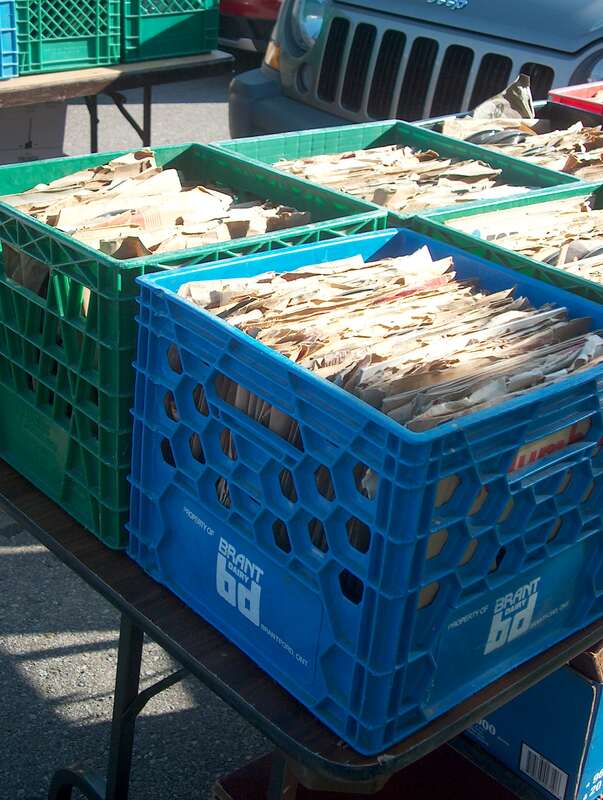 The hunt for records took me out today to the Christie Antique Show, billed as the largest show in Ontario, held twice a year in the Spring and Fall at the Christie Conservation Area on Highway 5 west of Flamborough, Ontario.. Of course leaving early to get there by 8:30 a.m was hampered by our famous highway and road construction, which reduced traffic to a snail’s pace. 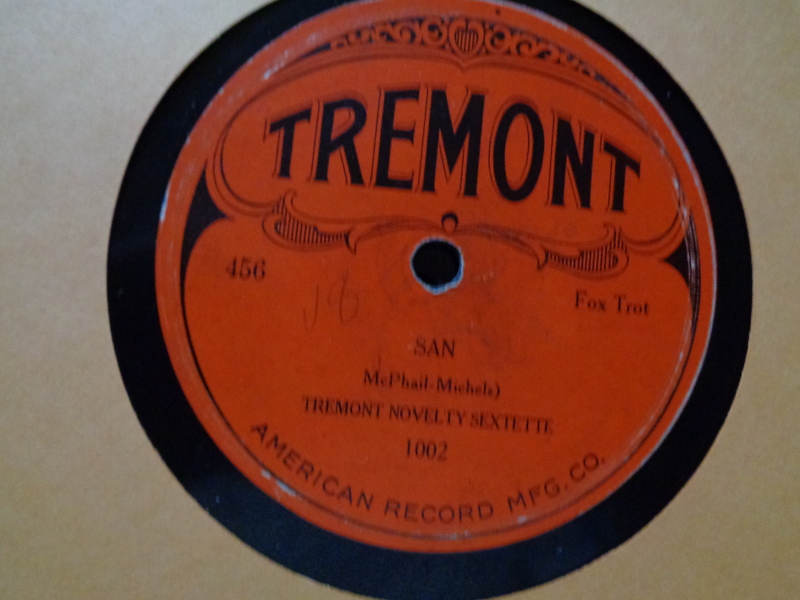 However, we finally arrived by 9: 30 a.m, and promptly headed over to see Jean-Paul Agnard, proprietor of the Musee Edison du Phonographe, situated in Ste-Anne-de-Beaupre, Quebec. 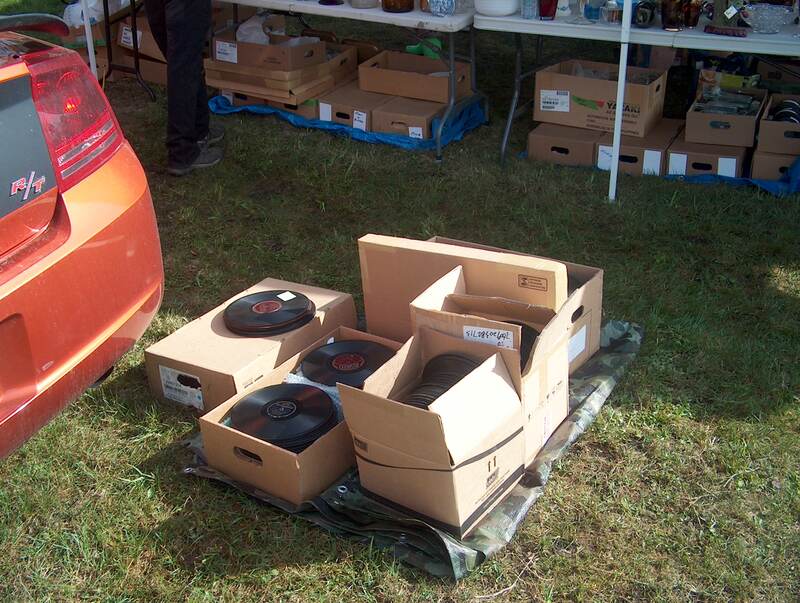 He had a very nice selection of gramophones for all to see and hear, and a stash of 78’s in the rear of his truck for me to go thru. 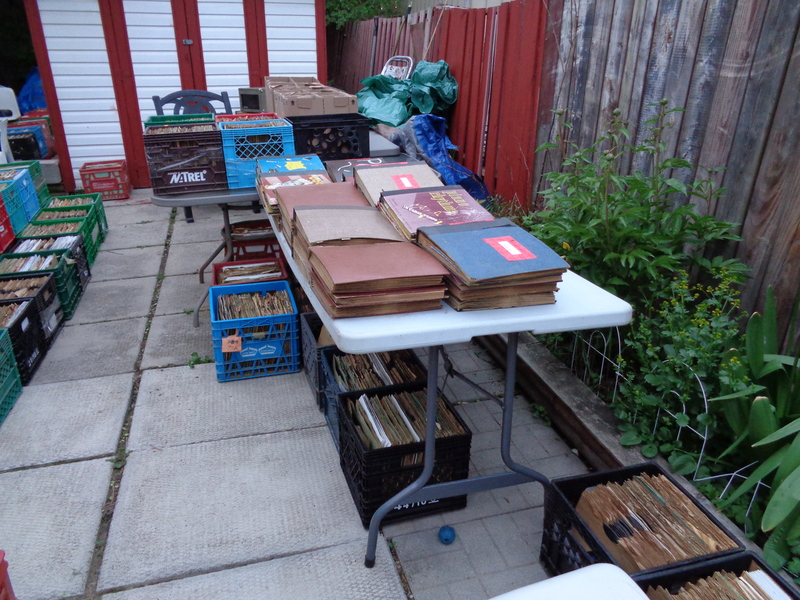 Some nice 10000 series Starr records came out of that pile, along with a few other Victors, Columbias, and a late Perfect. 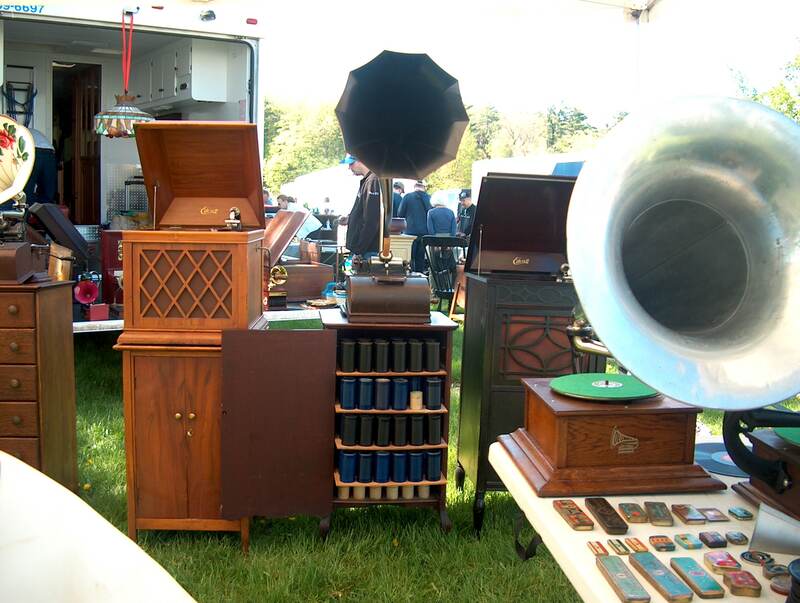 Enjoy the photographs below detailing the phonographs on display, and of course, your editor hunting for records! 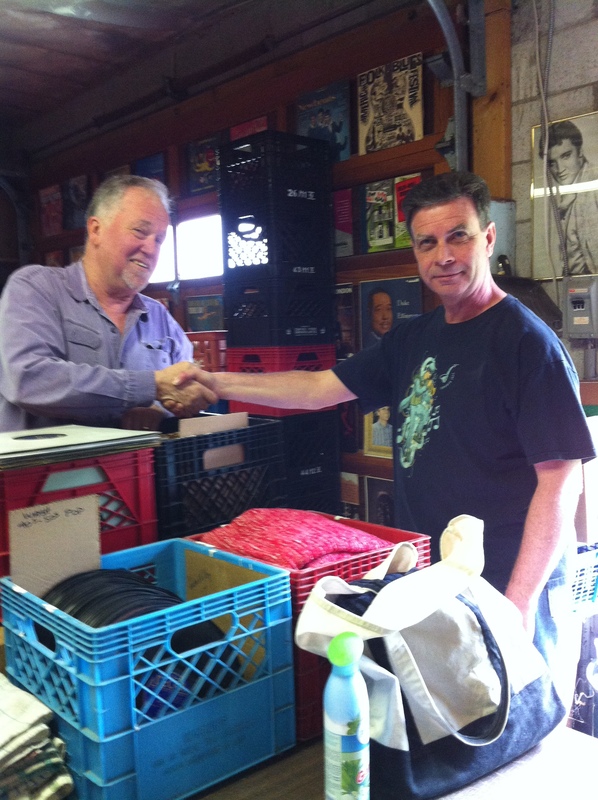 Don Keele is a legendary record dealer, and after 42 years of business, he decided to sell his record stock, sleeves, shelves, and transcriptions. 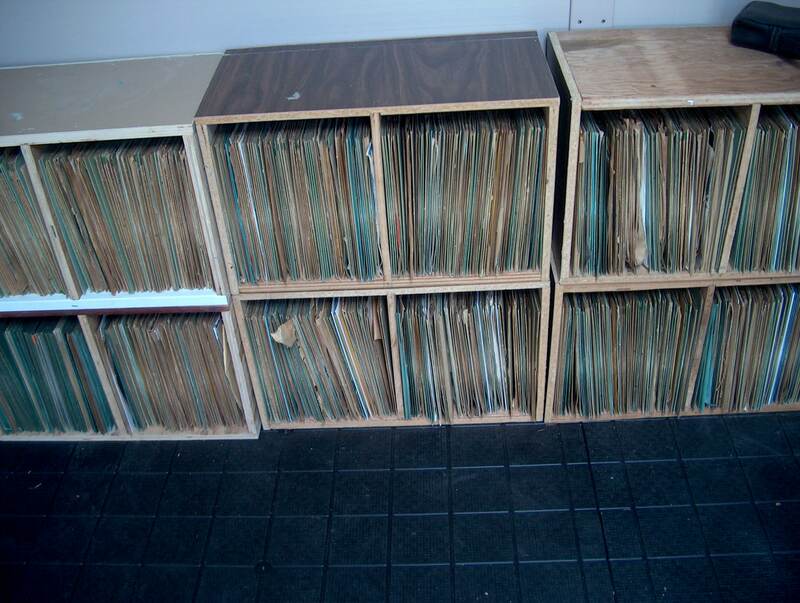 So, as of today, your editor has purchased his inventory, and will be taking a leap into selling 78’s directly, and on auction. 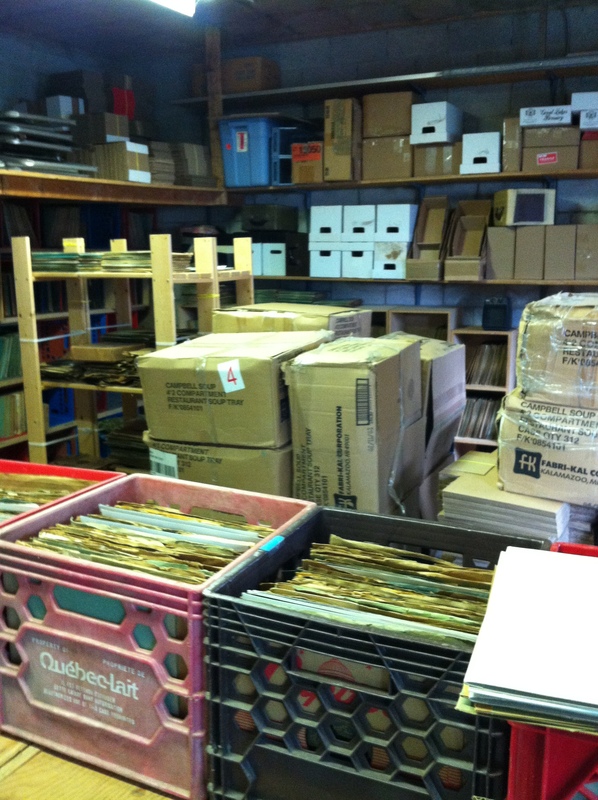 The photographs below were taken at his warehouse located in the west end of Toronto, Ontario. Your editor is the one with the Jazz T-shirt. 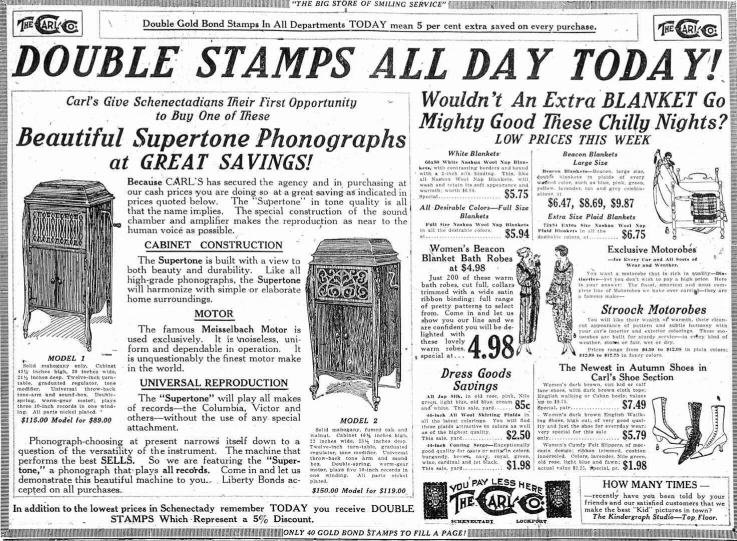 Here is another example of the type of talking machine that was popular in 1915, as posted in the May 29 edition of The Billboard. 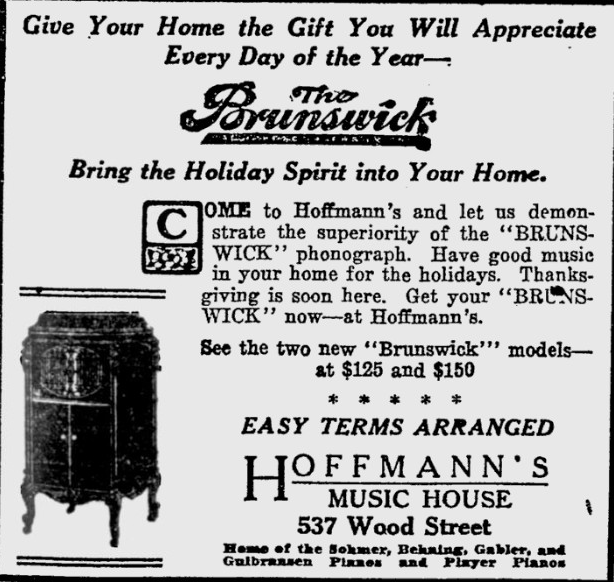 The November 6, 1915 edition of Billboard carried this advertisement, placed by the Wonder Specialty Mfg. 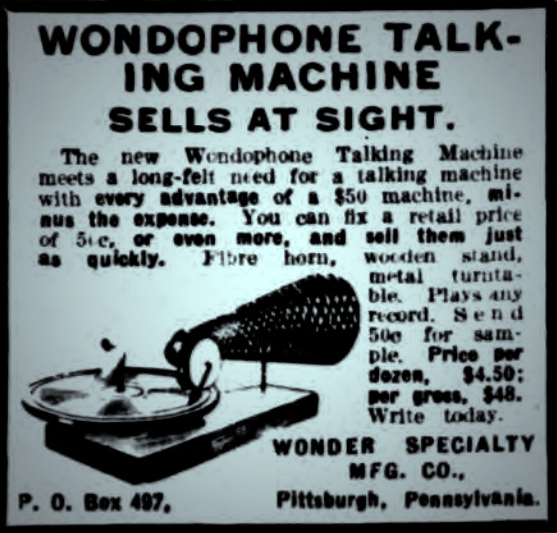 Co. of Pittsburgh, Pennsylvania, for their Wondophone Talking Machine. 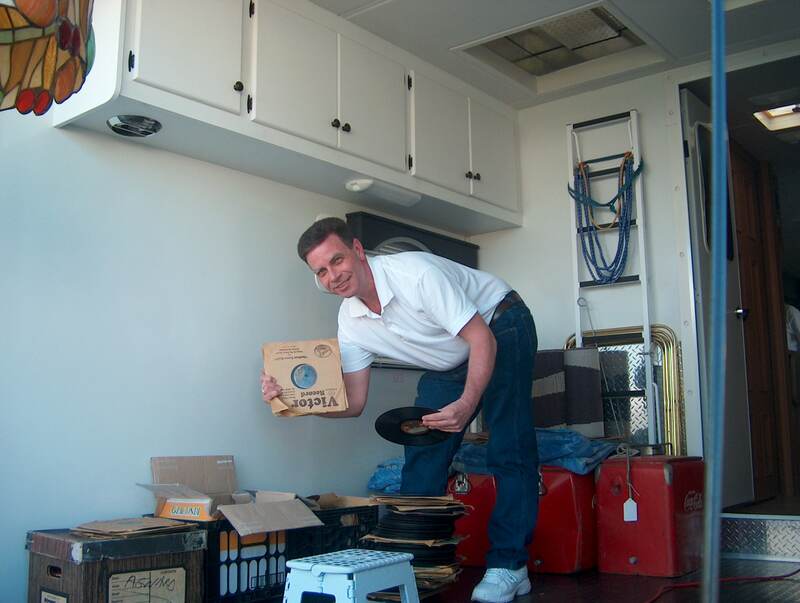 The hunt for 78 rpm records was on early today, left Brampton, Ontario and headed west on Highway 401 to exit 299, or the Brock Rd. North. We arrived shortly at Aberfoyle shortly after 9:00 a.m. and the parking lot was already full. 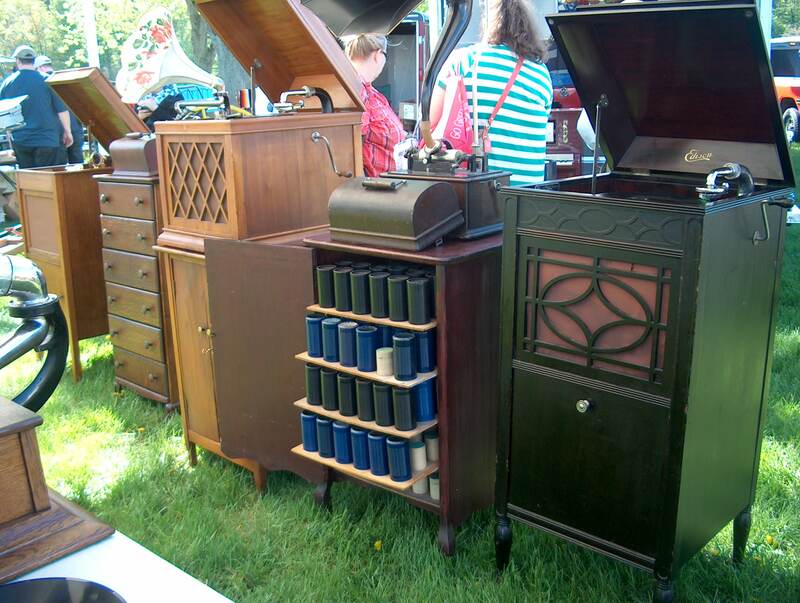 After parking some distance away, we found our way into the second largest antique show in Ontario. 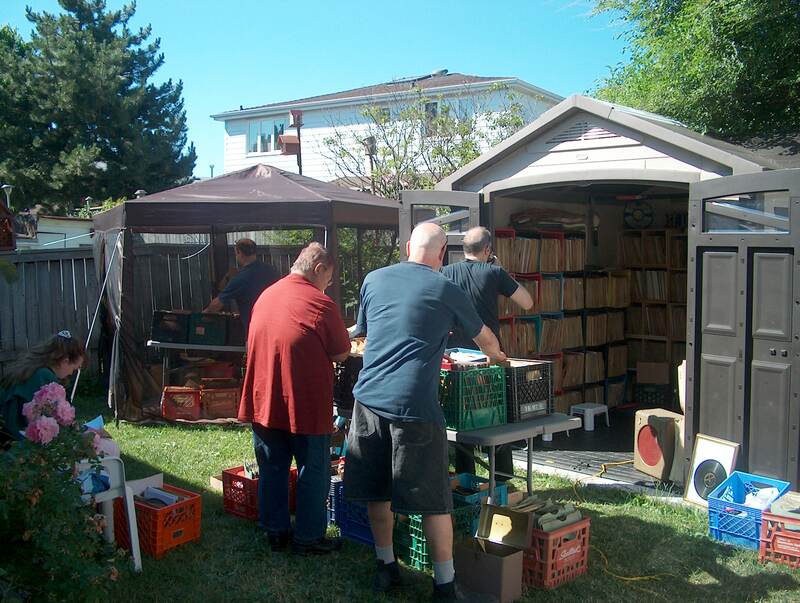 The largest is held at the Christie Conservation area in May and September. Guess where I am heading in two weeks? 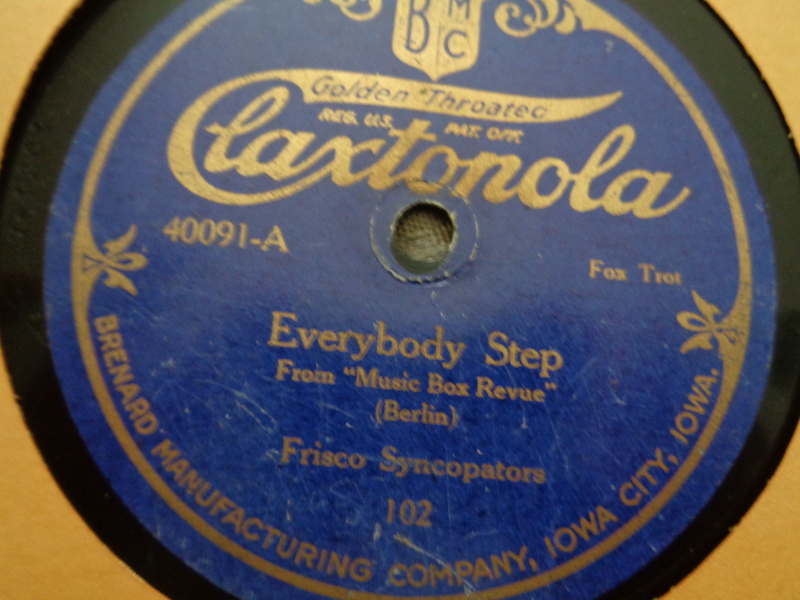 Needless to say, I was amazed to find 78 rpm records and brought home over 300. Here are some photographs of the day to share with you. 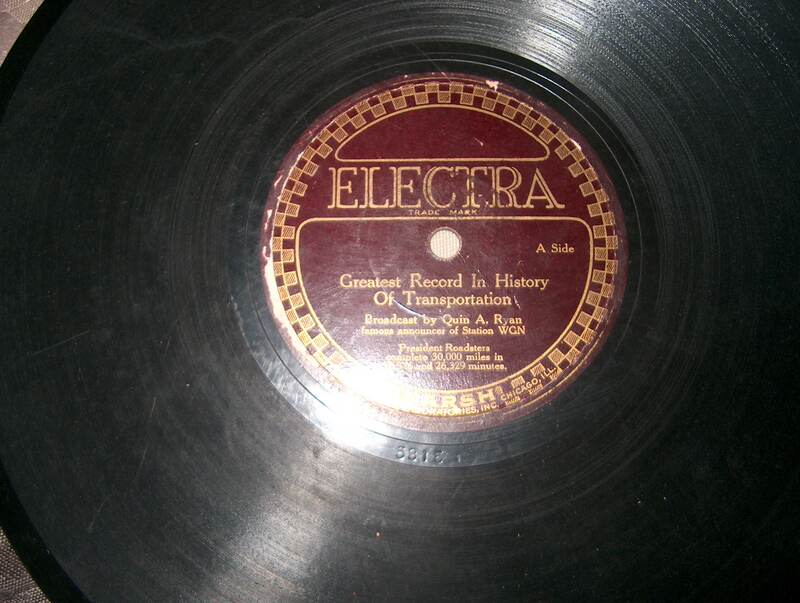 The one rare item is the Electra label, produced by The Marsh laboratories in Chicago. 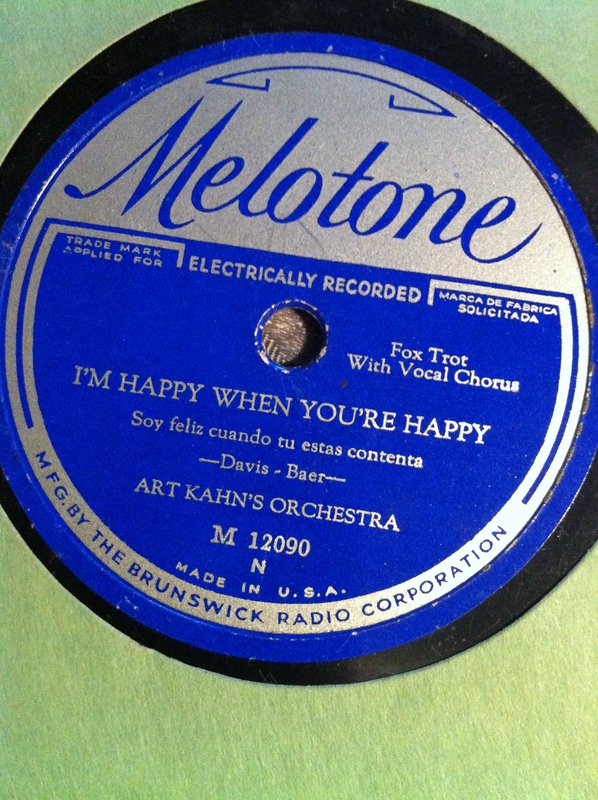 Frank Westphal was involved in various bands including the Benson Orchestra of Chicago. 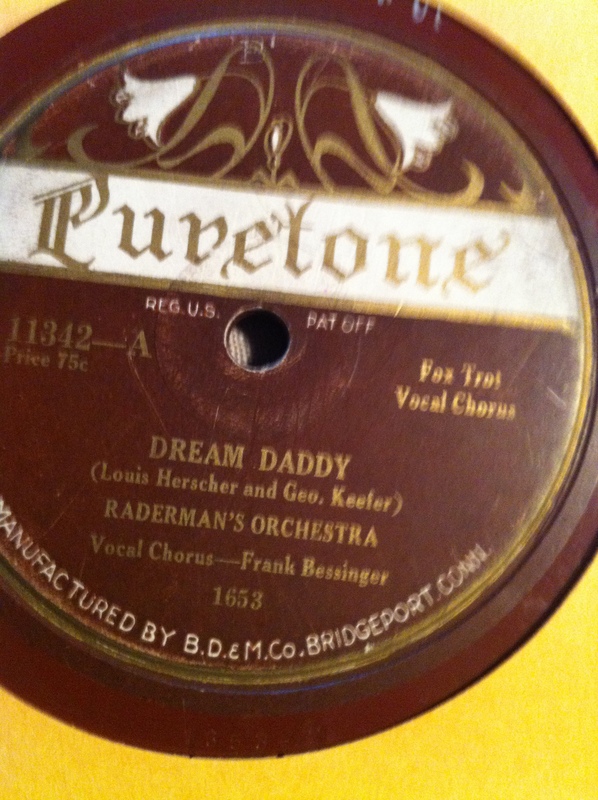 In 1921, he became established with his own dance orchestra at the newly opened Rainbo Gardens in Chicago. The open-air venue had a revolving stage to allow for continuous entertainment, table seating for 2,000 patrons, and space on the dance floor for an additional 1,500. 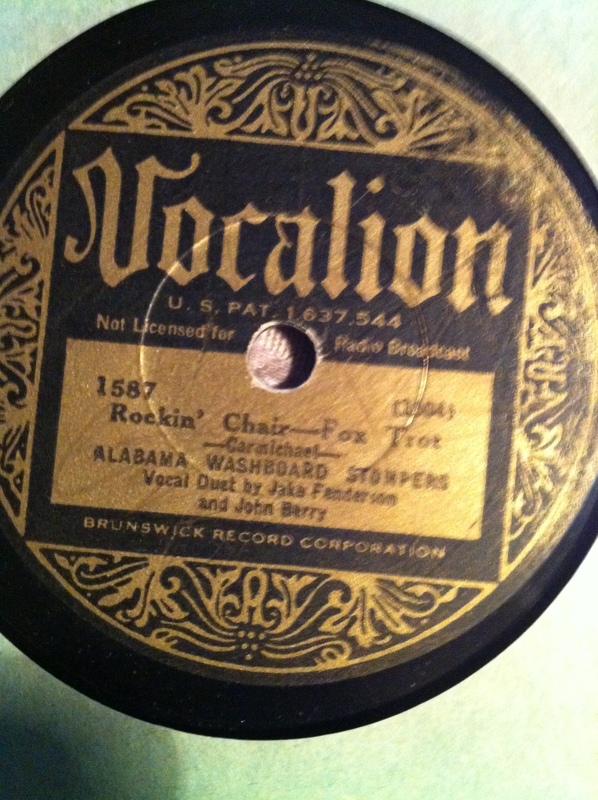 Westphal’s band became popular for its “crisp, clever arrangements and superb musicianship.” Westphal’s musicians included, at various times, Charles Burns and Austyn Edwards (trumpets), Herb Winfield (trombone), Bill and Jack Richards (saxophones), John Jensen (tuba) and Earl Roberts (banjo). 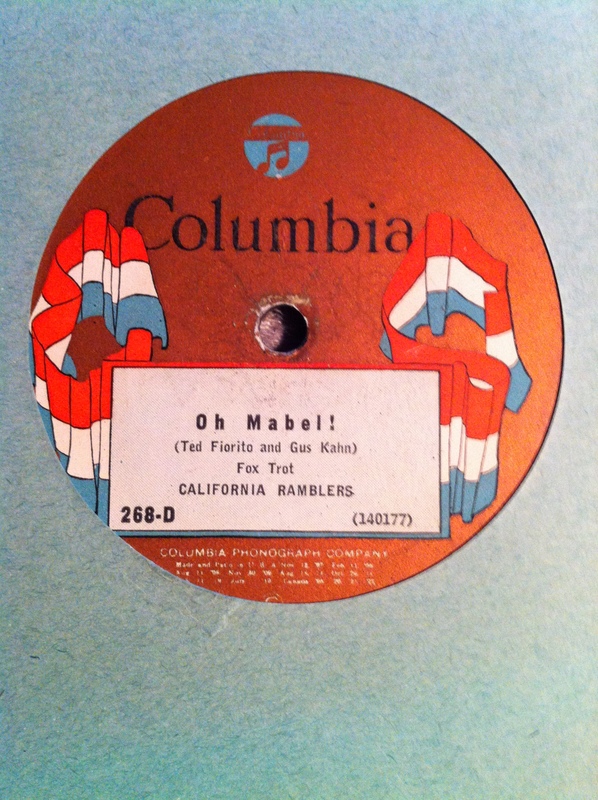 The band recorded in Chicago for Columbia Records regularly between 1922 and 1924, recording over 50 tracks of which 34 were issued. 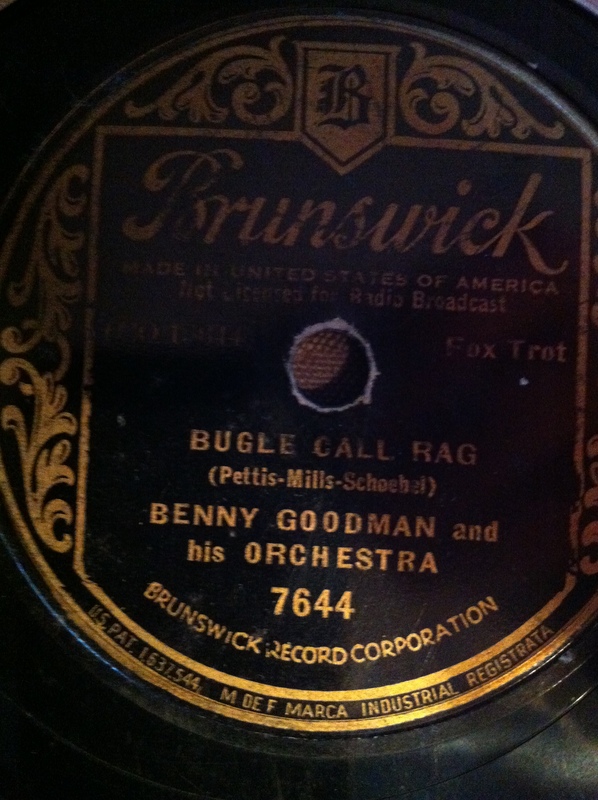 These included “Bugle Call Rag”, “Two Time Dan”, and “Oh! 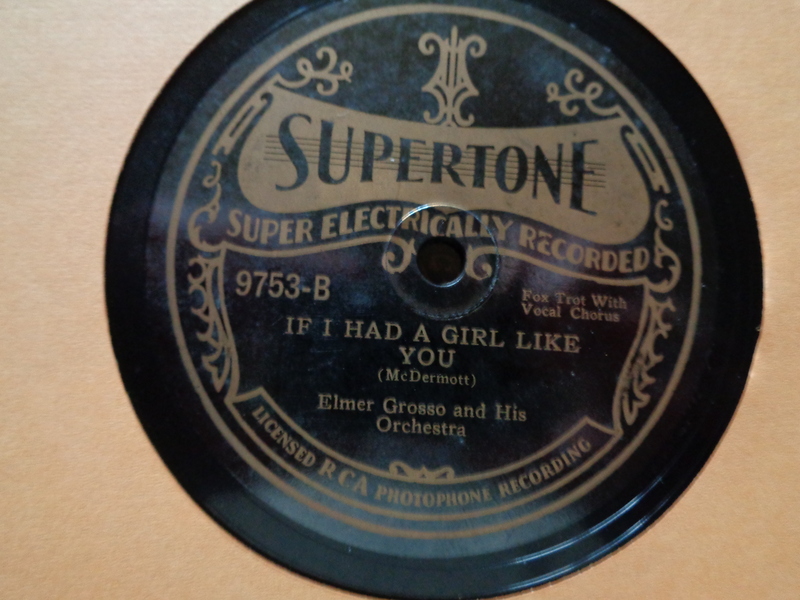 Sister, Ain’t That Hot!”, as well as novelty piano pieces played by Westphal in the style of Zez Confrey and Edward Claypoole such as “Pianola” and “Dusting The Keys”, which are “testimonies to his immense skill at the keyboard”. 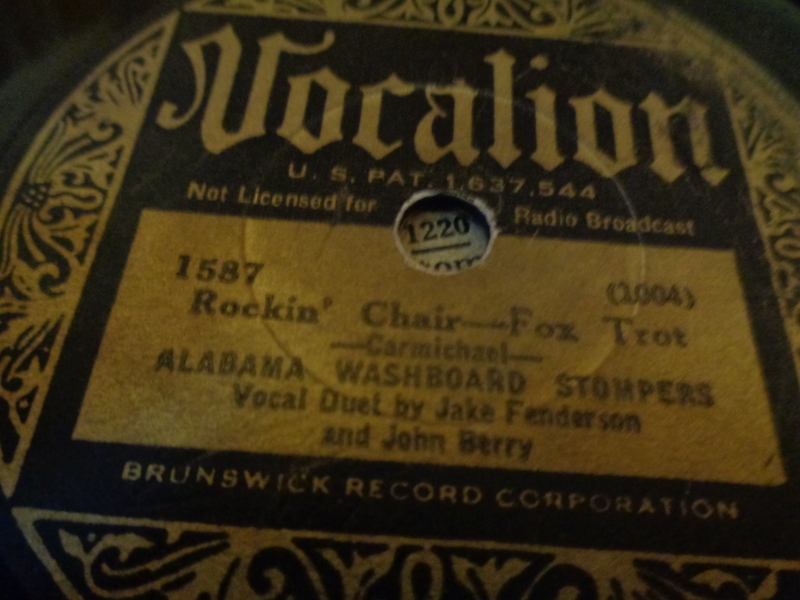 Westphal did not record after 1924. 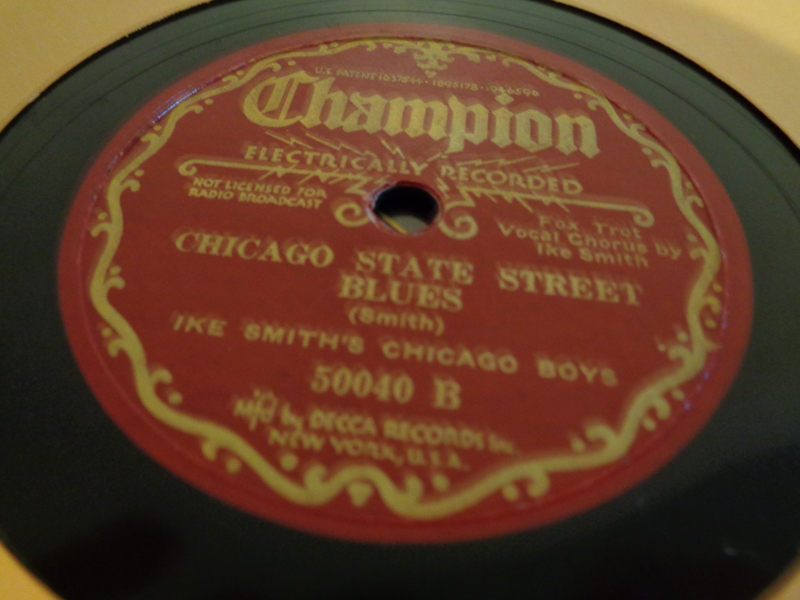 He formed a new band, the All American Pioneers, and became the studio director of radio station WENR in Chicago, where he performed regularly and remained until the 1930’s. 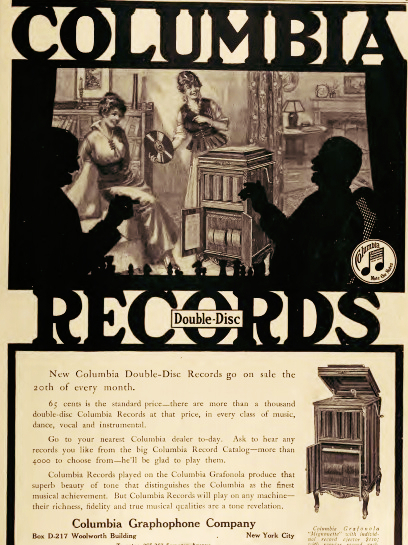 The Columbia Graphophone Company took out this full-page in The New York Theatre in 1913 to announce that it would release new recordings at the beginning of each month, as did Victor. 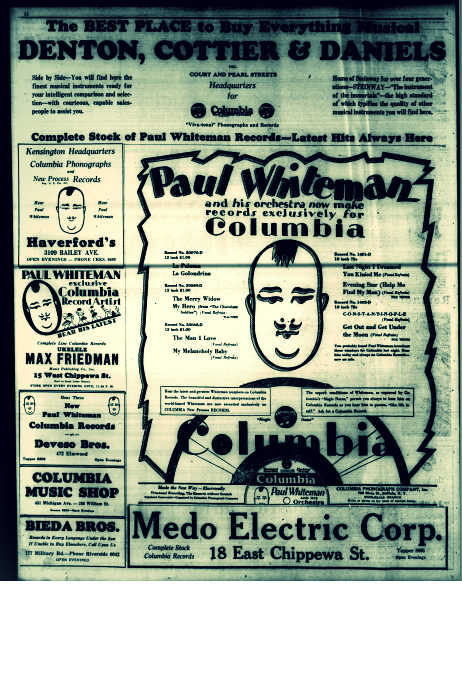 The King of Jazz, Paul Whiteman entered into a new recording contract with Columbia Records in 1928, after a long tenure with Victor, and as a sales gimmick, they introduced the characteristic potato head image of the band leader. To publicize his new 10 inch and 12 inch records, full page ads, such as the one below would appear in the newspapers. 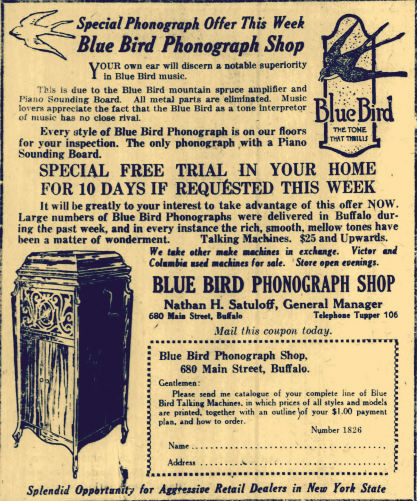 This advertisement for the Blue Bird phonograph was placed in the Buffalo Courier on November 14, 1920. 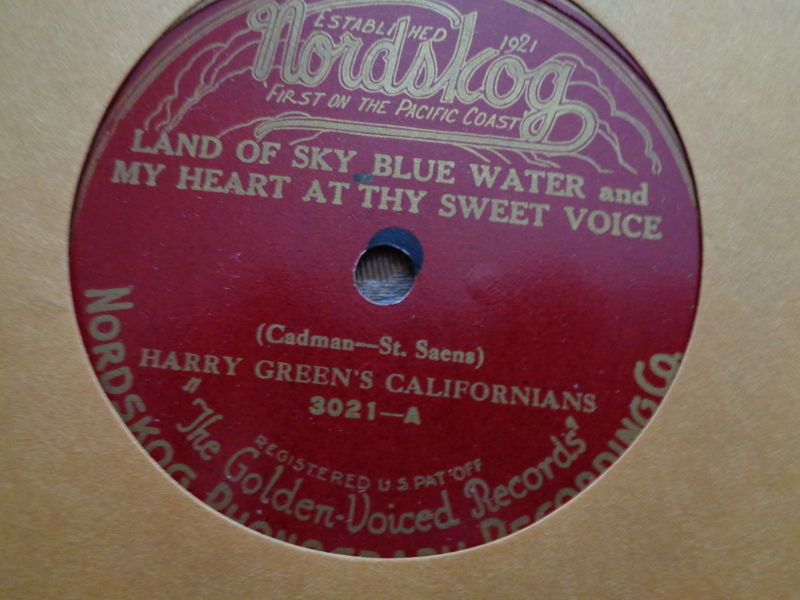 The Blue Bird Phonograph was manufactured that month and year in California. 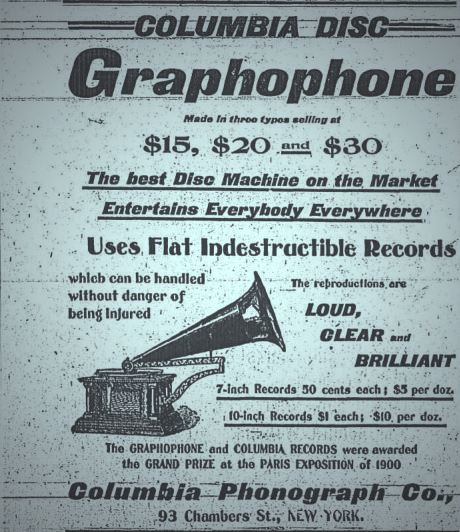 The September 11, 1902 edition of The Munro County Mail, New York, carried this advertisement for a Columbia Graphophone. 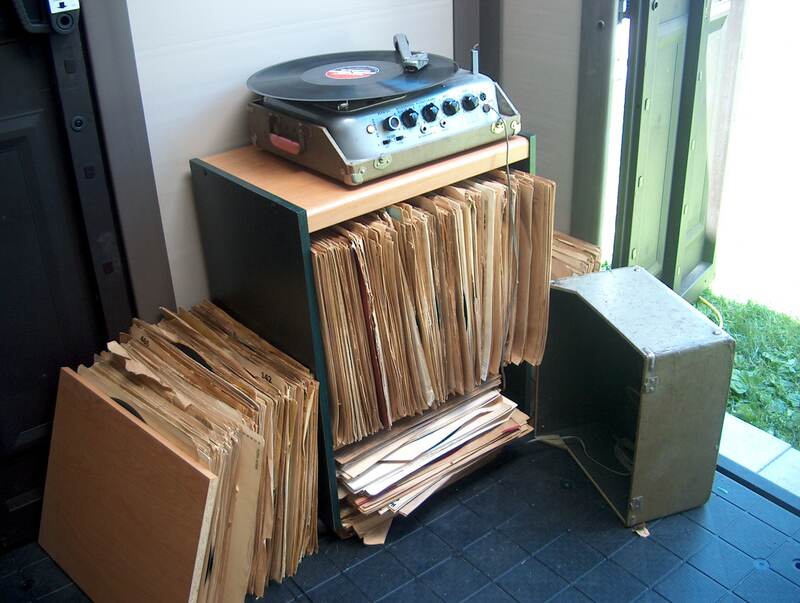 Unless you have lots of money at your fingertips, your record room will seem to be very ordinary. 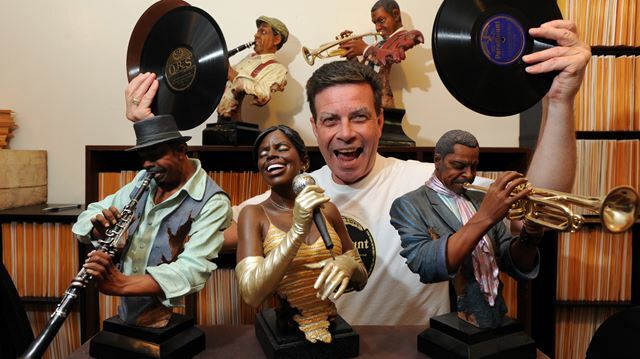 I like to think of it as something else-my own personal venture into the past, like being in an after hours club full of Jazz musicians jamming together. 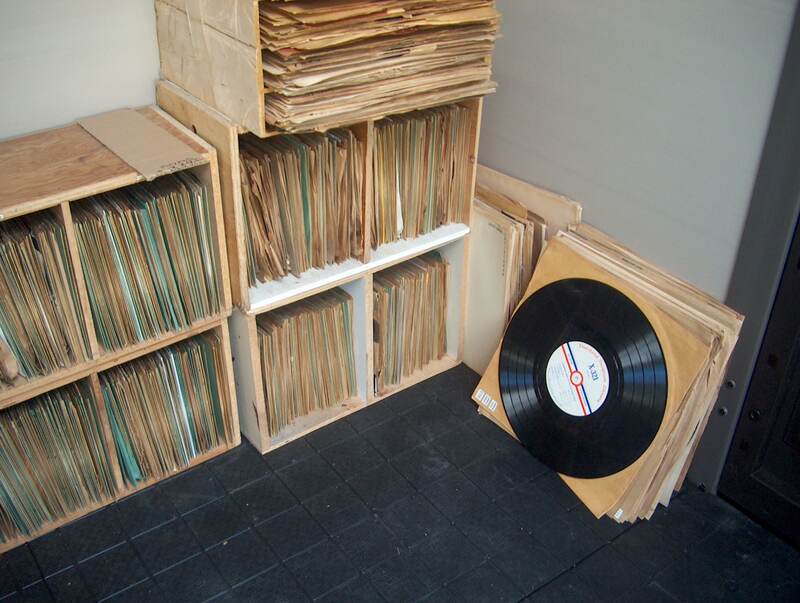 My personal dream, which I hope to become a reality in the near future, is to have framed records hanging on the walls, along with a trombone, saxophone, cornet, trumpet, and clarinet. 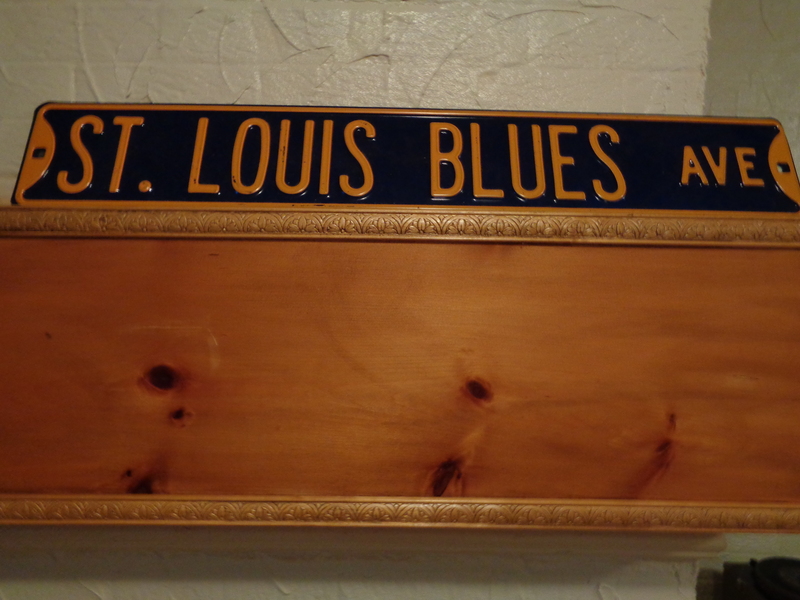 A few street signs that name famous Jazz landmarks in New York, Chicago, and New Orleans, would be a nice touch. 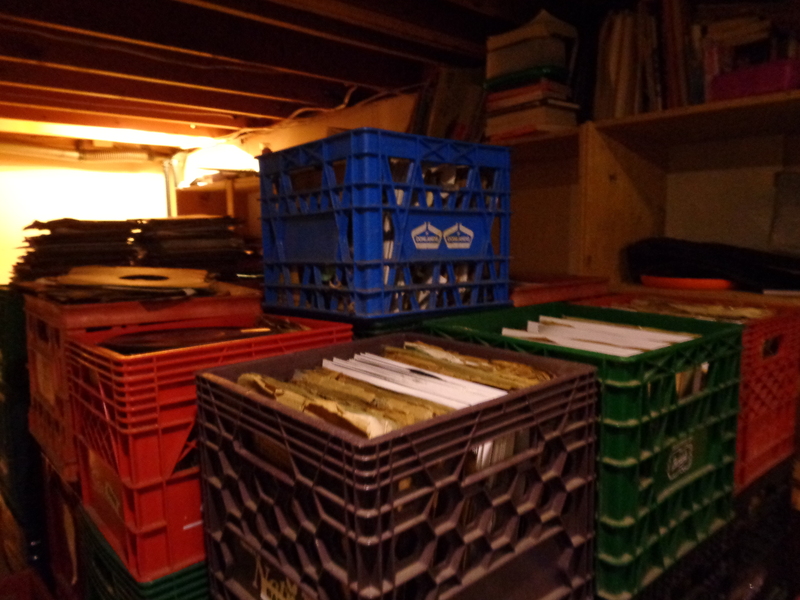 There will be shelving from one end of the room to the next, to hold 30,000 78’s. 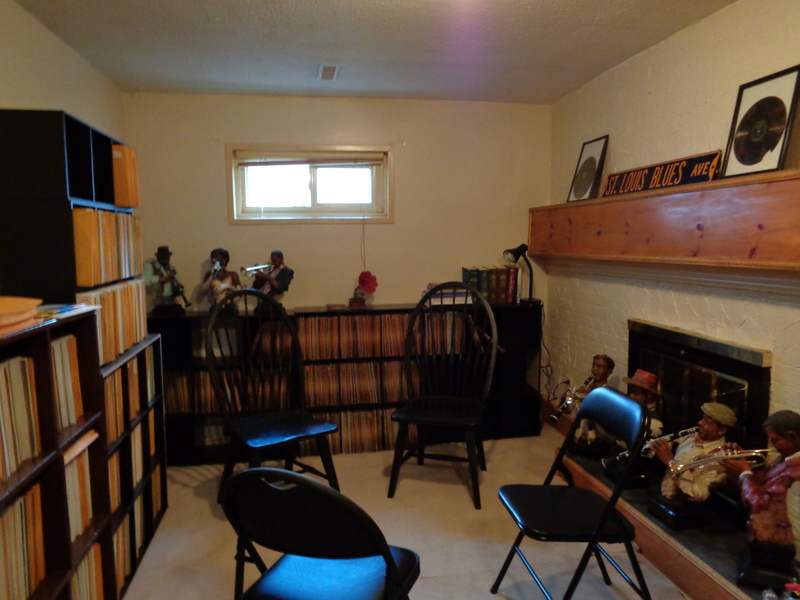 A bookshelf to hold discographies, and reference books will be added, along with chairs and a table, for guests to relax, and enjoy the music. 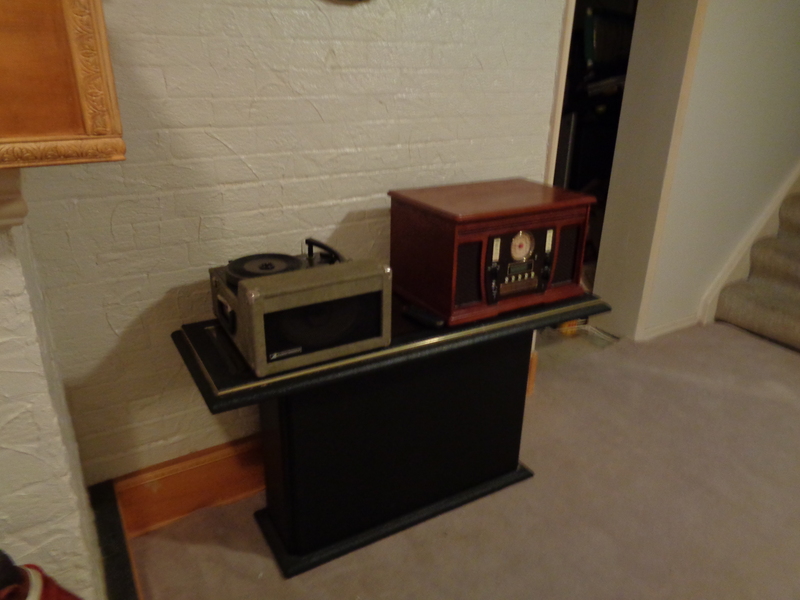 Eventually, I want to acquire a couple of gramophones to make the room look nostalgic. 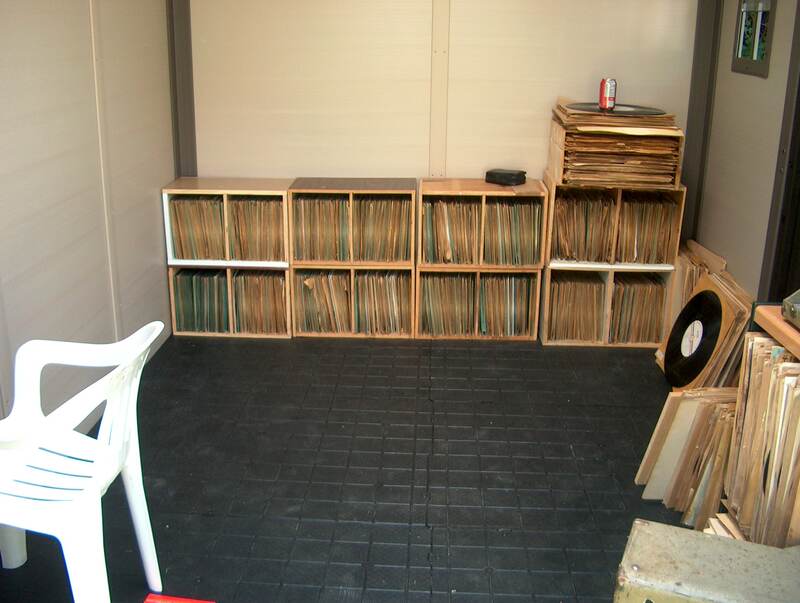 What does your record room look like? Send me your pictures, and details, and I will post them. 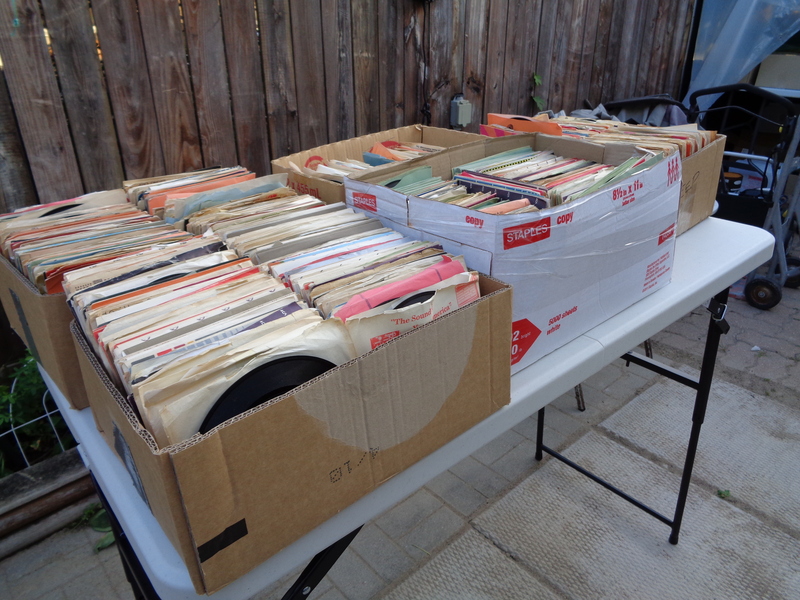 Our good friend, and discographer, Jack Litchfield has just sent me a copy of the minutes of the Canadian Collector’s Congress, held on Saturday, April 26th, in Toronto, Ontario. I would like to share this with our readers, so that they will know what transpired at this meeting. 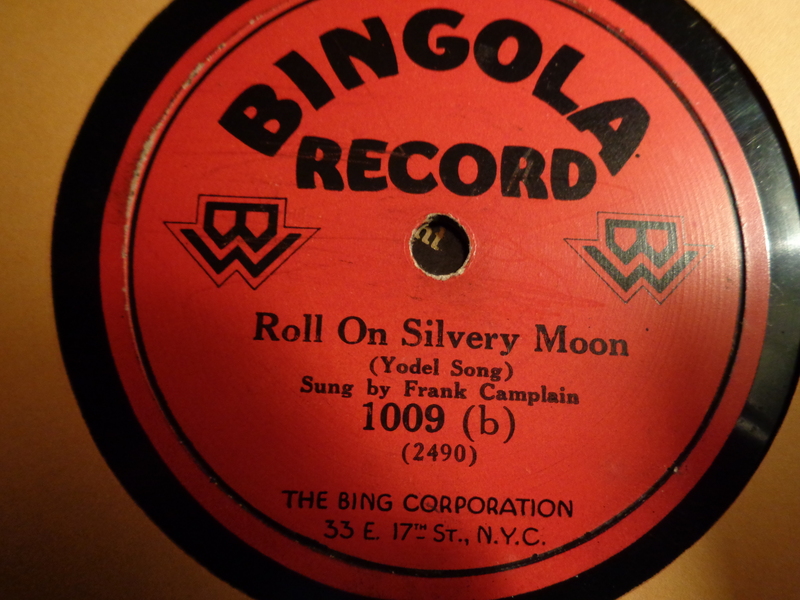 There were many budget record labels during the 1920’s, sold primarily in low cost department stores, or dime stores.The Plaza Music Company had its tried and tested Banner, Regal, Domino, Oriole, and Perfect labels as established names. 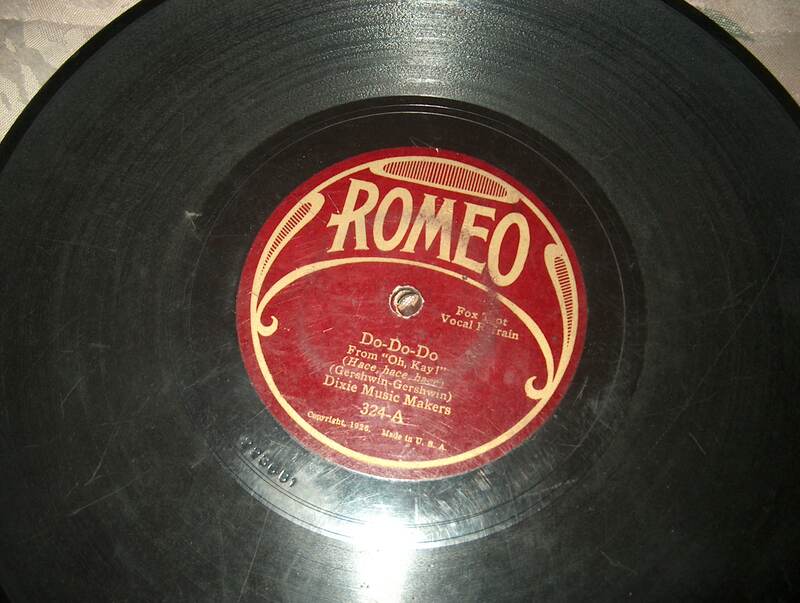 It decided to launch another label in 1927 under the name “Jewel”, perhaps to compete with Cameo’s “Romeo” record line, which was introduced the year before. 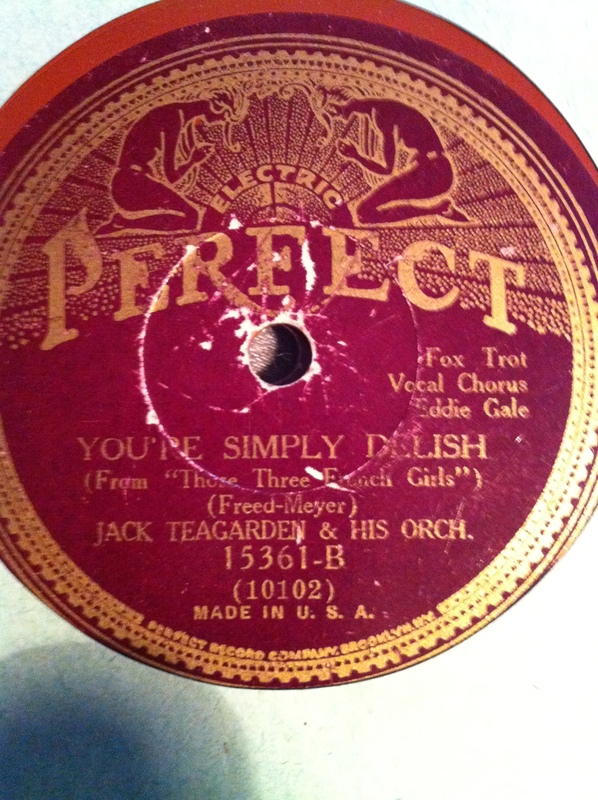 This rare ad for the Jewel label came from the department store of Victor and Company, Buffalo, New York. 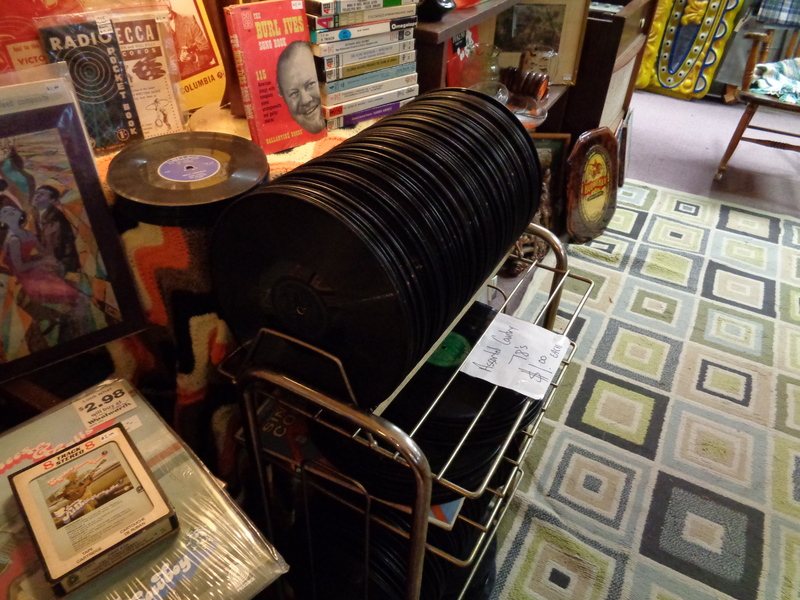 It often advertised the records at 21 cents each, or 5 for $1.00. 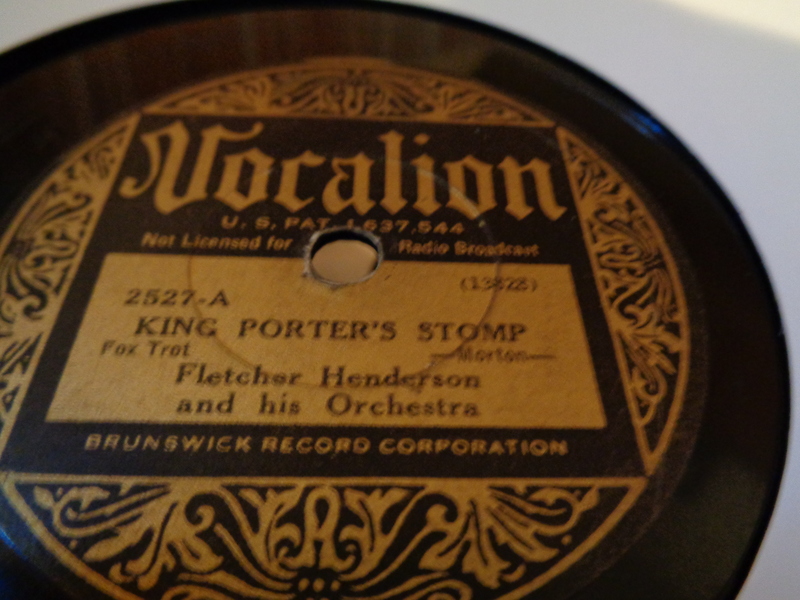 It is always nice to turn up a page in a newspaper where a promotion for a recording occurs by the company that will turn out the 78 rpm record. 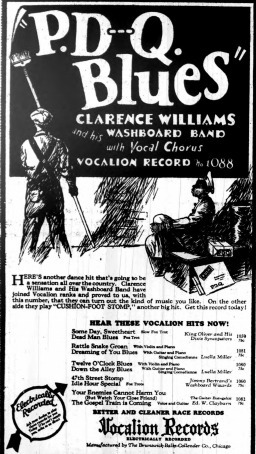 The artwork behind some of these ads is quite good, and I thought about sharing this one for Clarence Williams Washboard Band, for the Vocalion race series, picked from the April 23, 1927 edition of The Pittsburgh Courier. 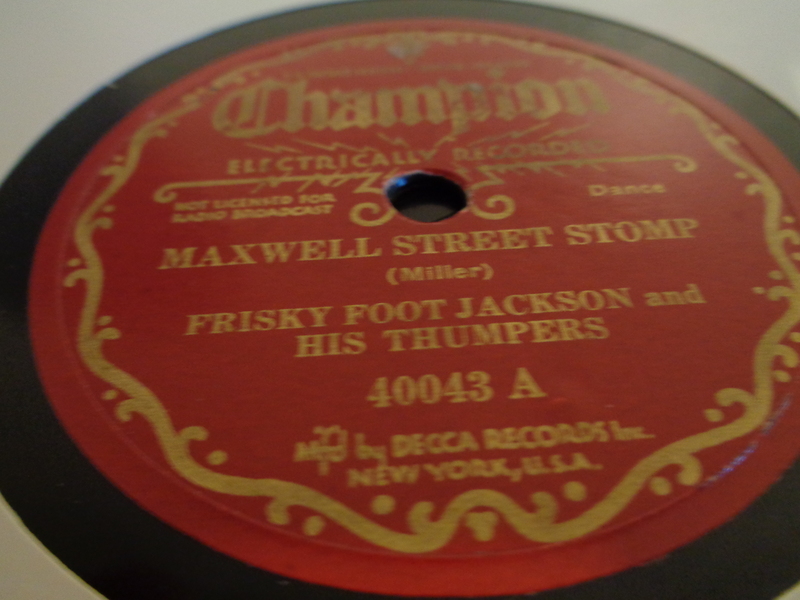 Champion records in the 1920’s were derived from Gennett masters, and priced to sell as a budget label. 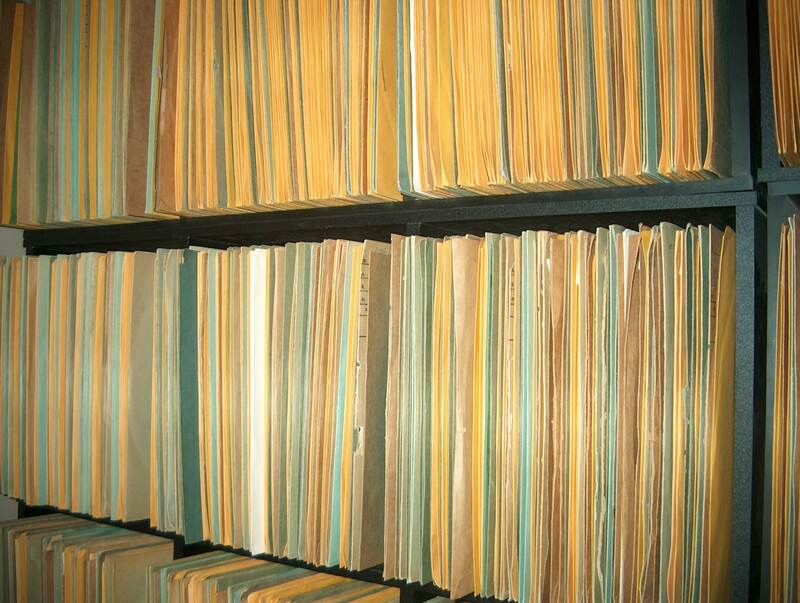 The department store of Lit Brothers, situated in Philadelphia, PA., announced the latest Champion records that they were stocking, in the April 10, 1926 edition of the Philadelphia Inquirer. 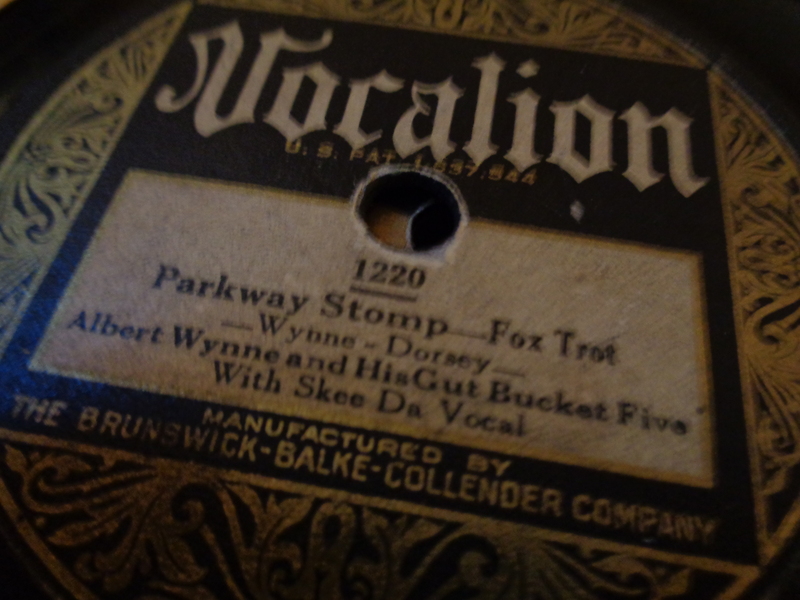 On March 19th, I uploaded some photographs from my personal 78 RPM record collection. 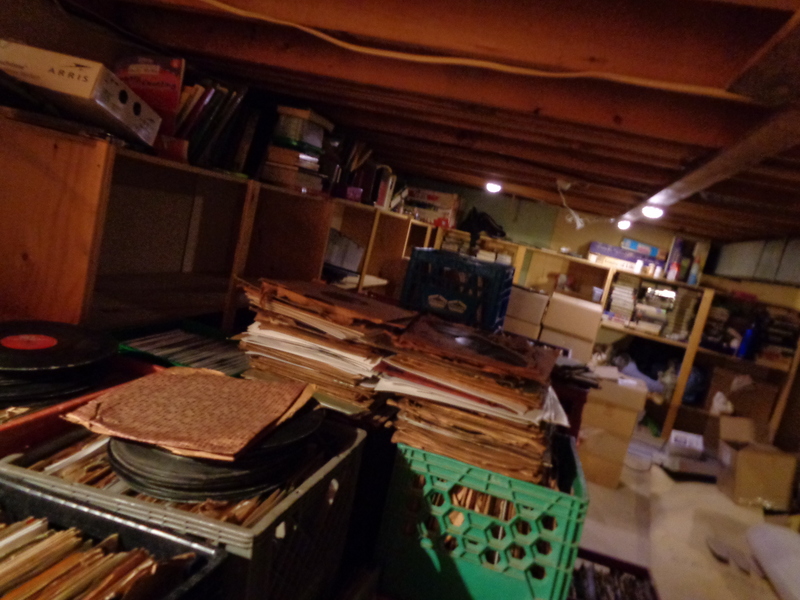 Today, I invite you to take a second look at some of the records I have acquired over the past few years. 6. Microphone 22544 How Could Red Riding Hood? 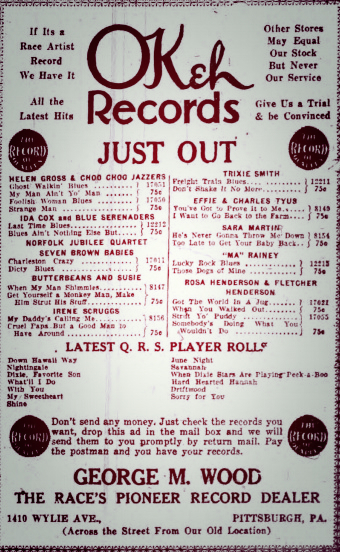 At first glance one would think this is just an advertisement for Okeh Race Records because of the banner at the top. 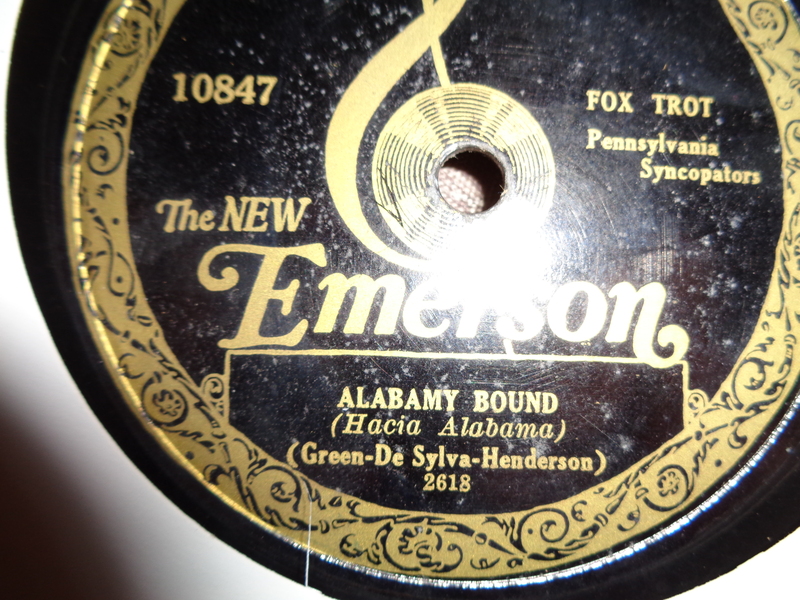 But once you see names like Helen Gross and the Choo Choo Jazzers, ( with a 17000 catalogue number) appear, you know you’ve stumbled upon a rare find. 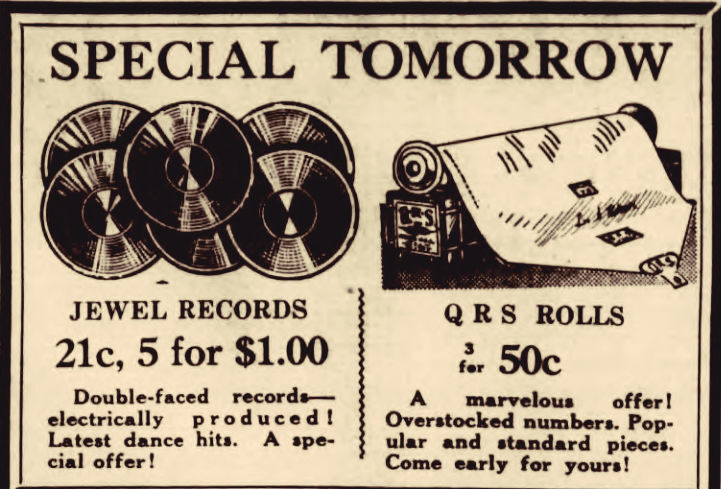 The George M. Wood record store of Pittsburgh claimed to be a pioneer in dealing with race records, and sponsored this advertisement, found in the September 6, 1924 Pittsburgh Courier. 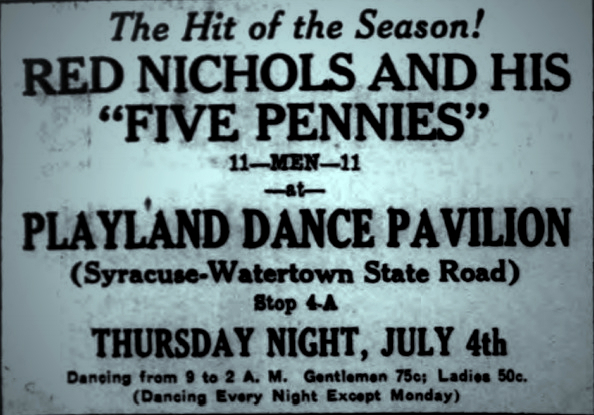 According to the July 3, 1929 edition of the Syracuse New York Journal, Red Nichols and his Five Pennies, were booked for an engagement at the Playland Dance Pavilion for Independence Day. 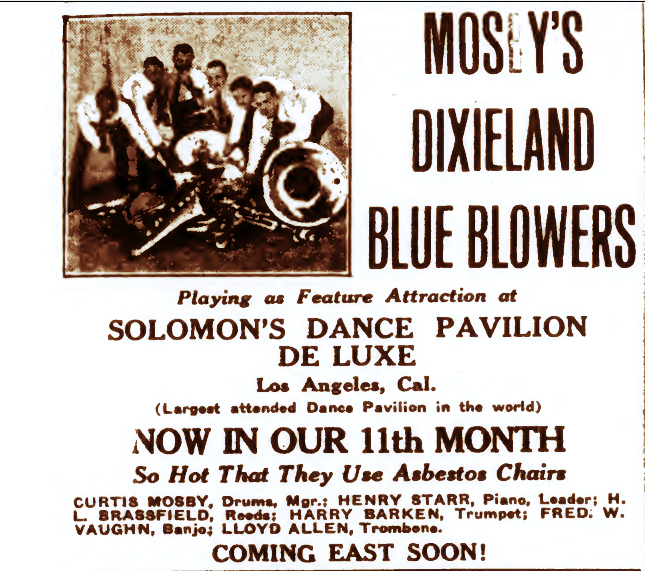 Curtis Mosby led a busy life as a promoter, drummer, bandleader and club owner, during the 1920’s in California. 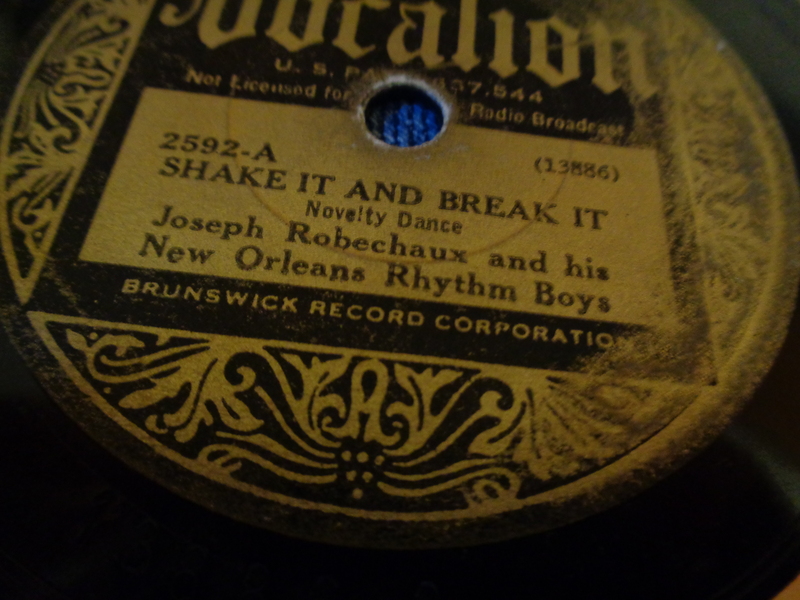 He had his own band in 1921 and also recorded with Mamie Smith’s Jazz Hounds between 1922 and 1923. He moved to Los Angles from Oakland, California. 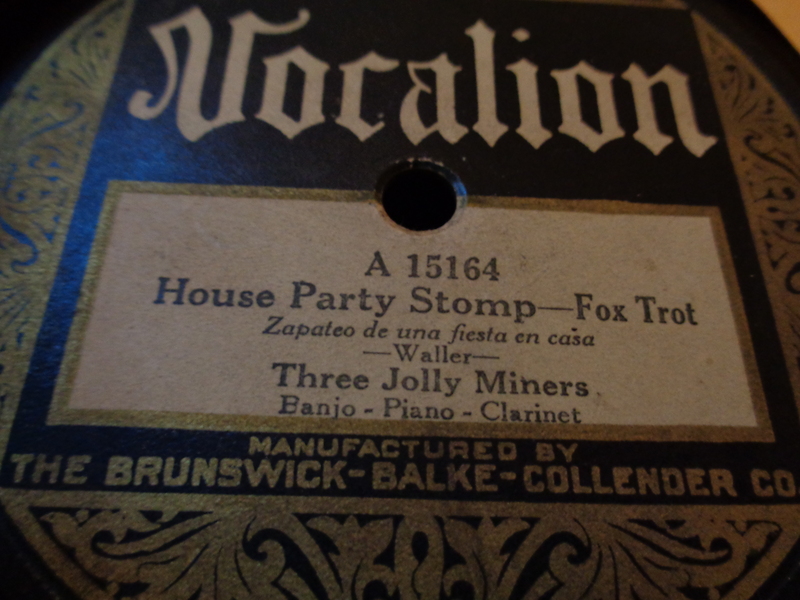 He is known to have recorded later for Columbia, between 1927 and 1929. 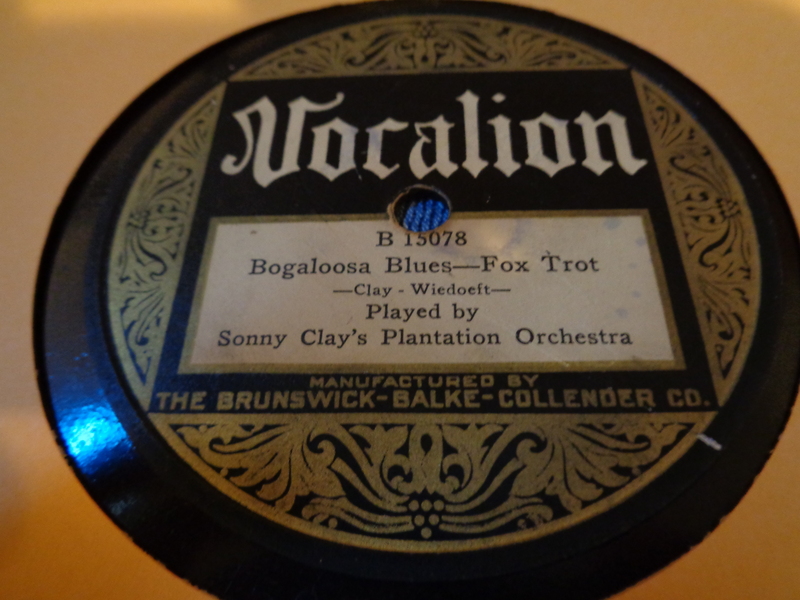 The promotion for his appearance at Solomon’s Dance Pavilion was placed in the September 9, 1925 edition of Variety. 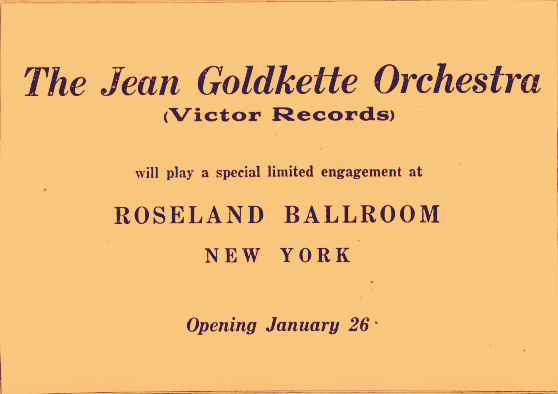 Variety announced that the Goldkette Orchestra would be appearing at New York’s Roseland Ballroom on January 26, 1926. Two days later, on January 28th, they would be in the Victor studios in New York City recording “Dinah” and “After I Say I’m Sorry”. 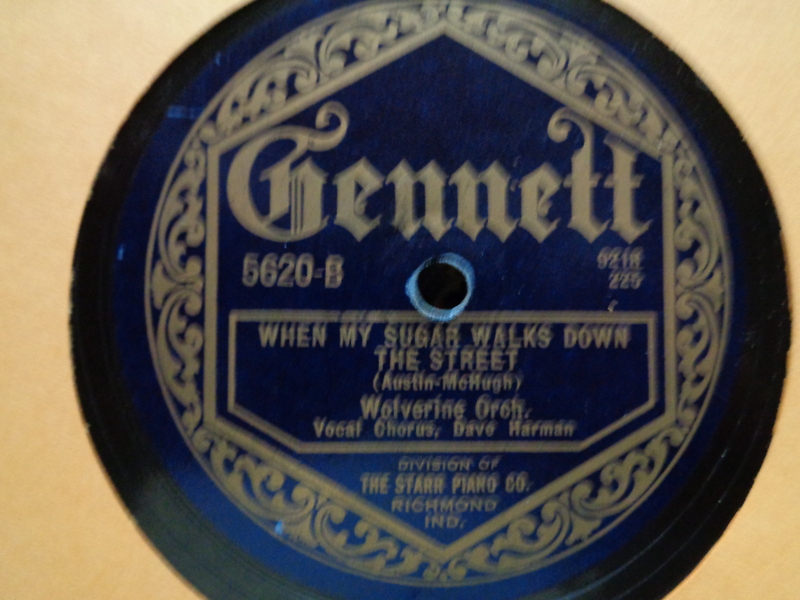 The Goldkette Orchestra consisted of Doc Ryker-Jimmy Dorsey-cl-as, Don Murray-cl-ts, Joe Venuti-vn, Chauncey Morehouse-d, Russ Morgan-a, Fuzzy Farrar-Ray Lodwig-t, Spiegle Wilcox-Bill Rank-tb, Lou Longo-p, Howdy Quicksell-bj, Steve Brown-sb, and Frank Bessinger-v. Bix Beiderbecke does not record with the Goldkette Orchestra until October 12, 1926. 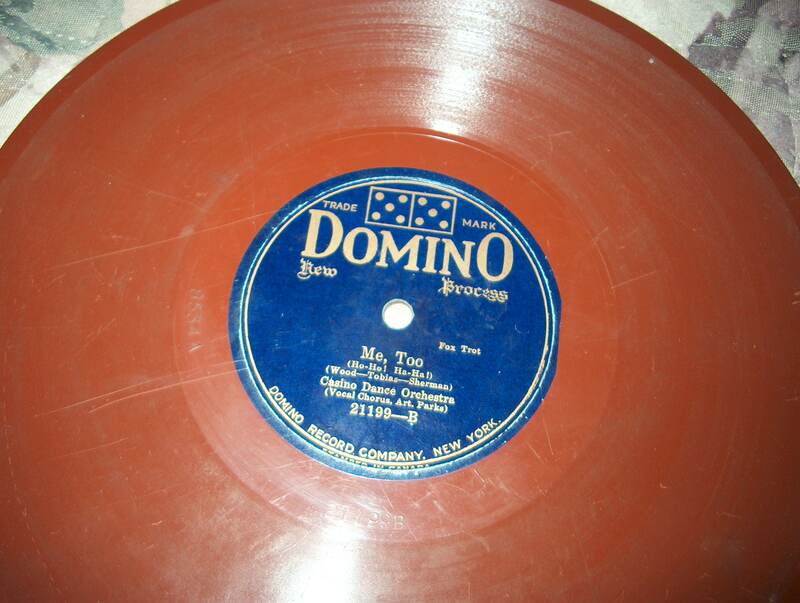 The American Crown label started in 1930 as a result of Plaza’s exclusion from the newly formed American Record Corporation. 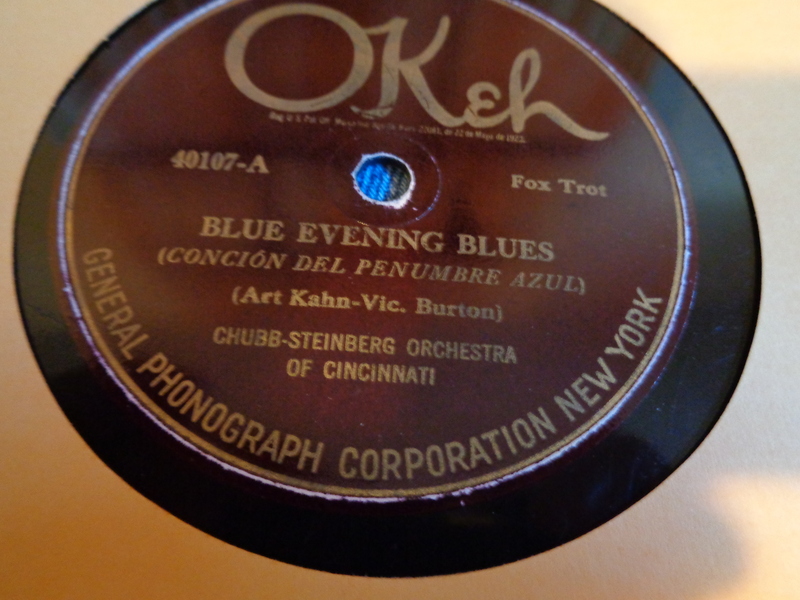 This budget label sold in the stores for a mere 25 cents, and often studio groups recorded on this label, including Lou Gold and Adrian Schubert’s Orchestra. 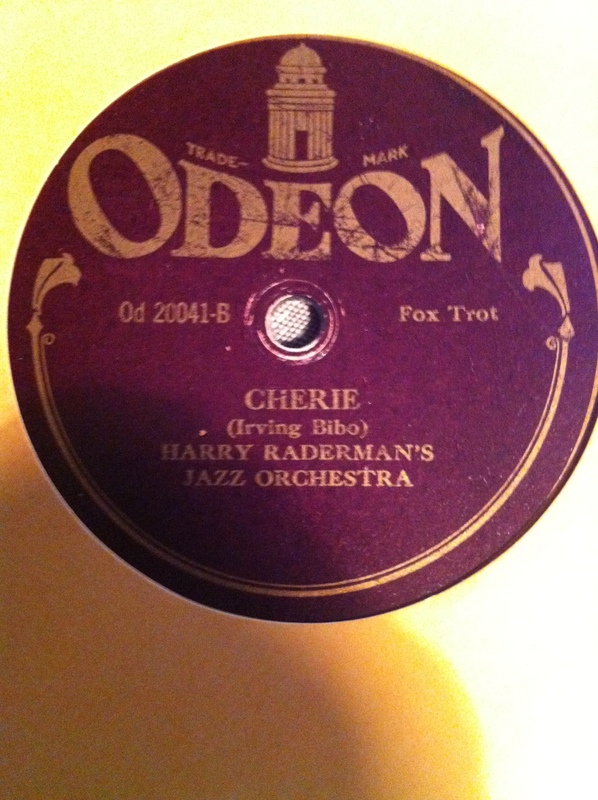 Some of the more sought after names that Jazz collector’s tend to look for on this label included Gil Rodin’s Orchestra, Fletcher Henderson’s Connie’s Inn Orchestra, and, Gene Kardos as Joel Shaw. 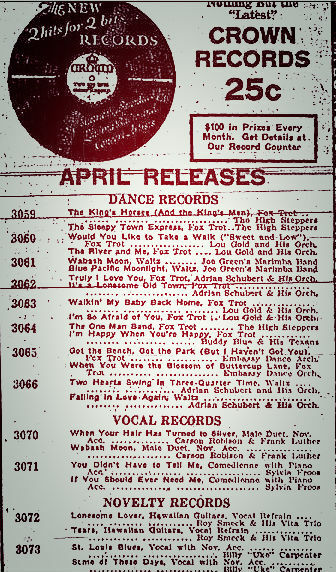 The March 30, 1931 issue of the Amsterdam Daily Democrat and Recorder, Amsterdam, New York carried a rare insert for the release of Crown Records for April. 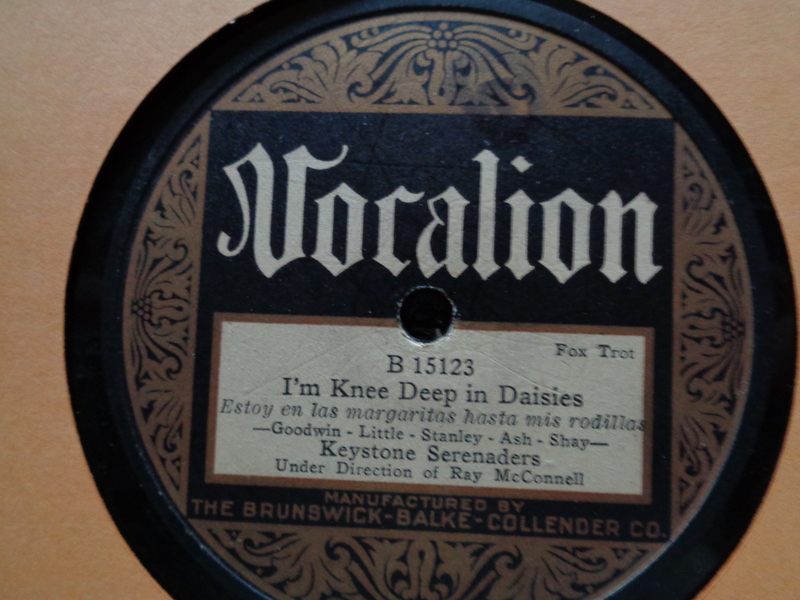 Kurt Nauck's 78 RPM Auction Auction held twice a year with a big catalogue of records sent to collectors. 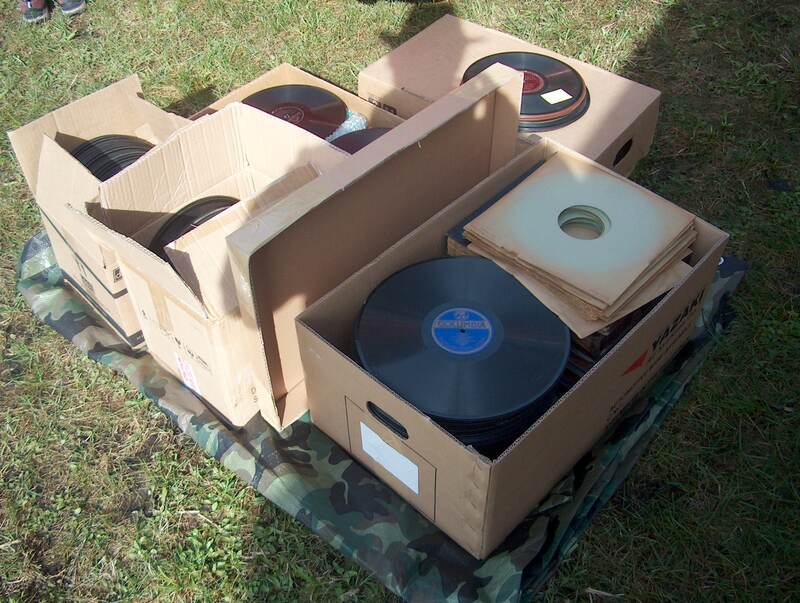 Mark Berresford Rare Records Auction of 78’s held three times a year. 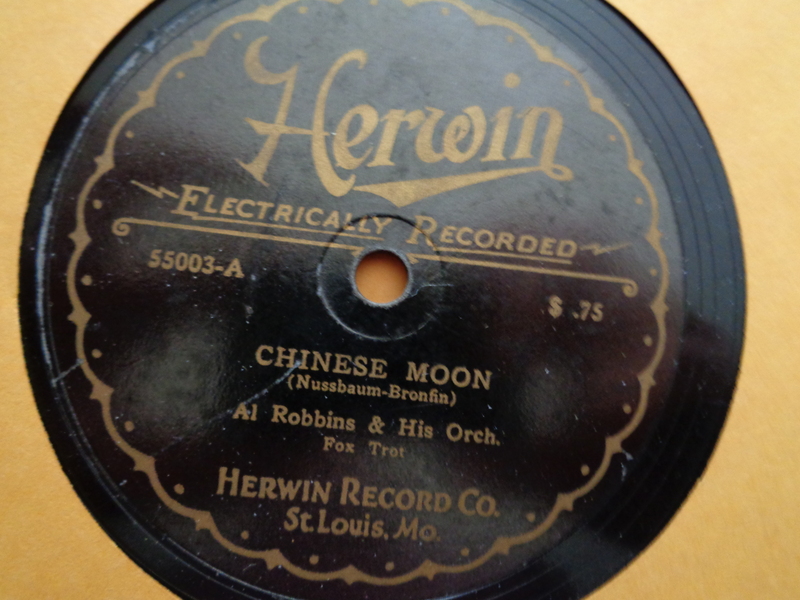 Warren Hick's Records for Collector's One of the oldest surviving auction’s around. Ceintsdebakelite.com European 78 Blog Site. 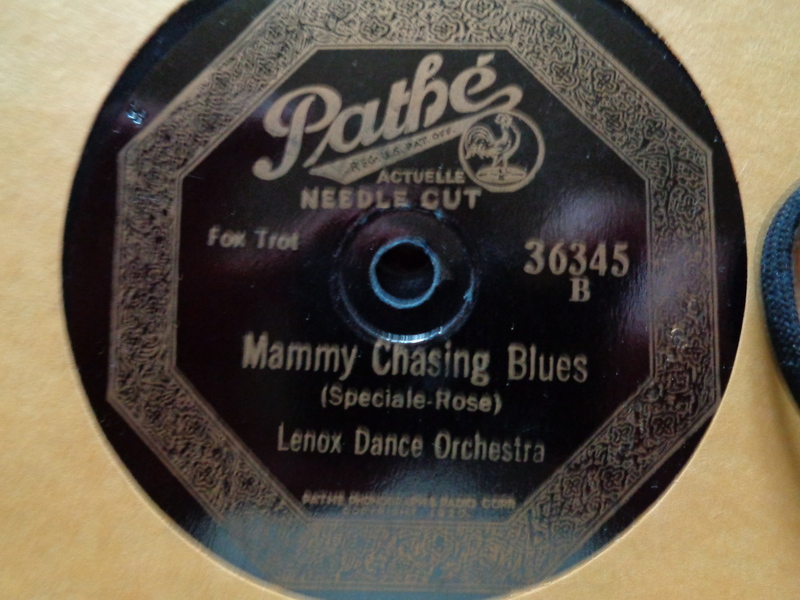 On This Day In Music In Jazz Age Music Anything musically related to the Jazz Age! 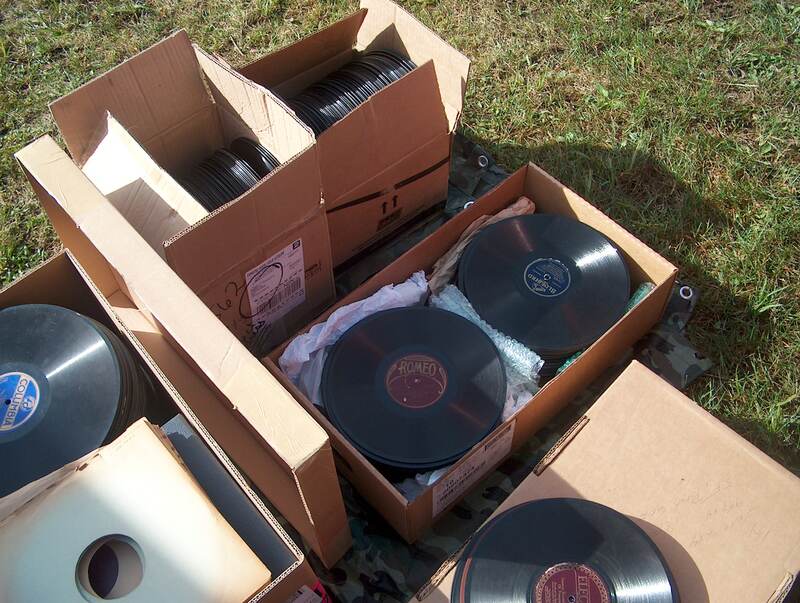 Paul Solarski's E-Bay Store Good selection of 78’s auctioned and sold. 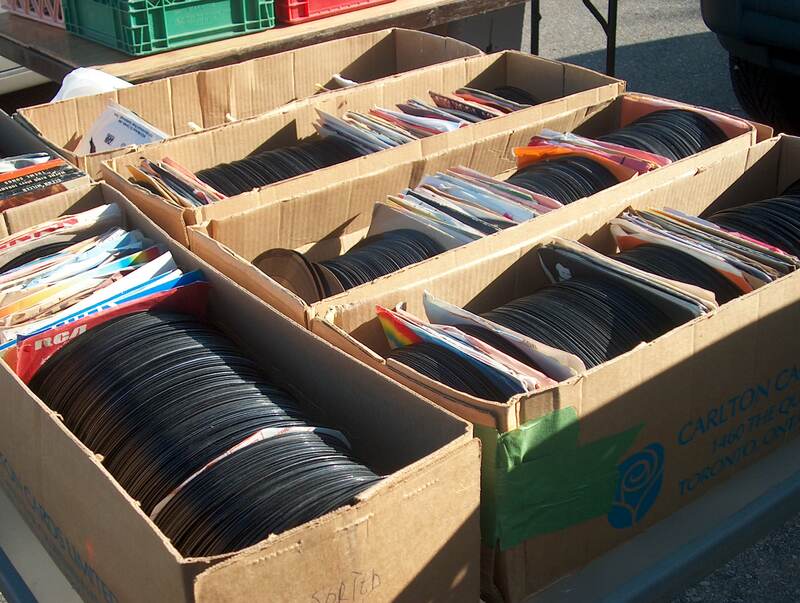 Sunsetlines Store Another recommended E-Bay seller of 78’s. 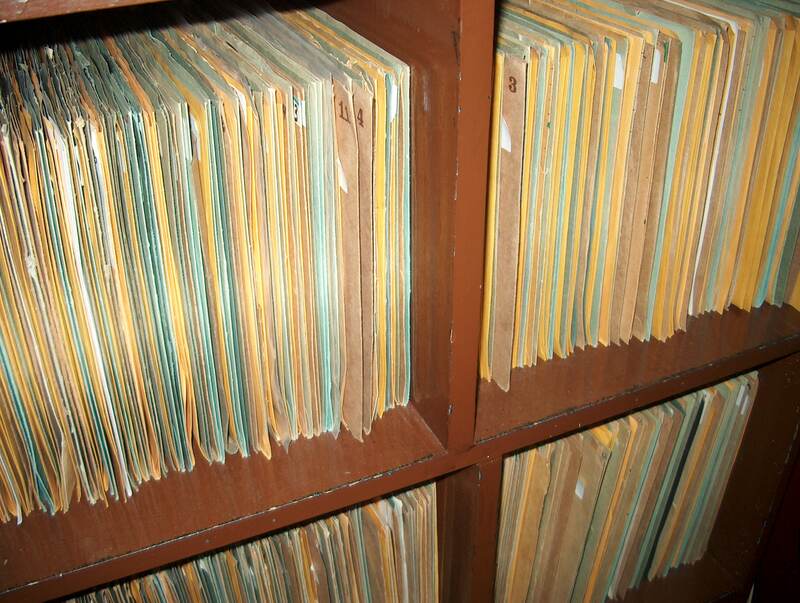 78 Discography This site contains a complete 78 rpm label discography. 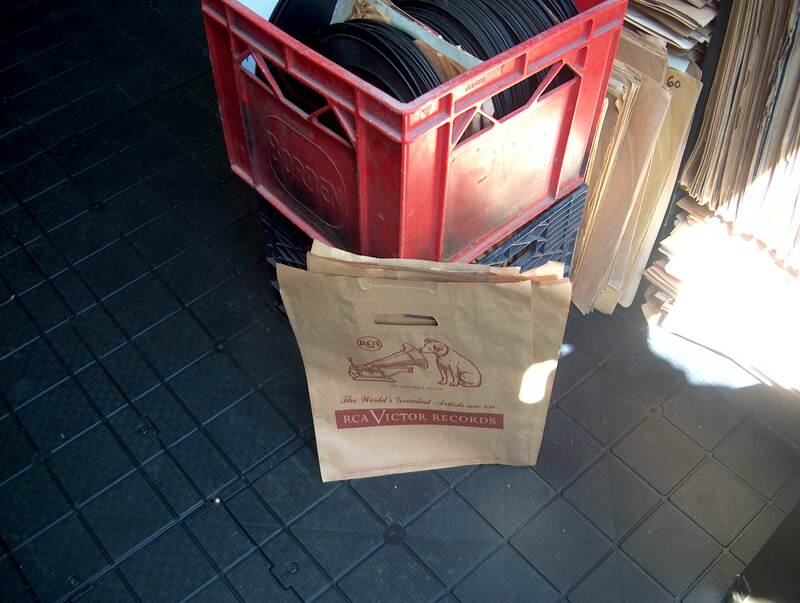 Bags Unlimited Sleeves, Boxes, Shipping Material, Record Storage Units, etc. 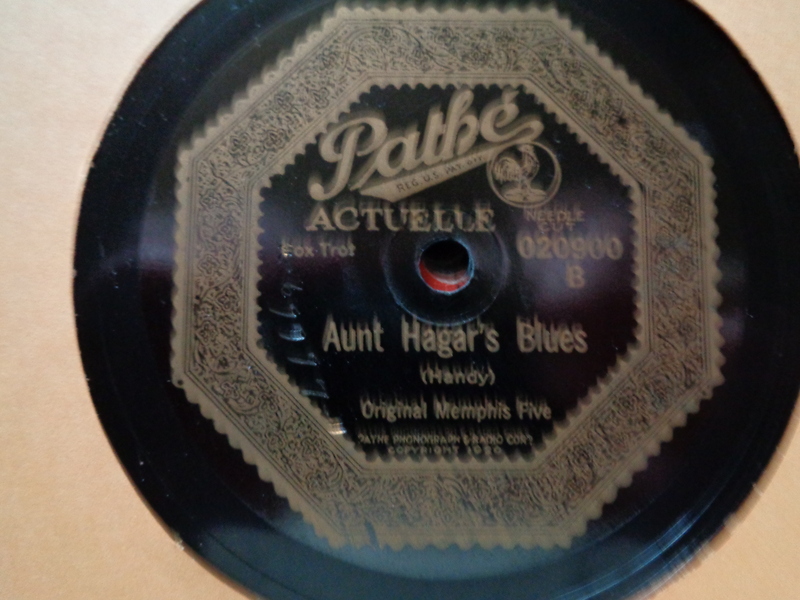 Red Hot Jazz Archive This site deals with Jazz pre WWII and is filled with information. 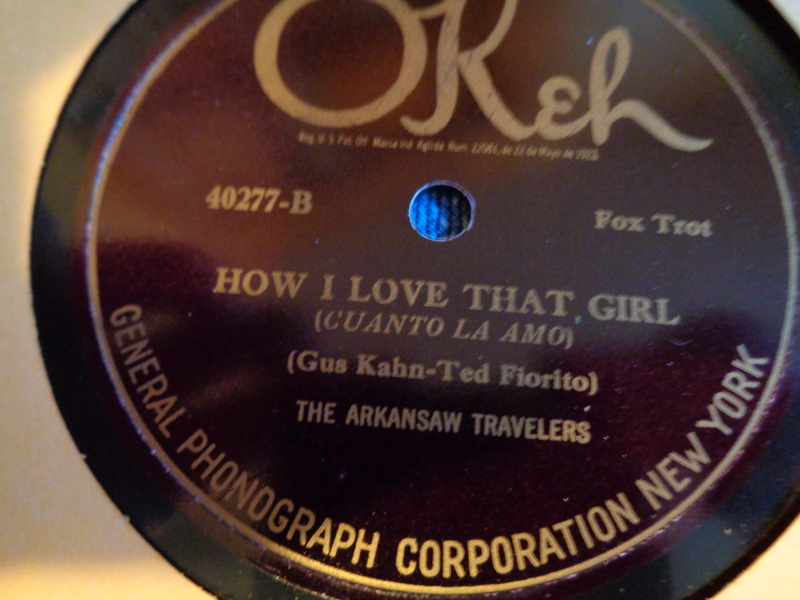 The 78 RPM Community This site offers the collector a place to discuss collecting, post sound files, video’s and photograhs.